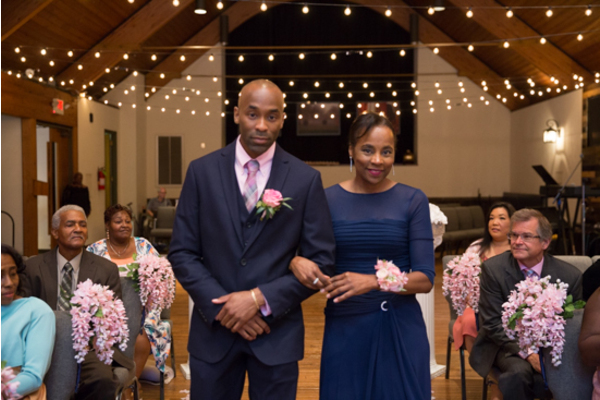 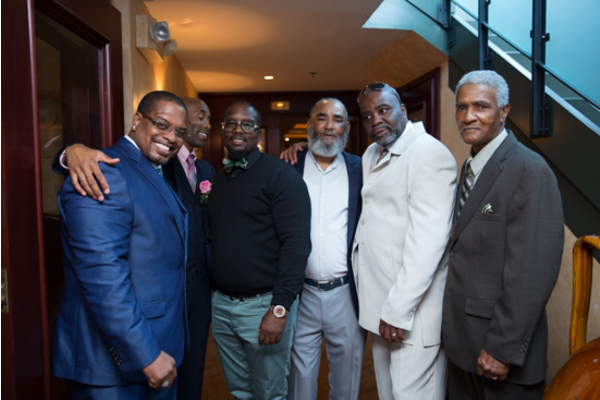 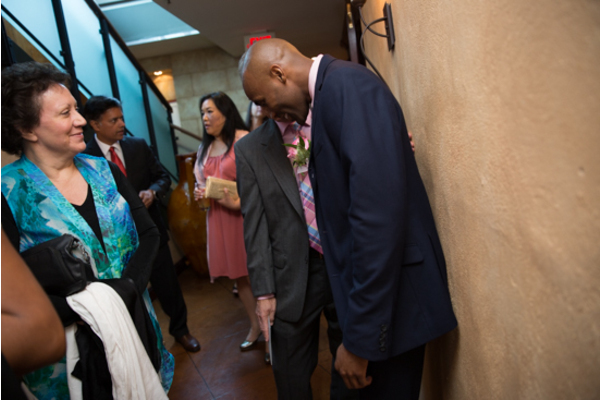 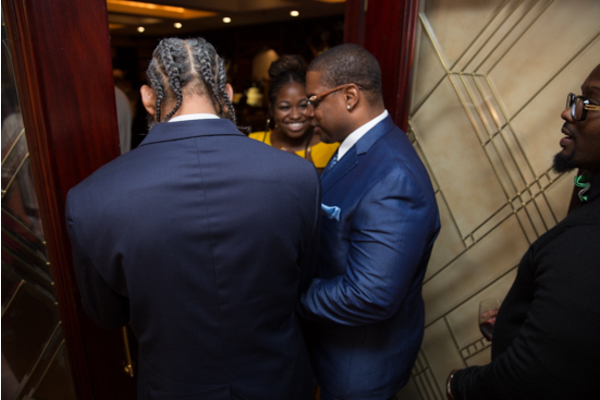 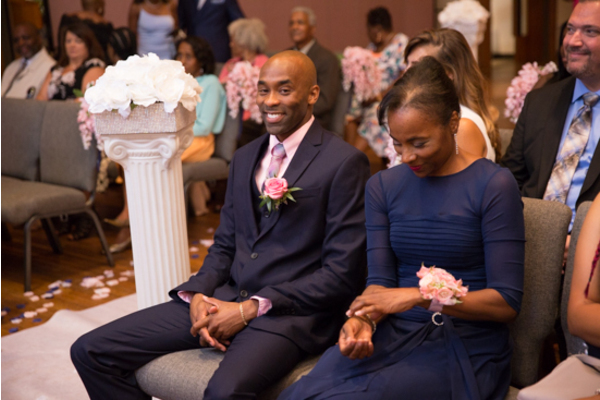 Congratulations to Tee and Hubert on their marriage! 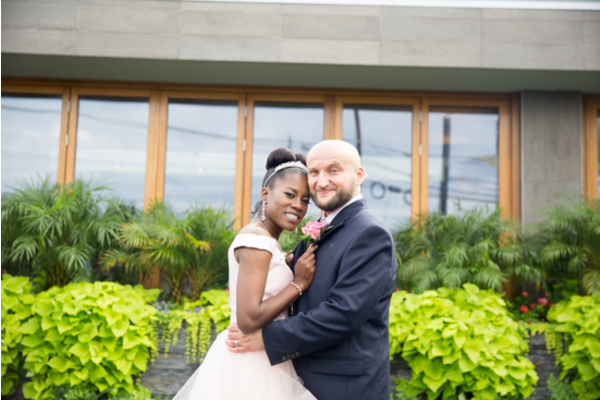 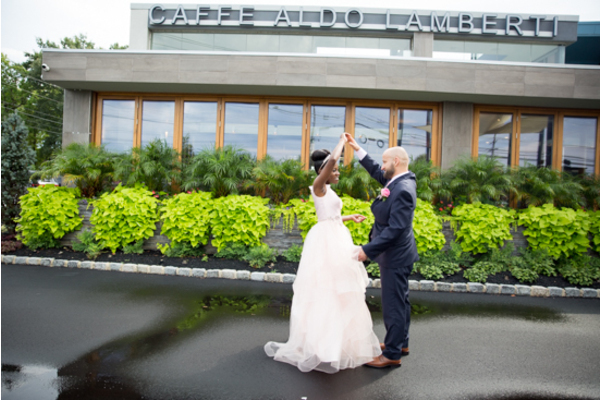 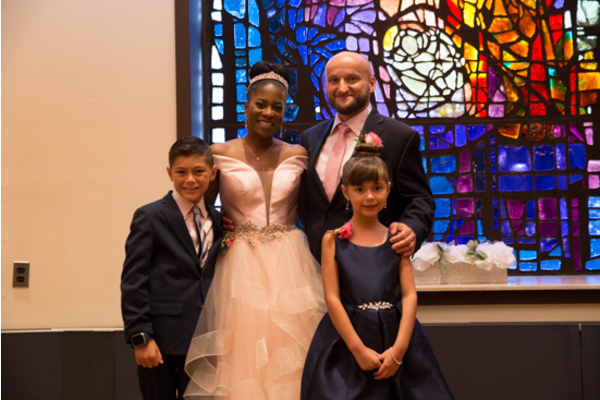 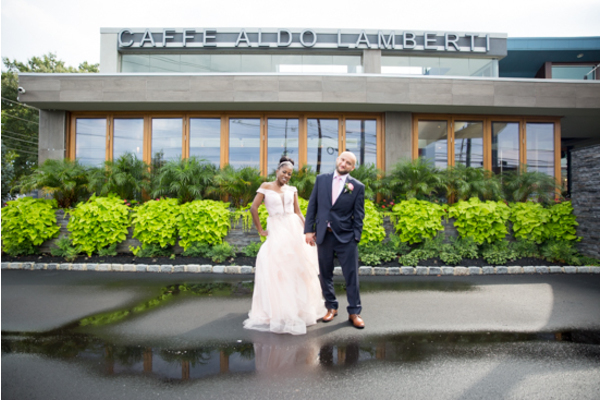 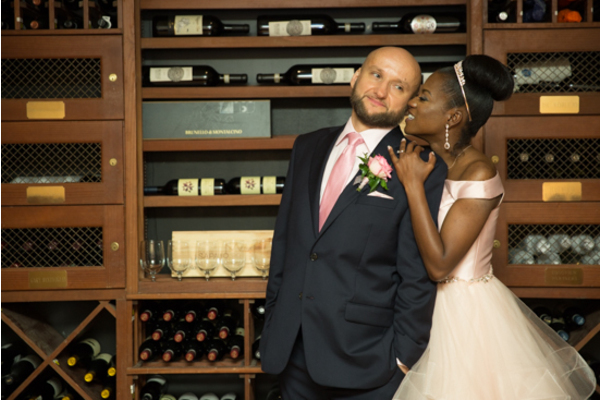 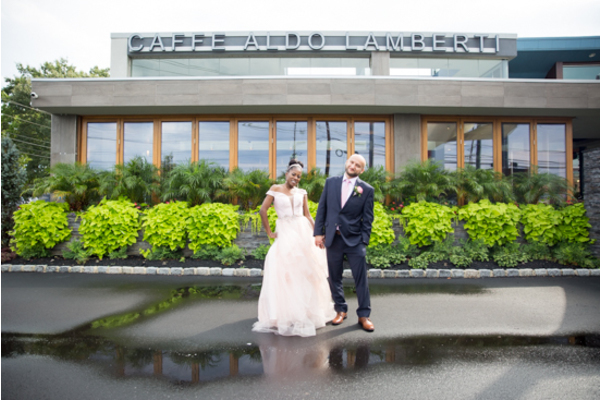 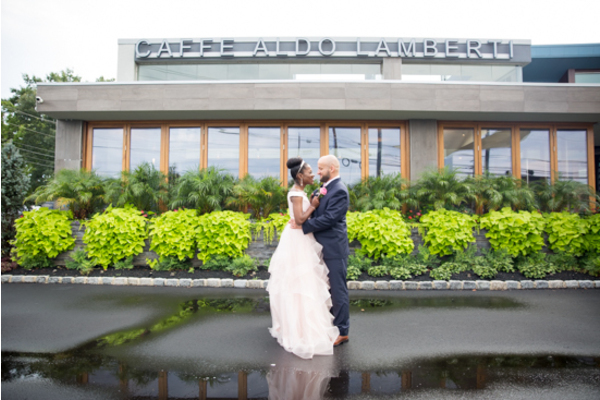 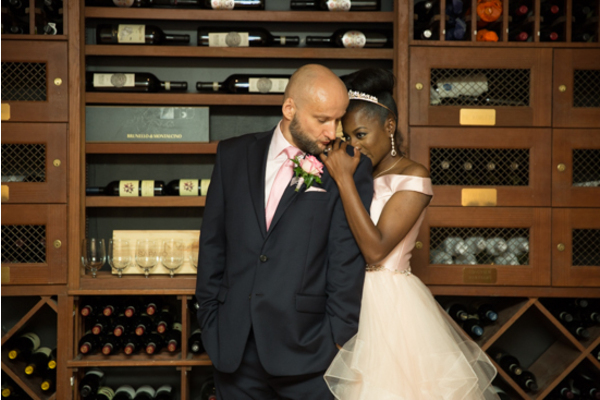 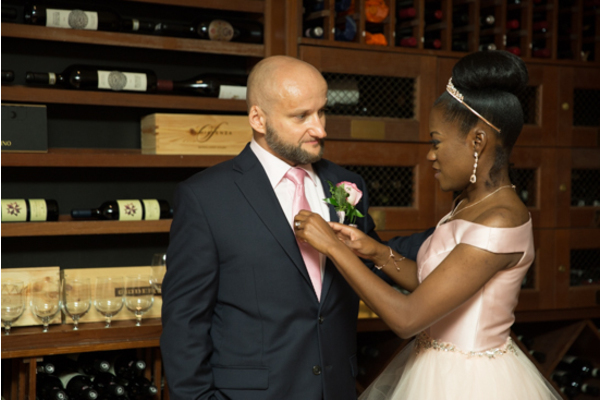 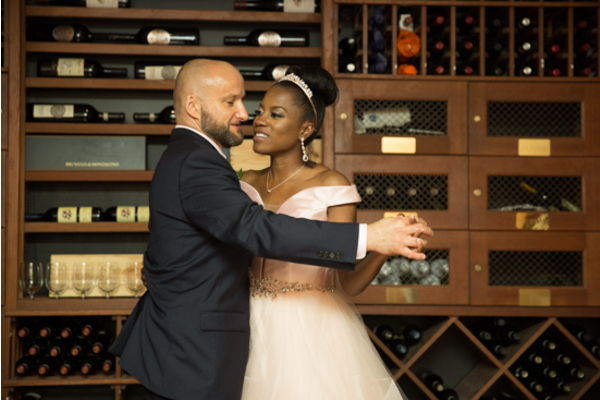 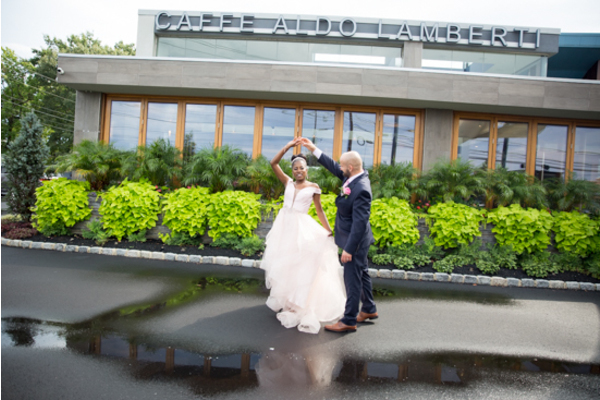 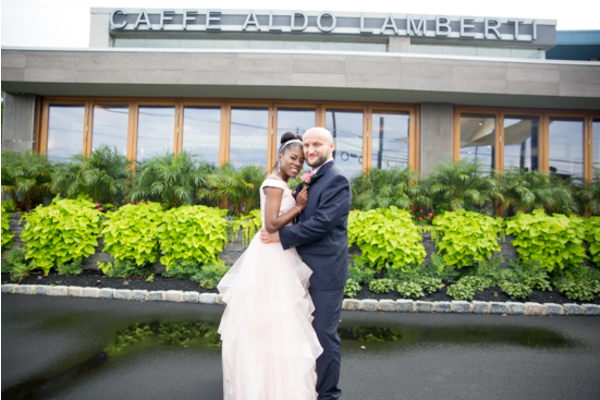 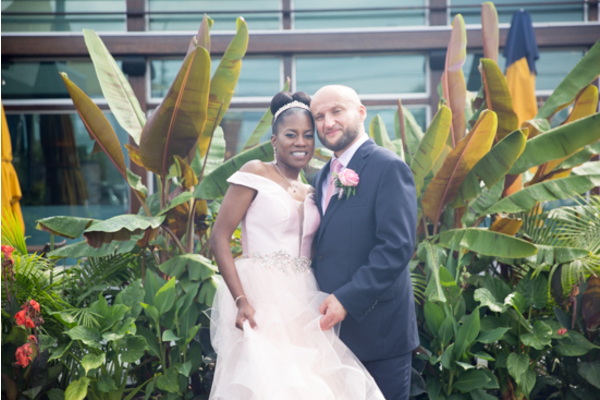 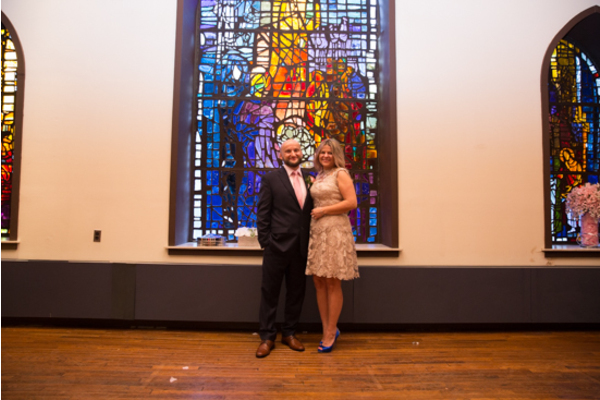 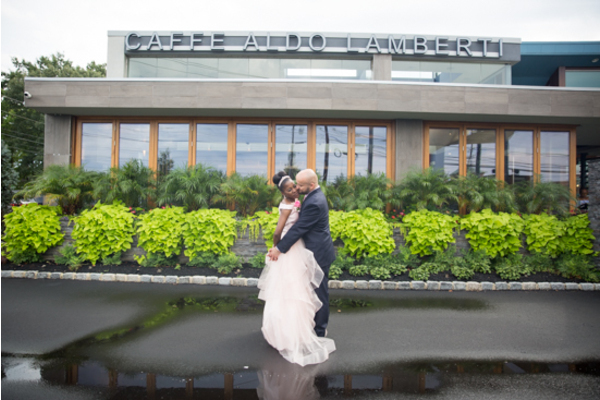 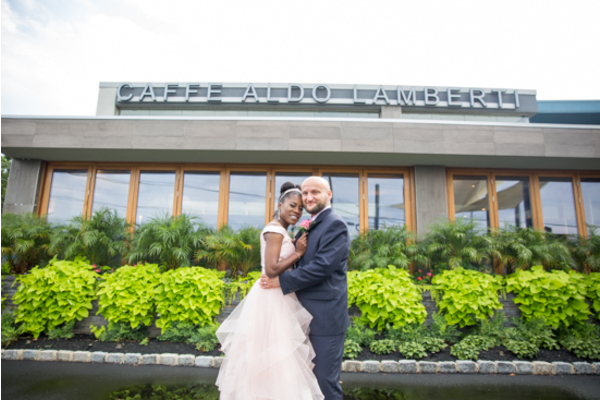 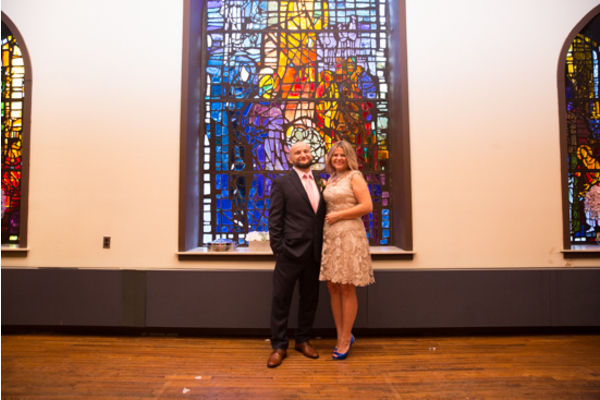 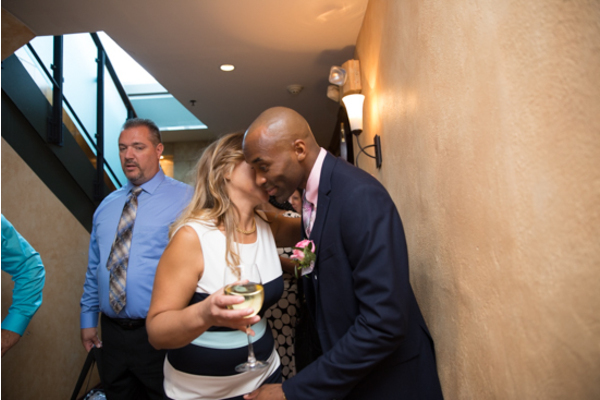 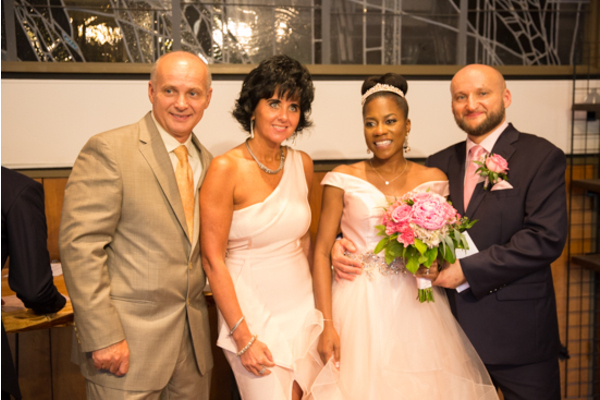 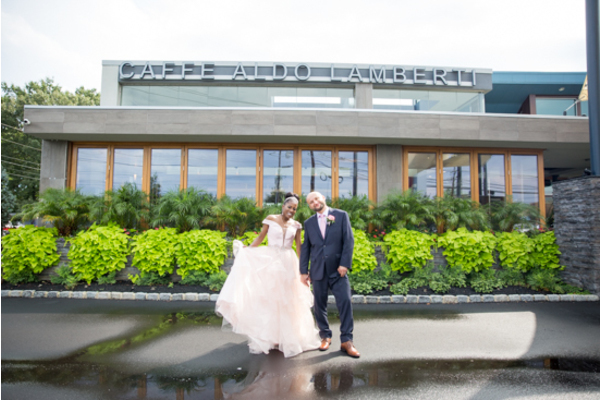 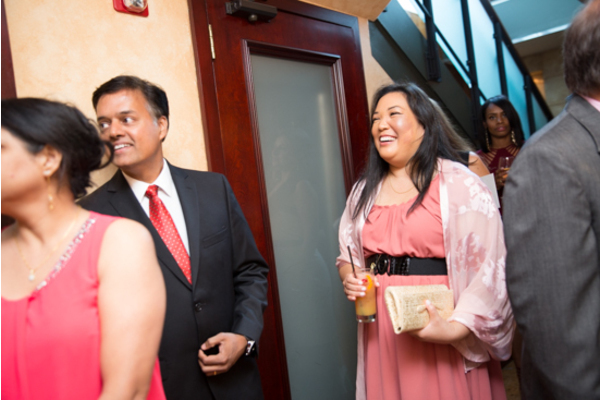 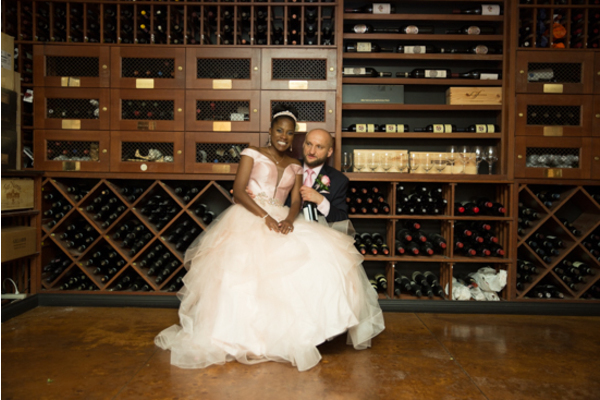 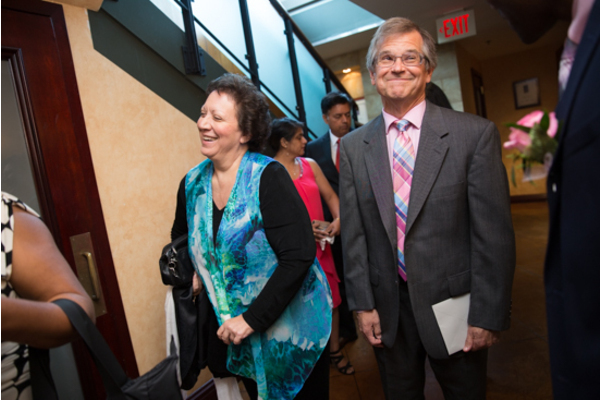 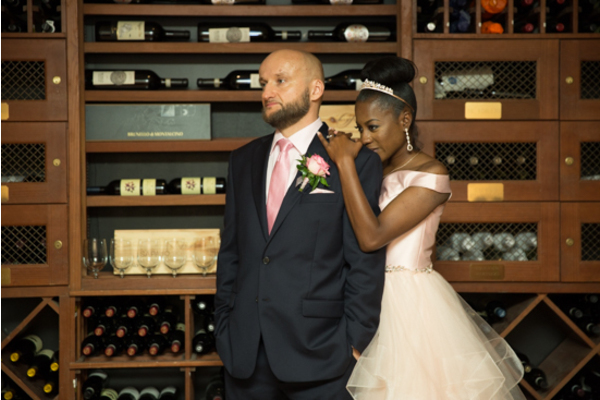 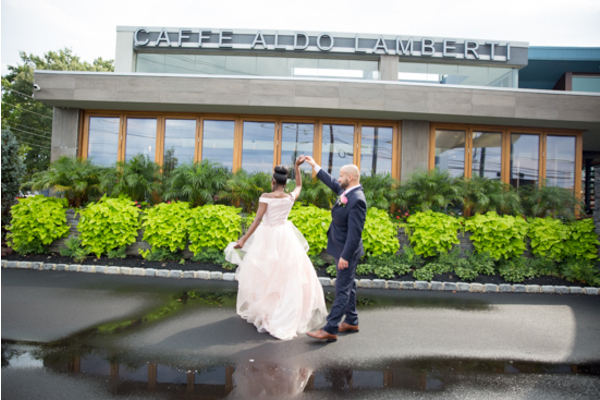 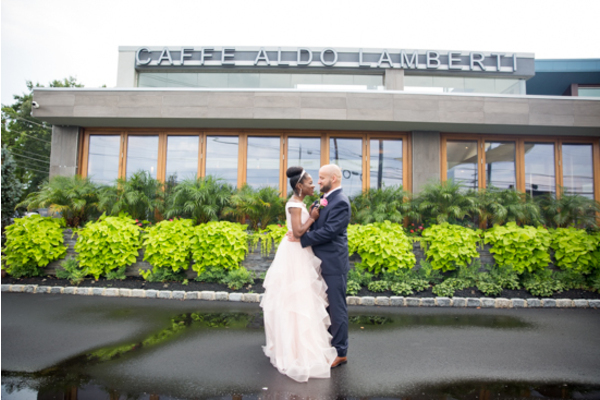 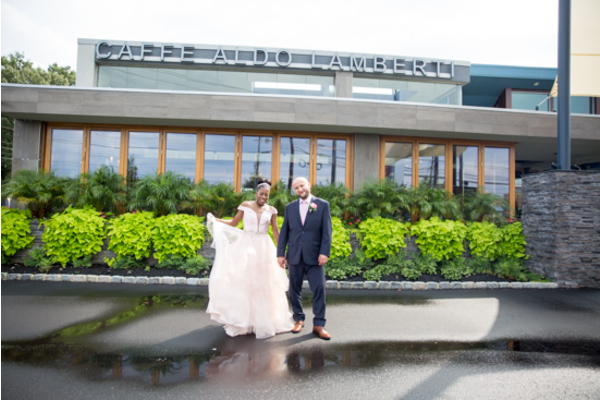 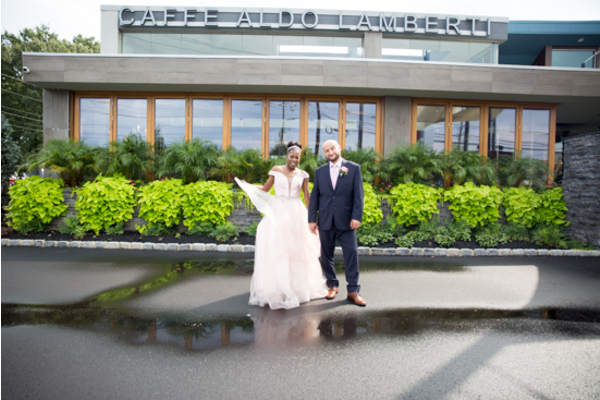 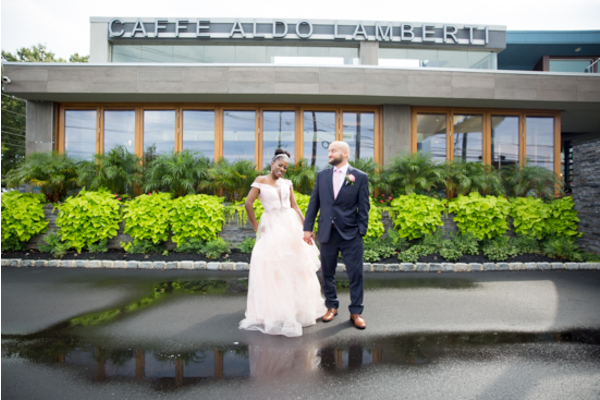 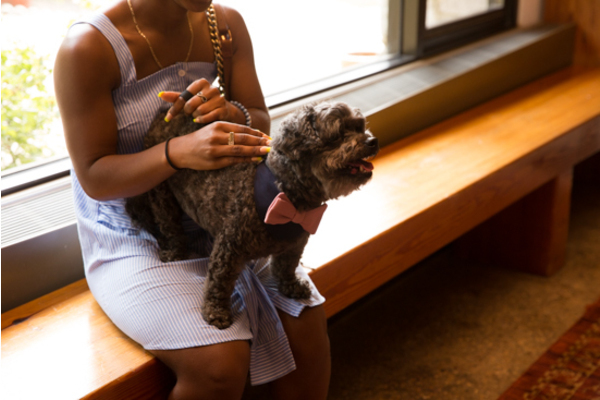 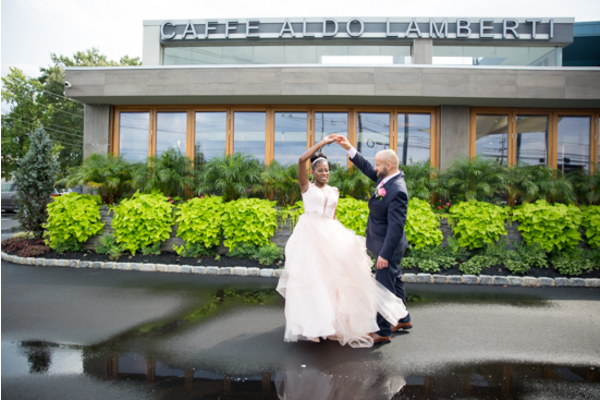 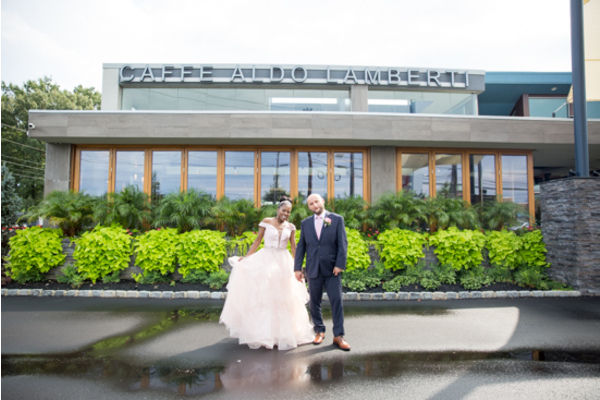 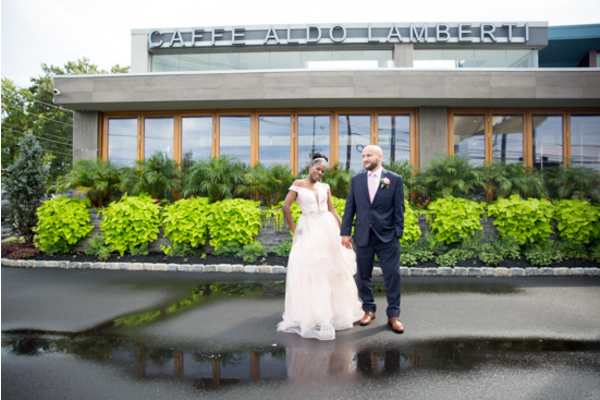 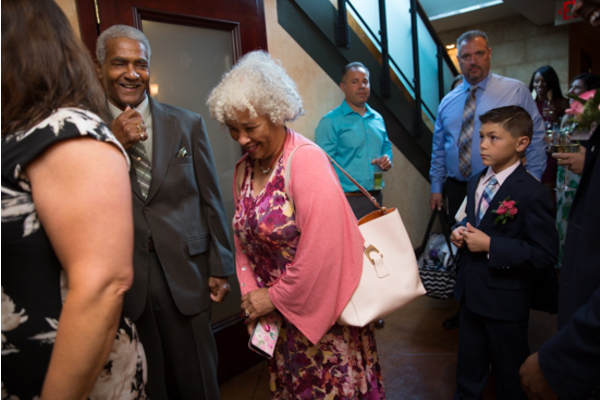 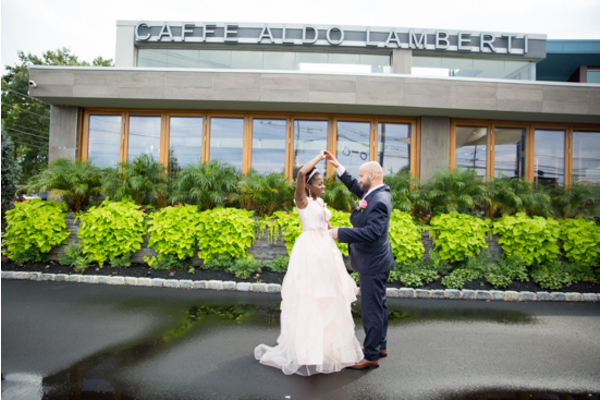 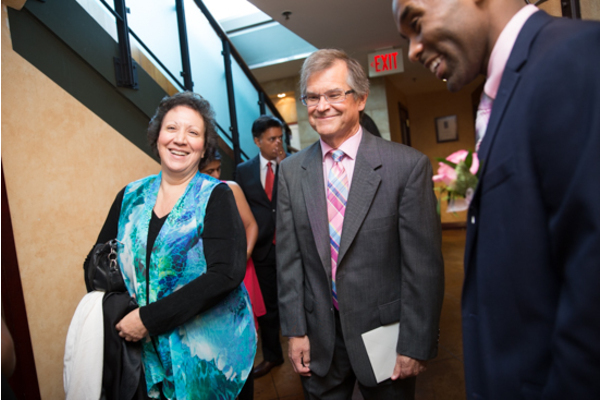 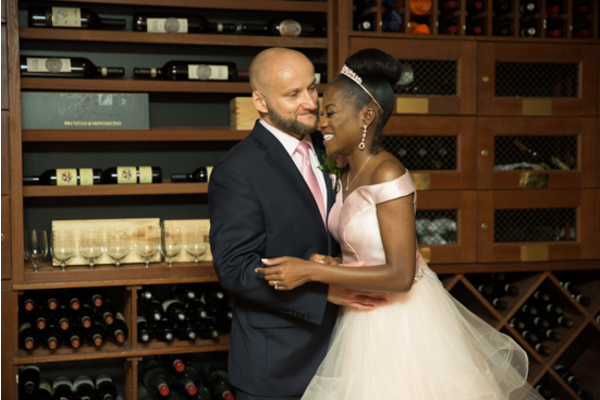 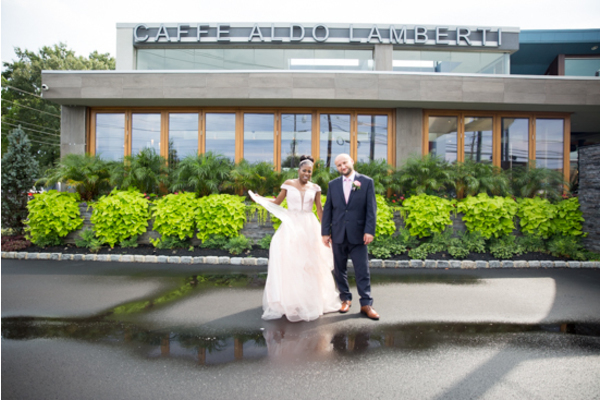 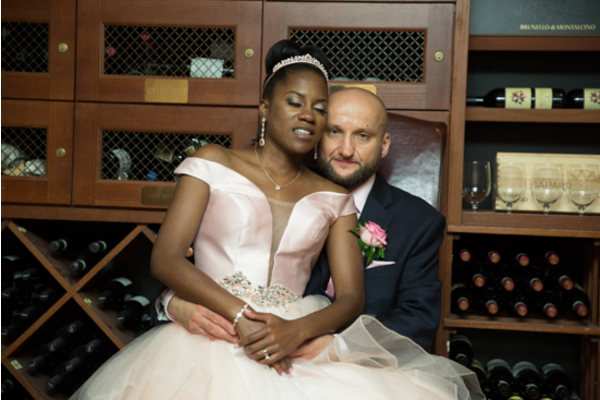 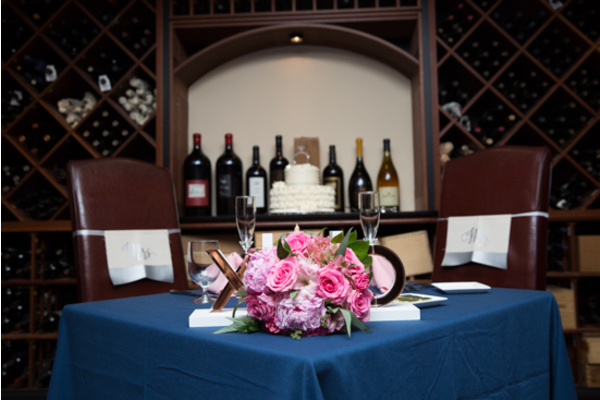 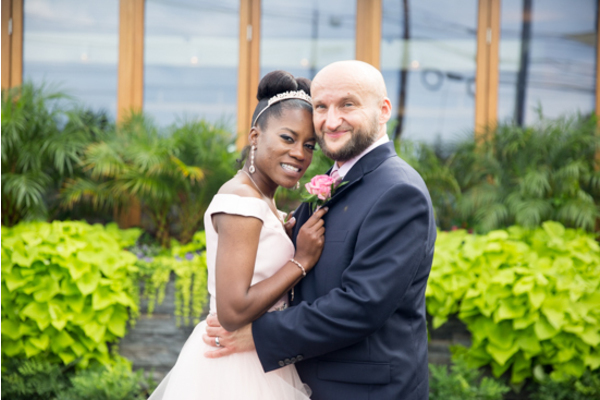 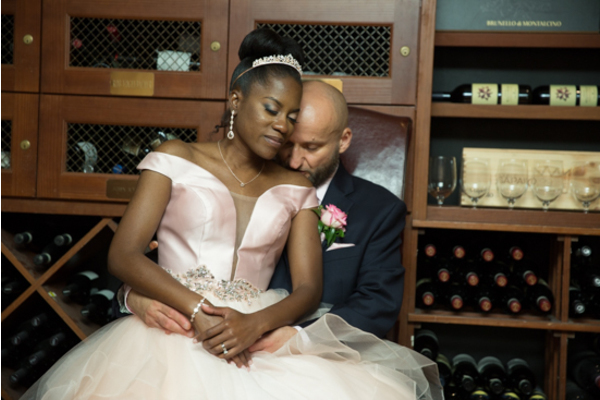 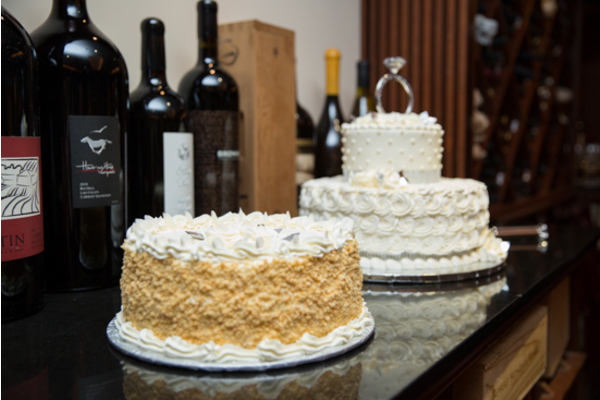 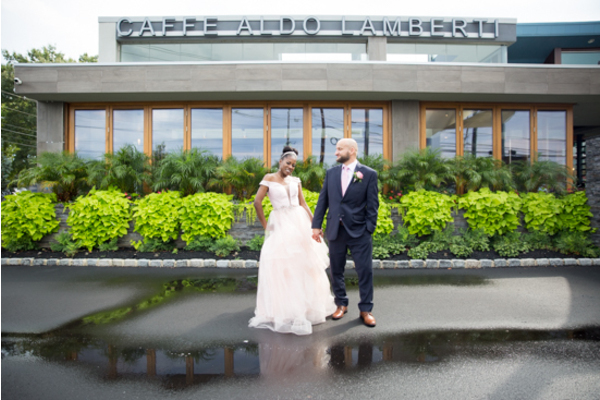 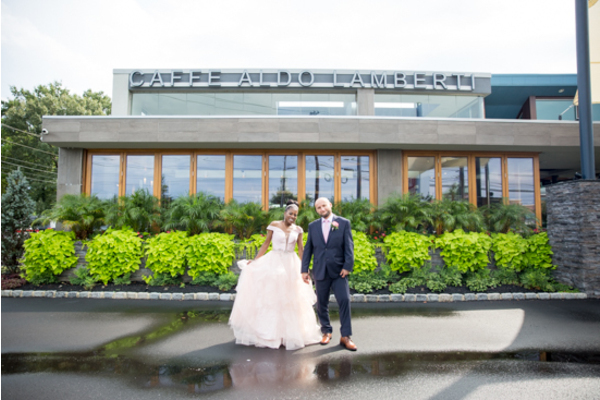 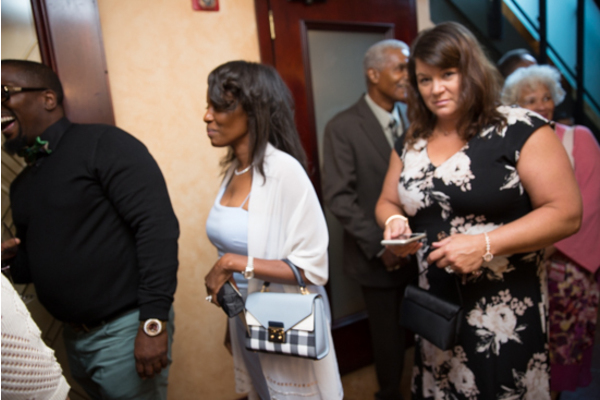 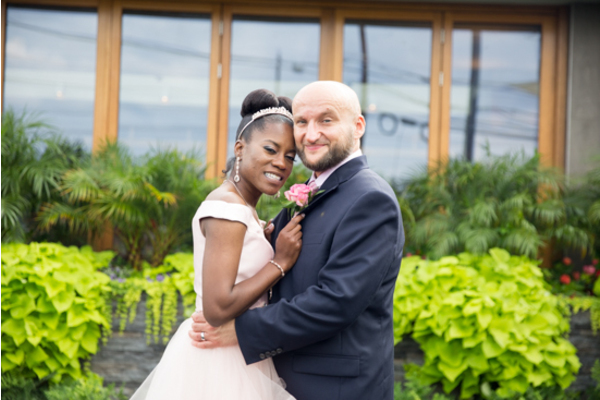 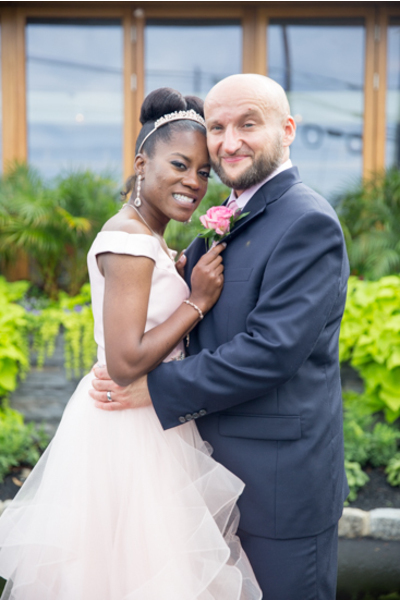 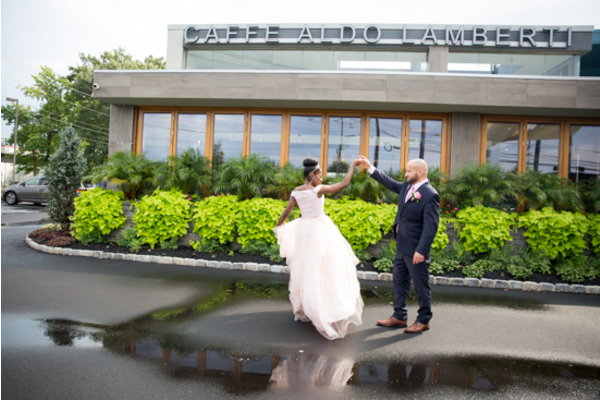 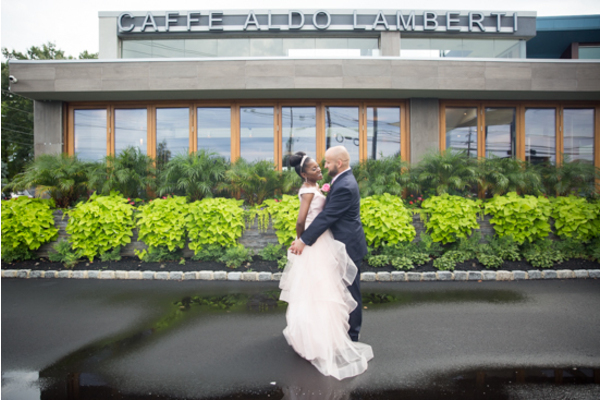 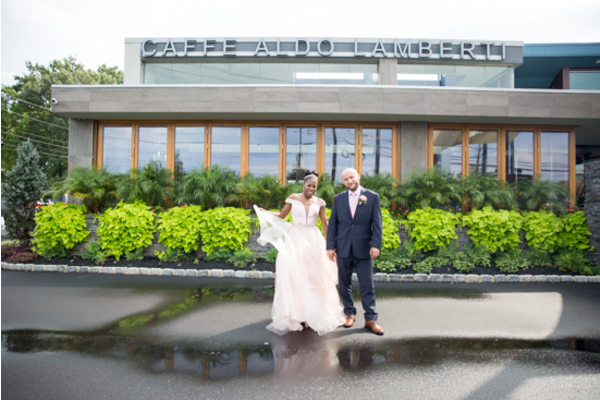 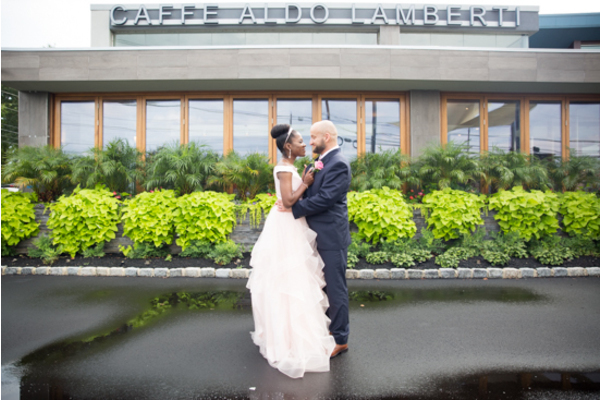 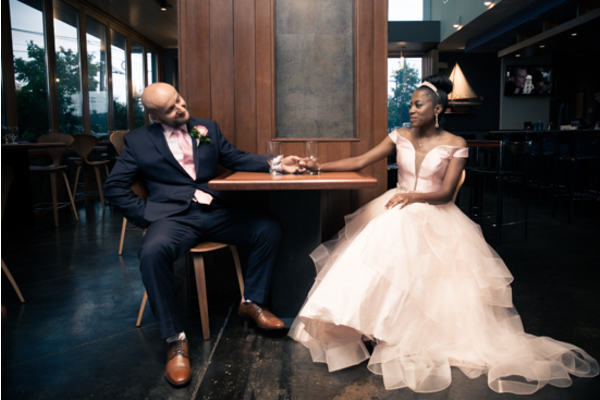 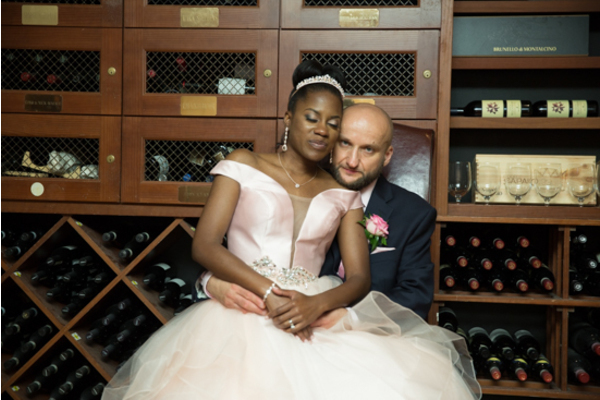 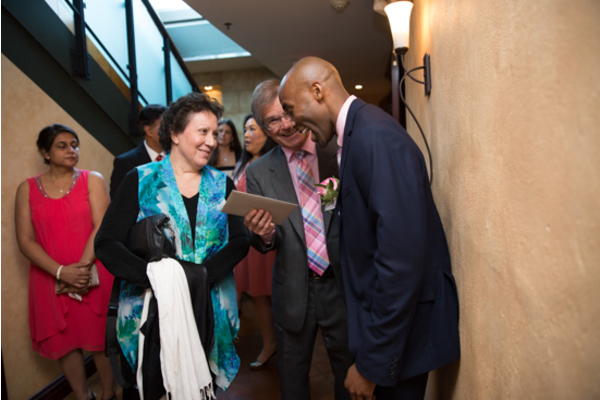 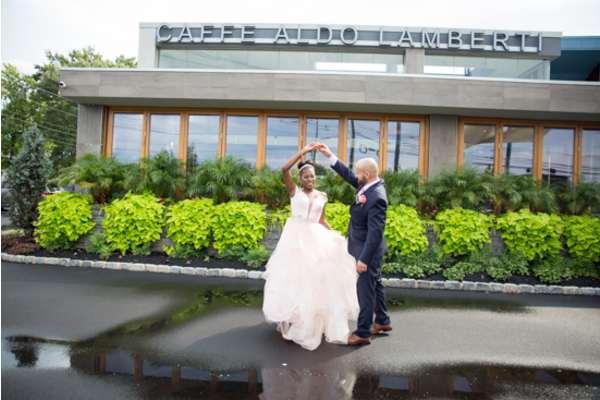 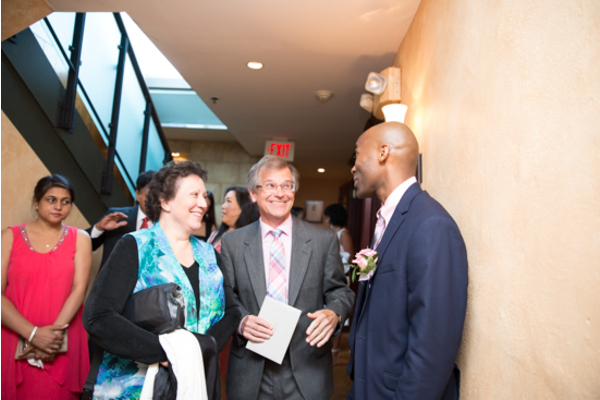 This wonderful couple tied the knot at Caffe Aldo Lamberti. 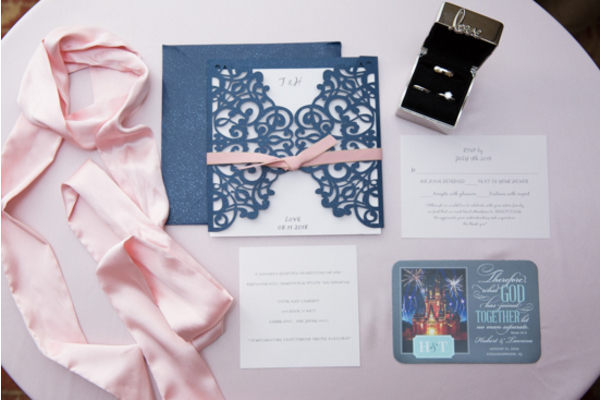 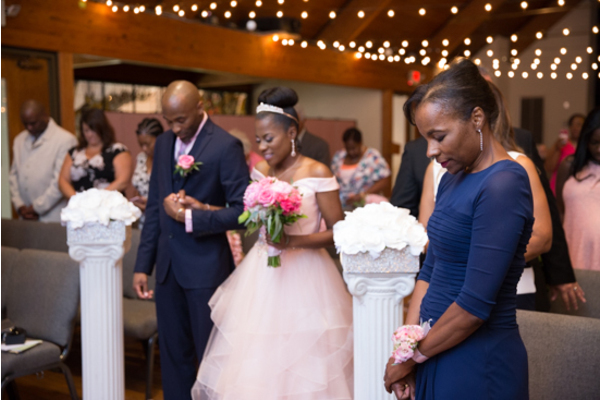 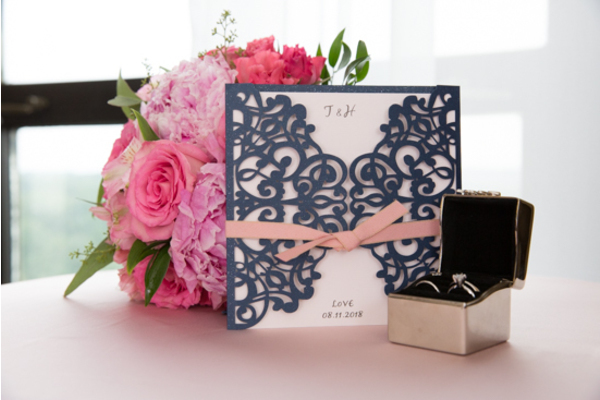 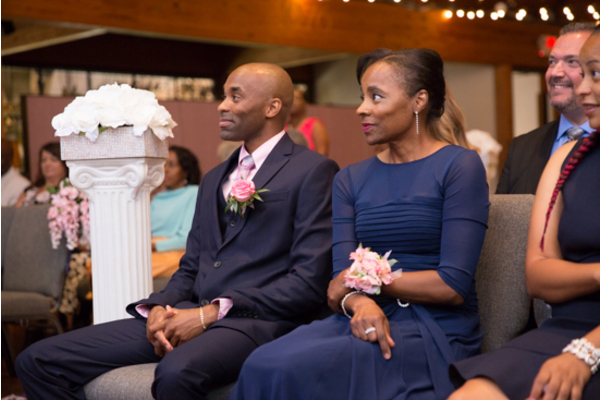 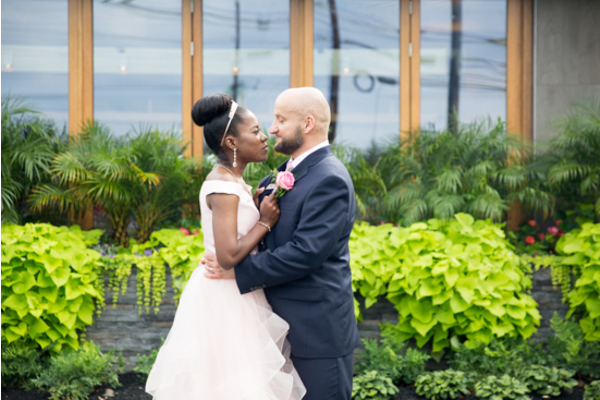 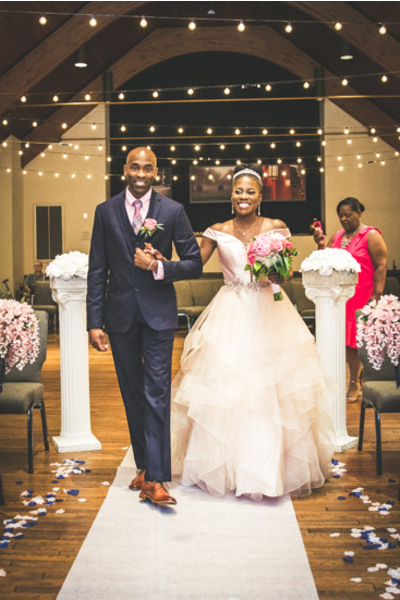 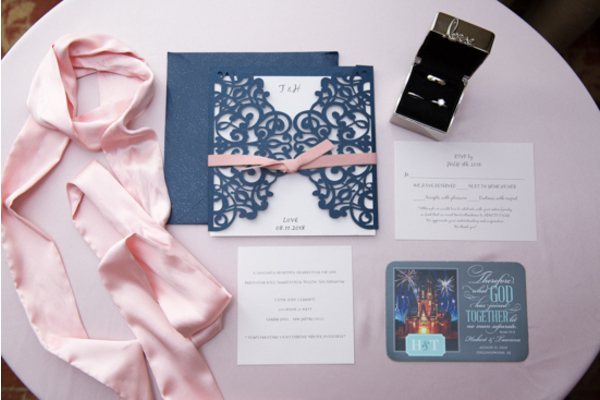 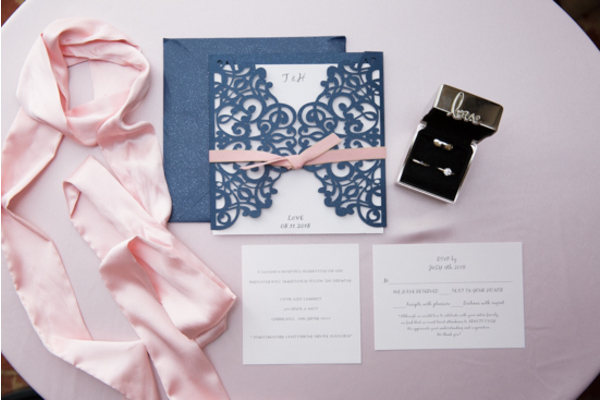 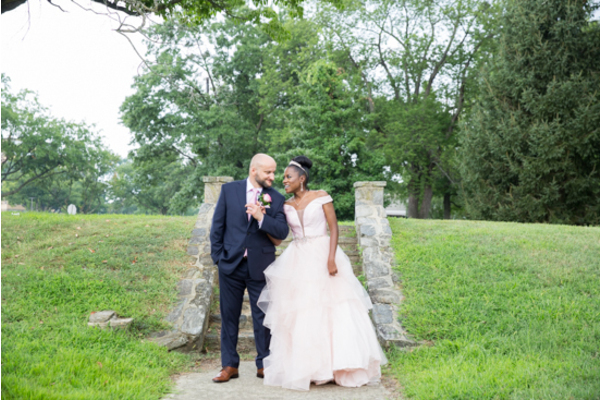 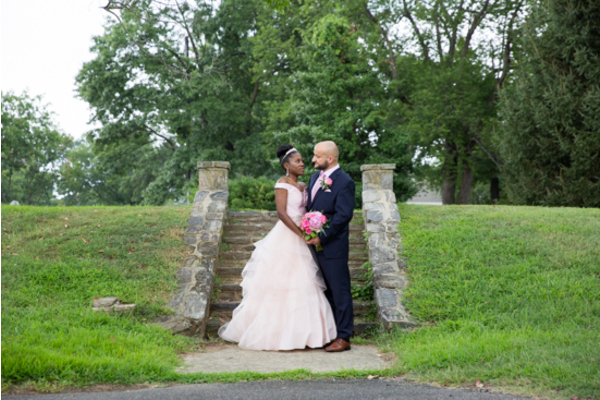 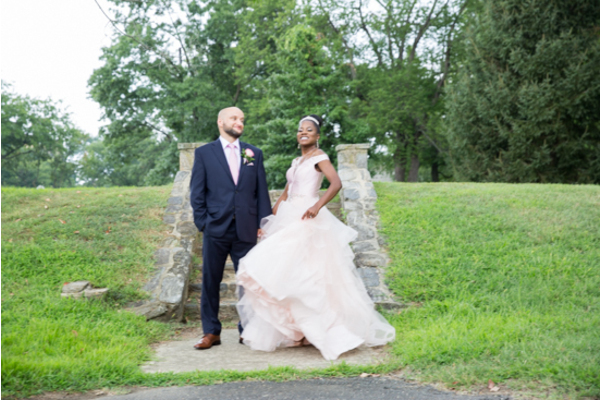 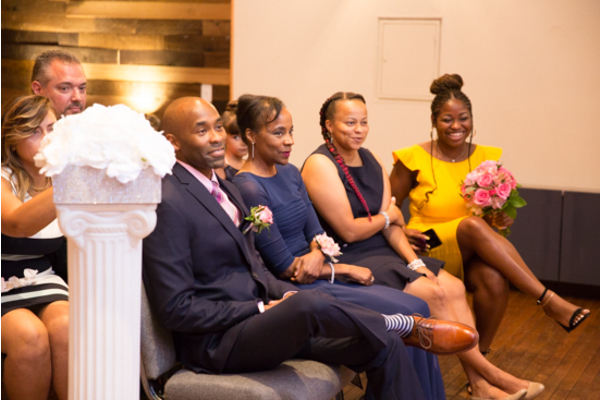 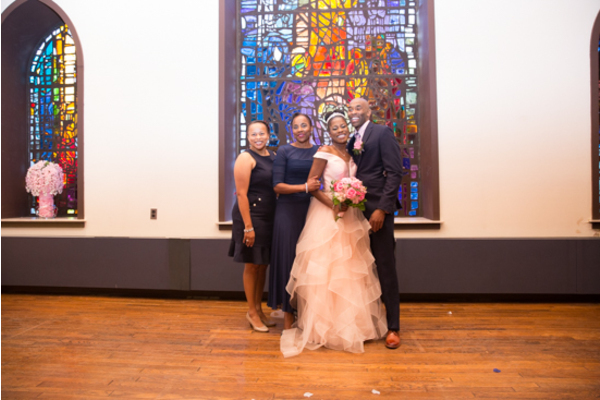 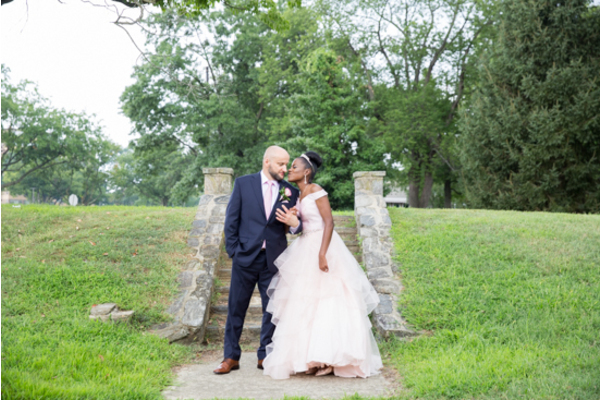 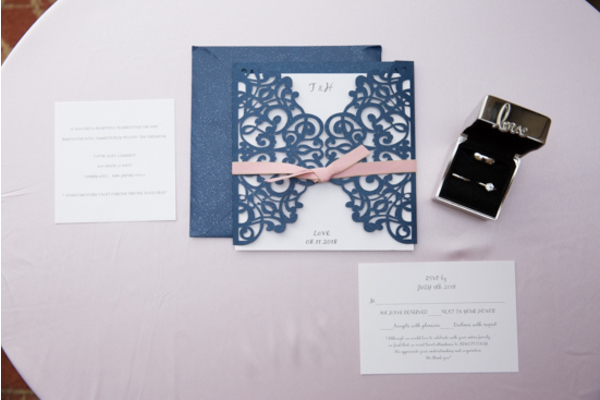 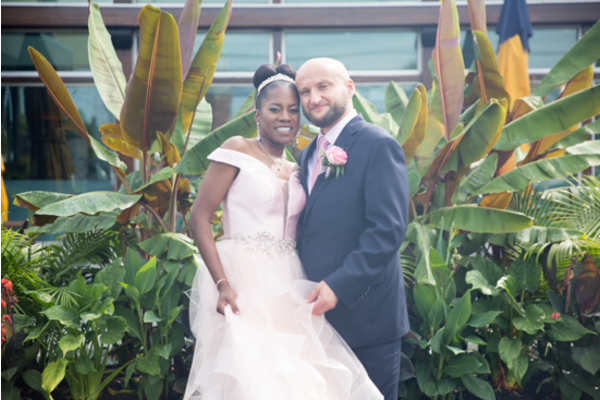 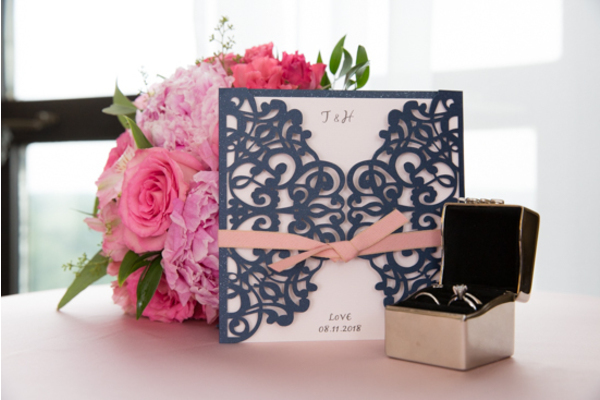 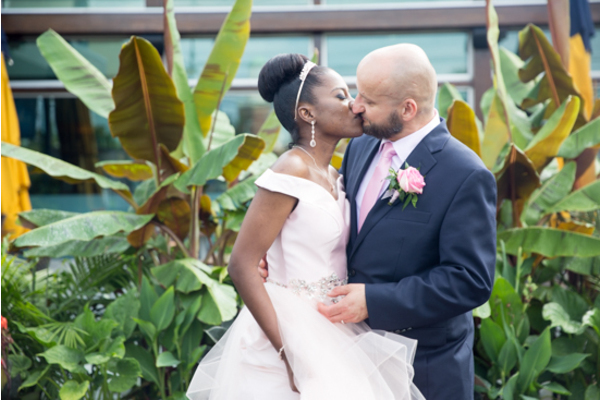 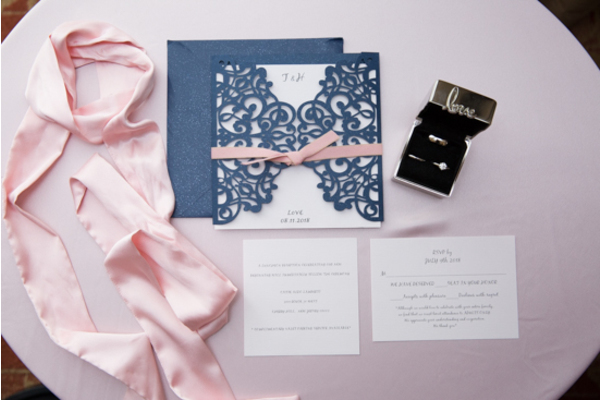 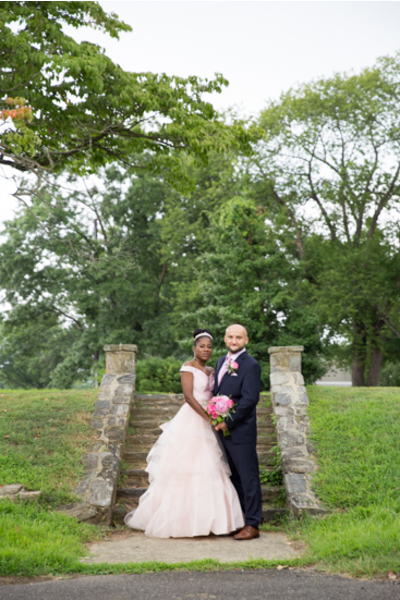 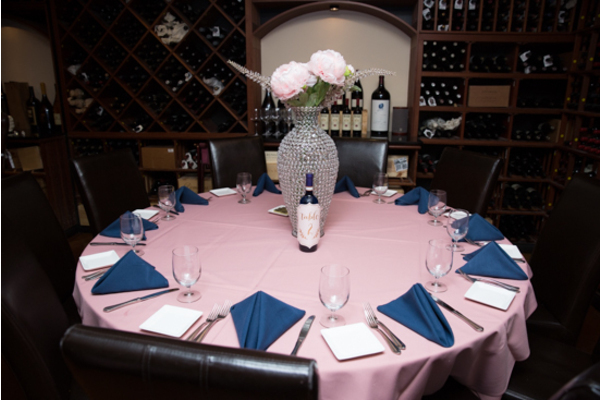 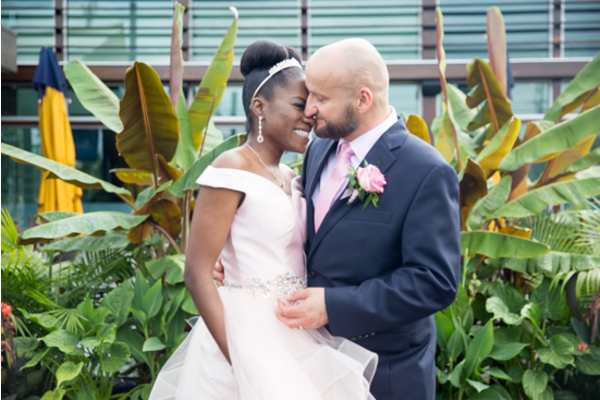 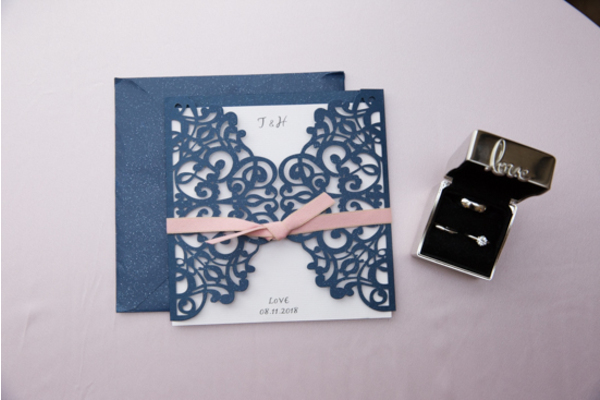 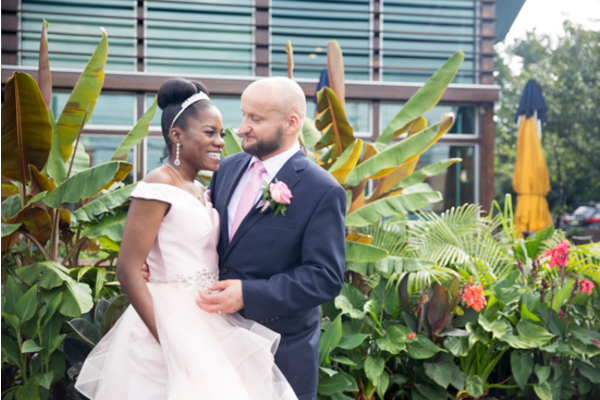 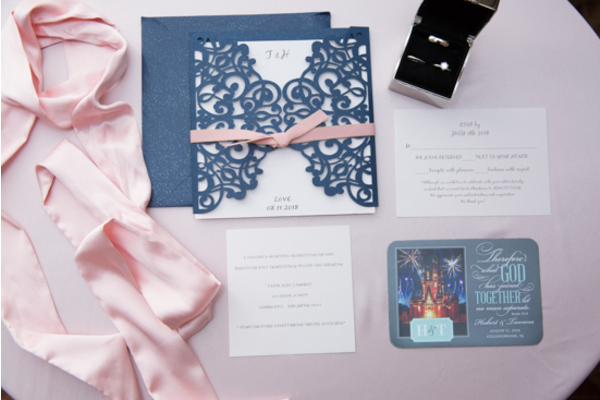 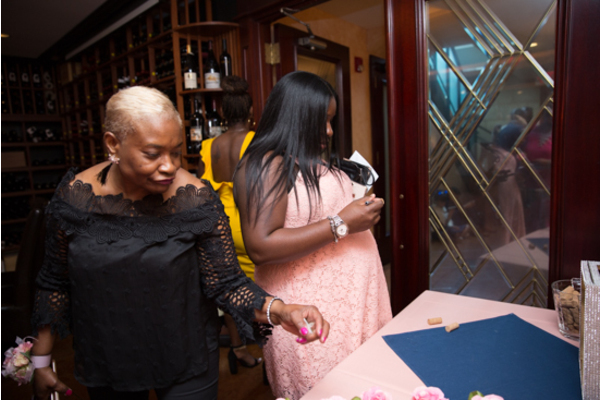 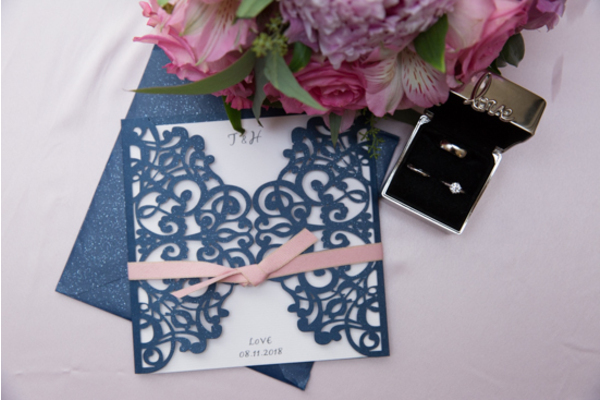 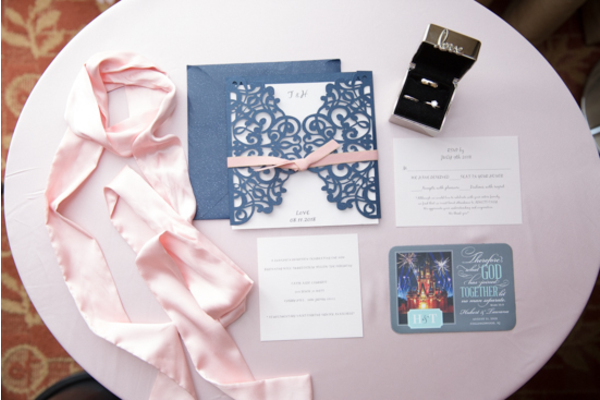 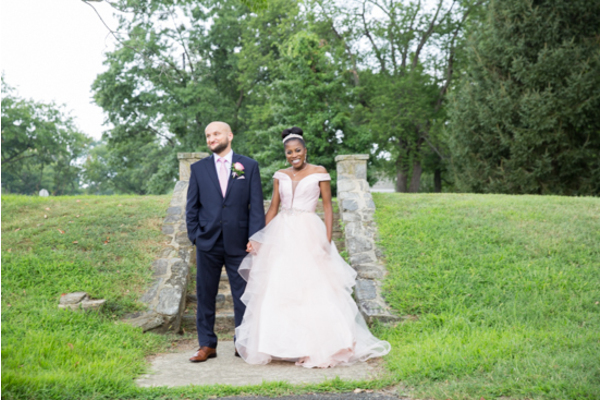 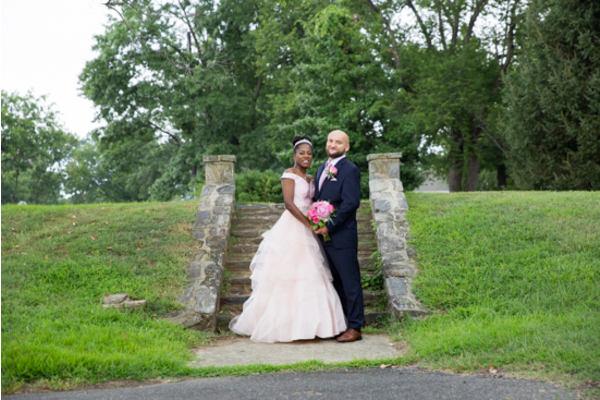 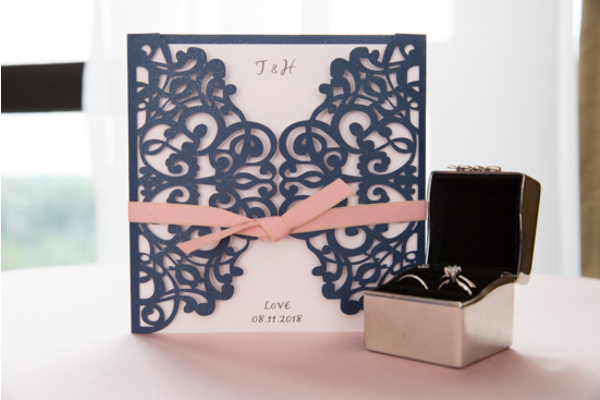 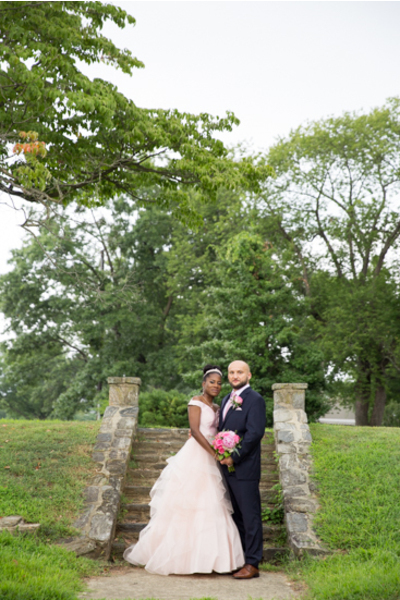 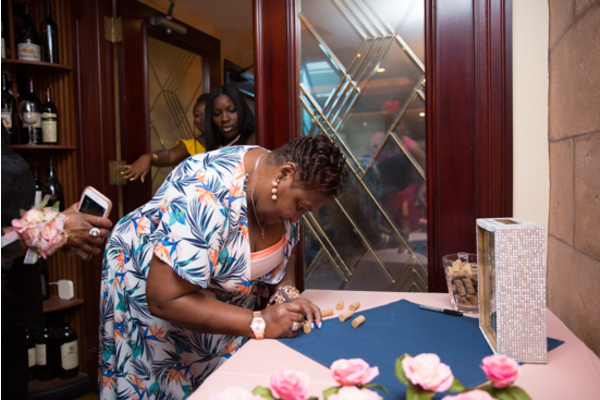 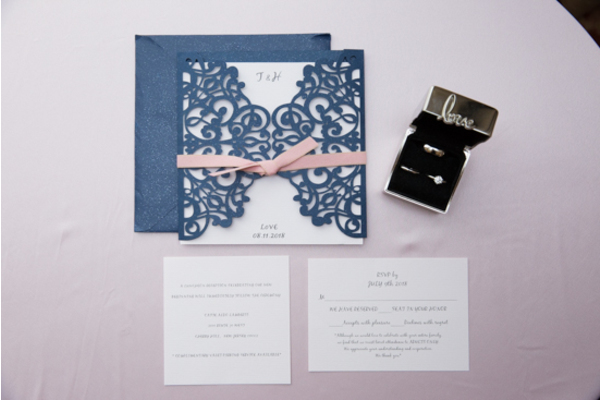 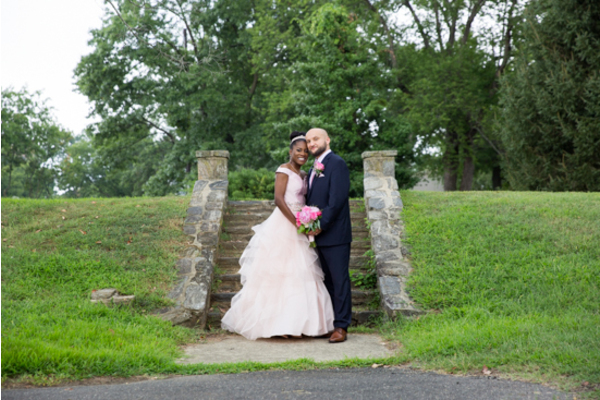 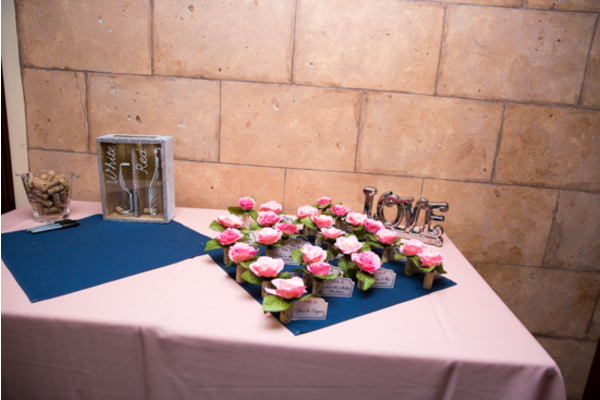 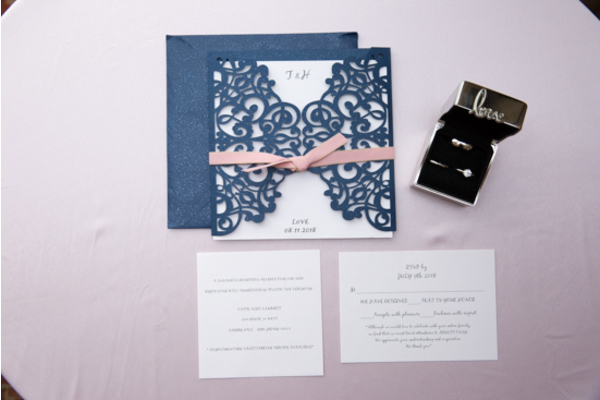 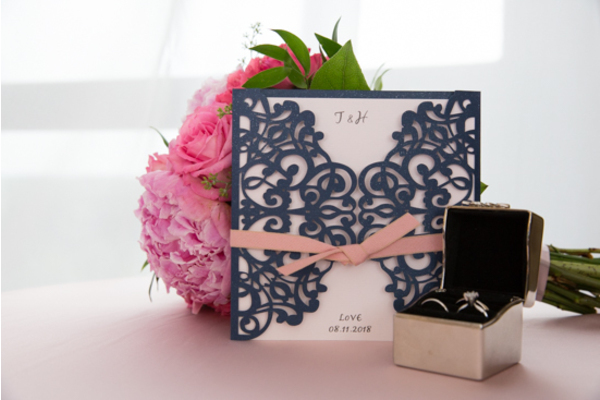 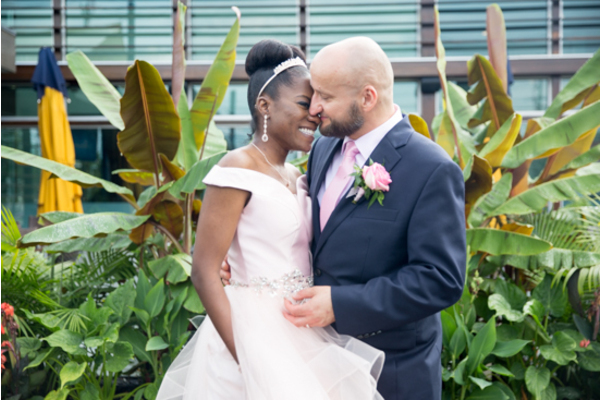 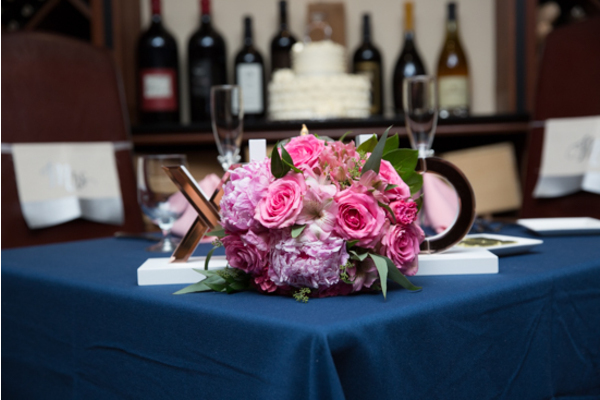 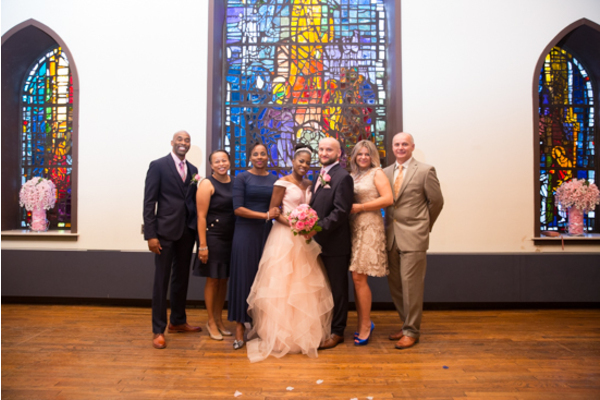 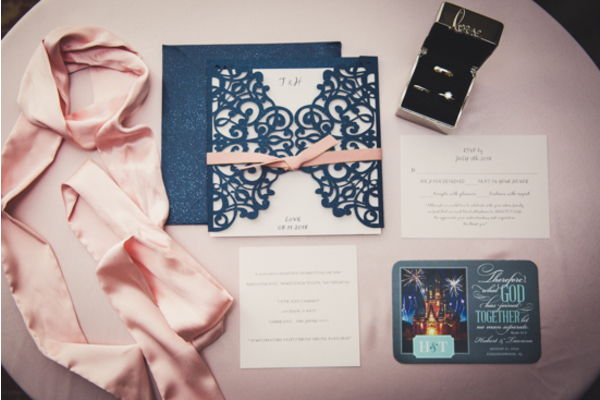 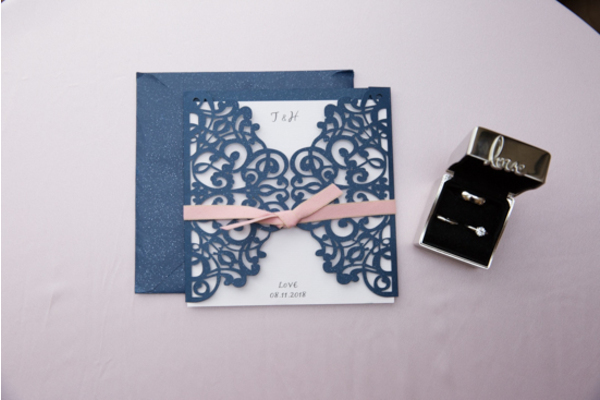 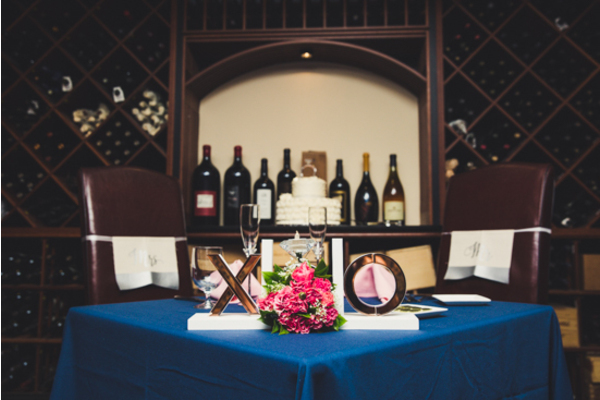 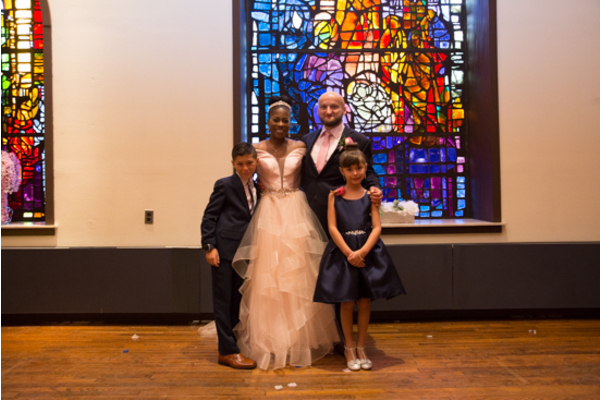 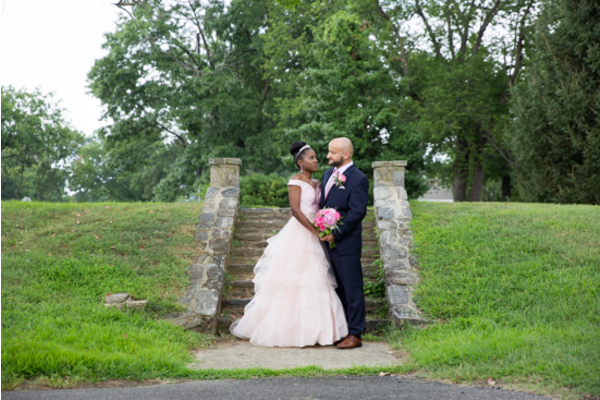 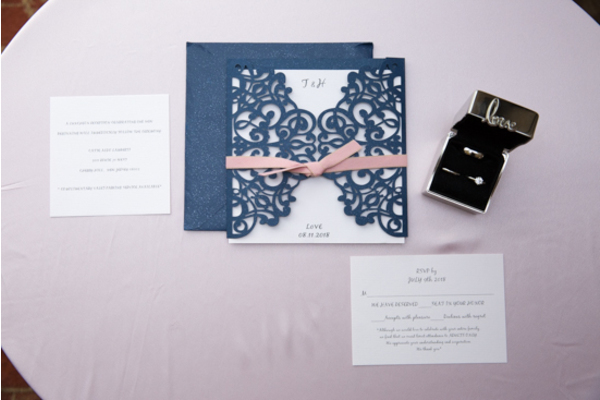 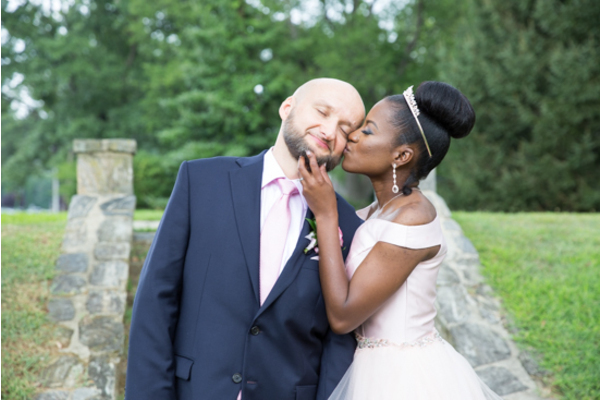 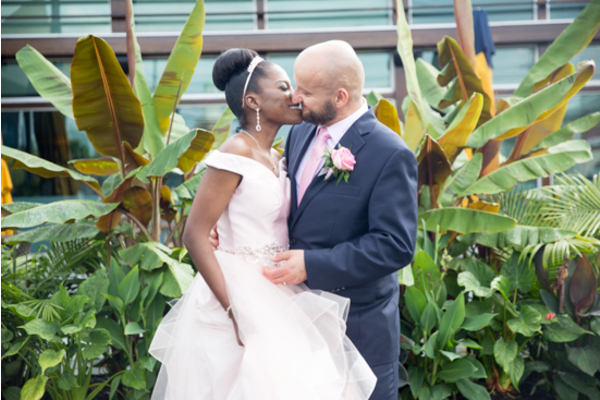 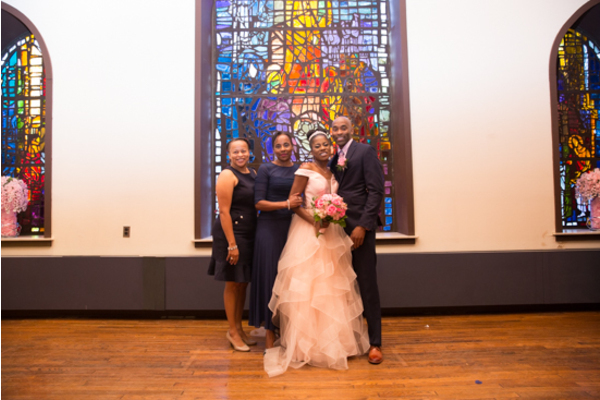 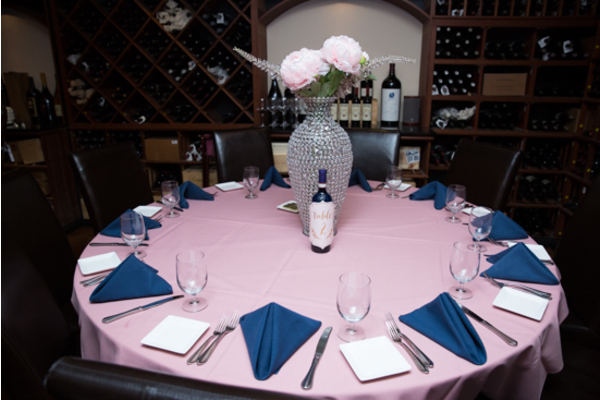 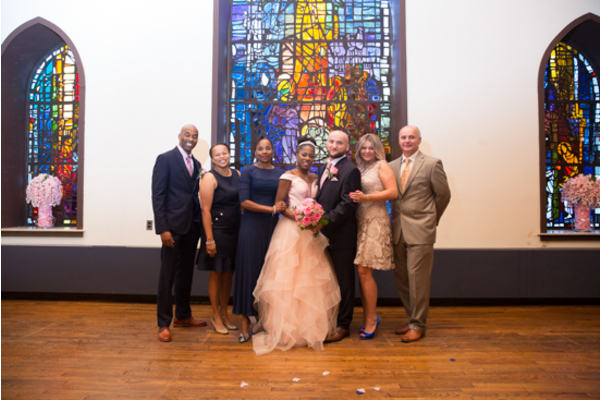 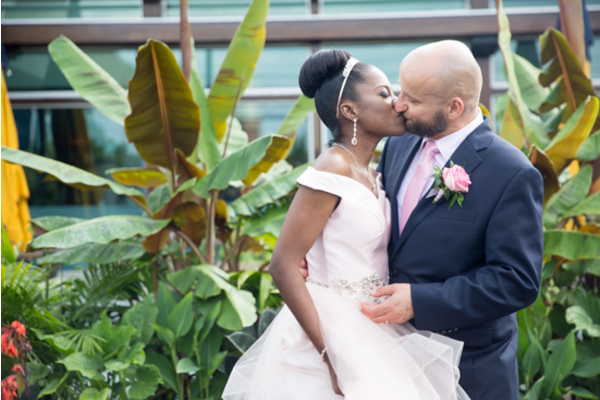 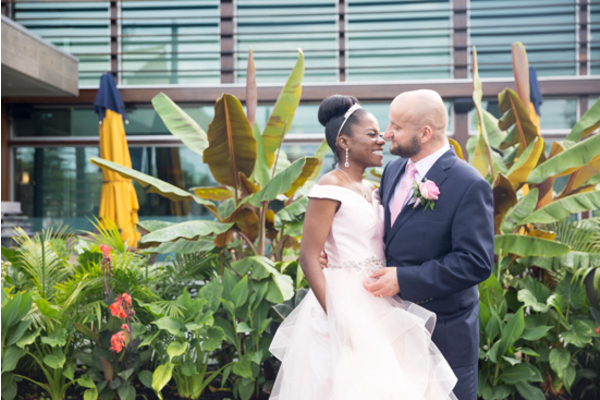 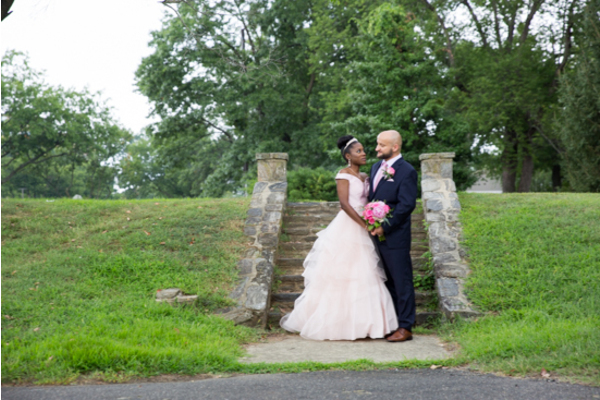 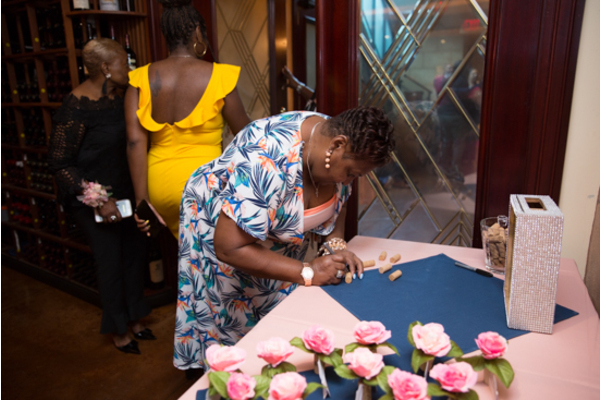 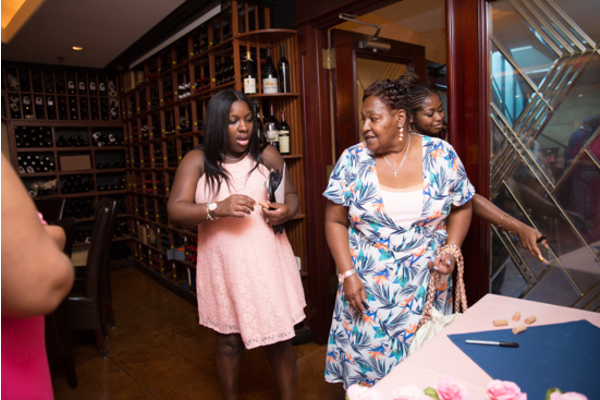 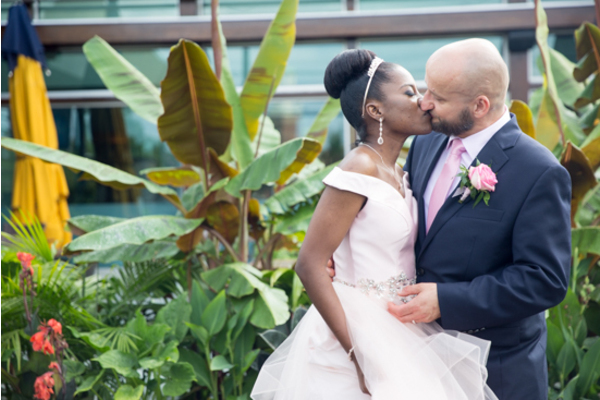 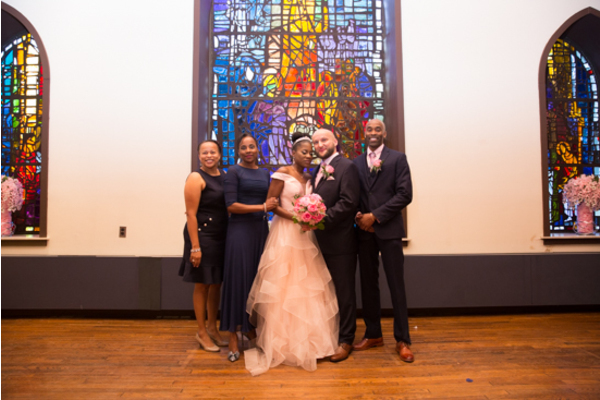 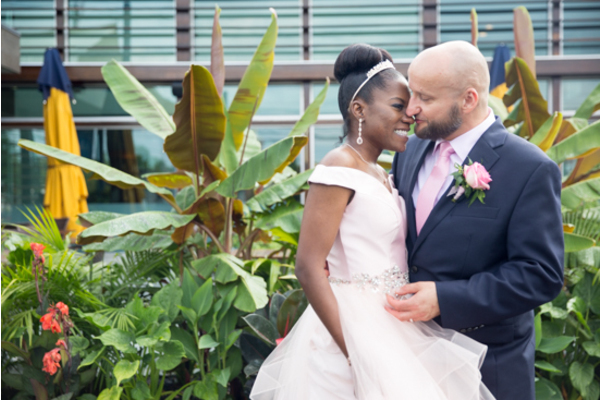 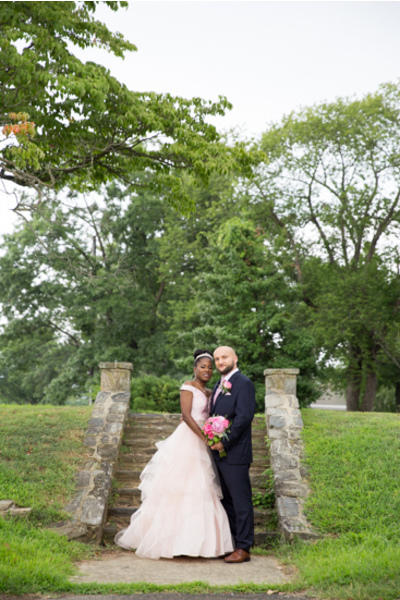 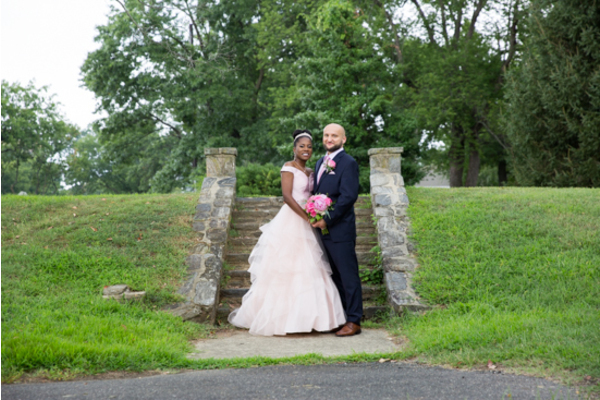 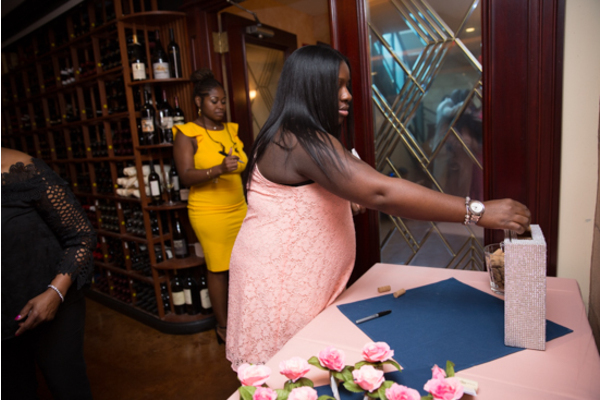 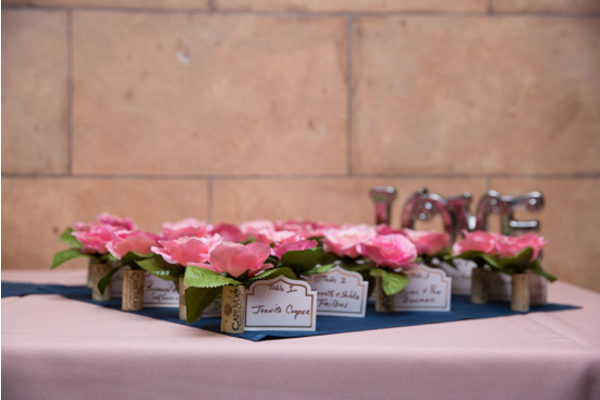 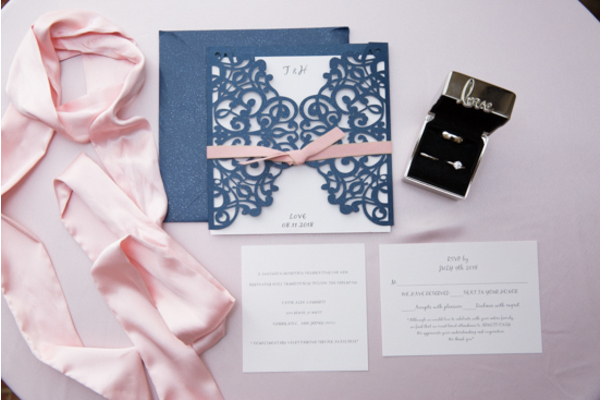 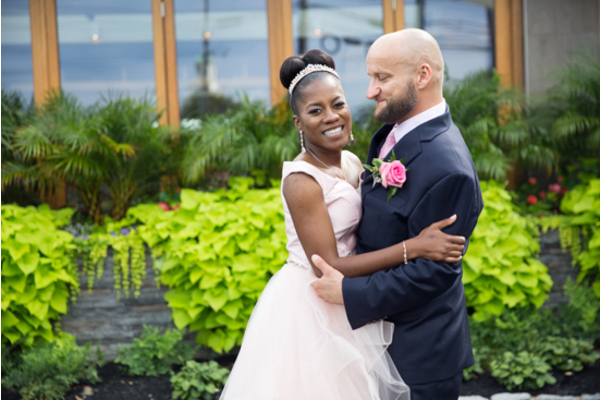 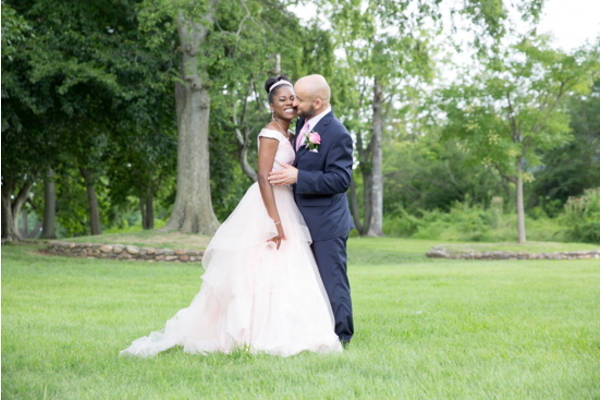 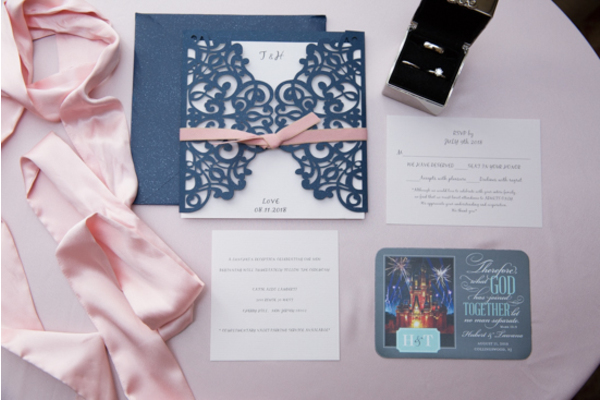 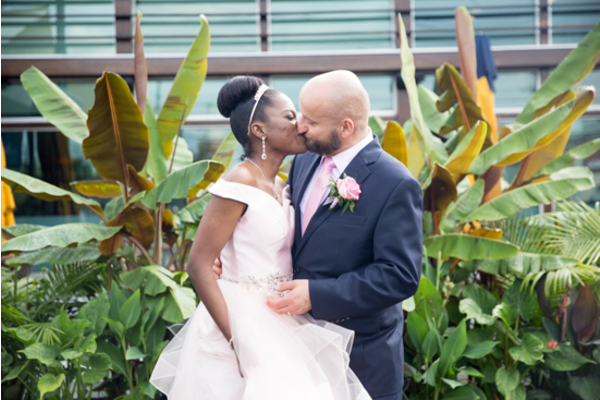 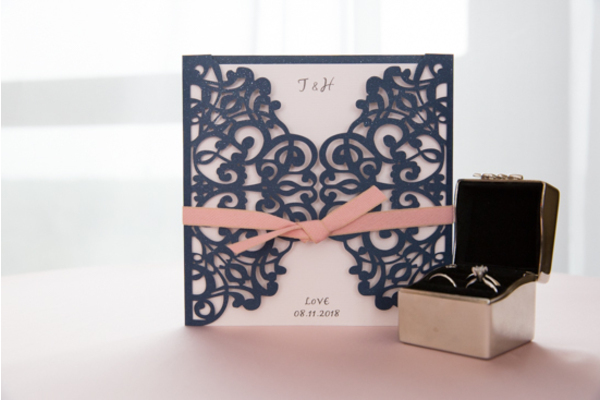 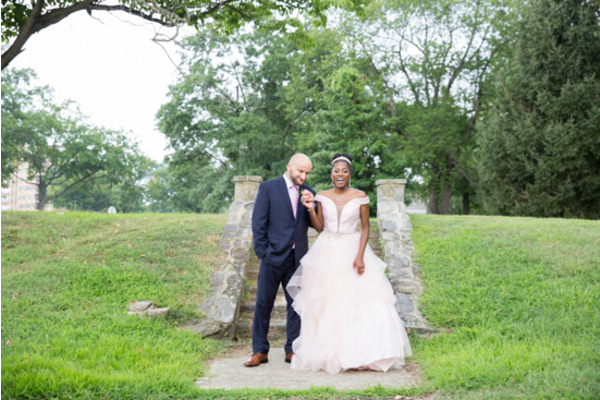 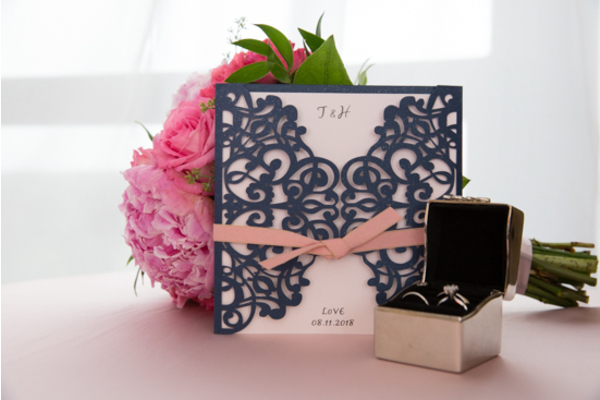 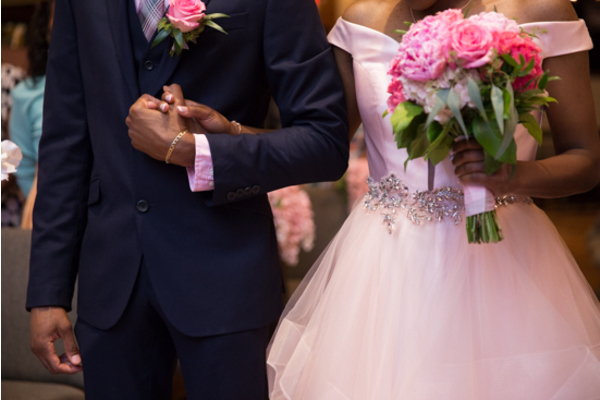 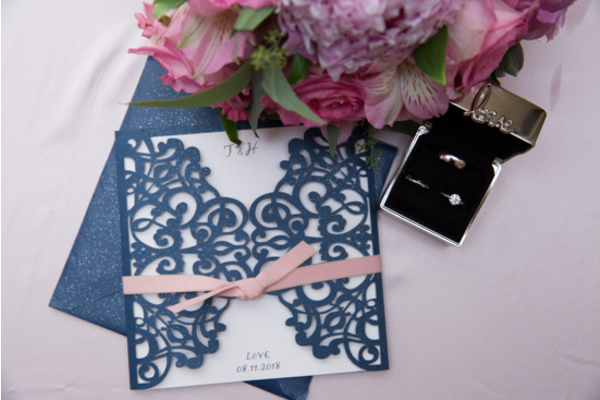 The sunny summer skies and their navy and pink color theme made this wedding one to remember! 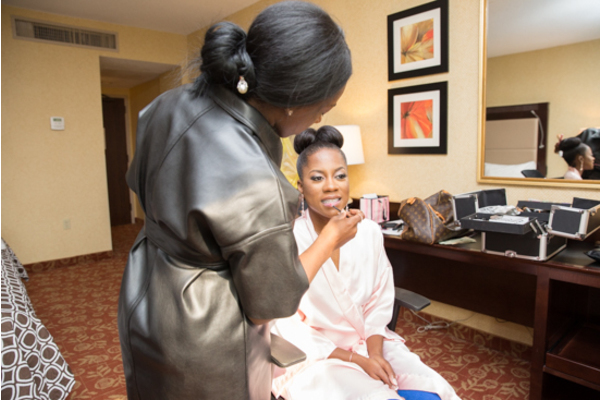 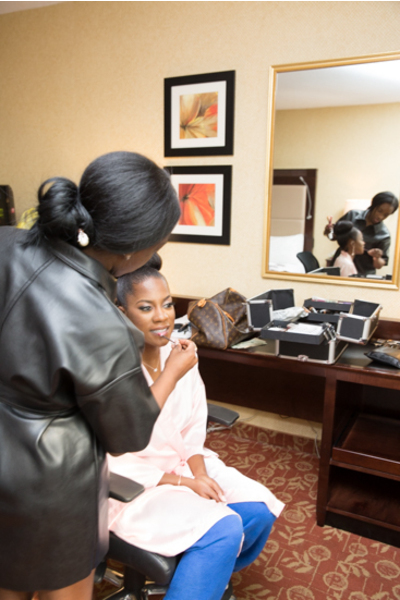 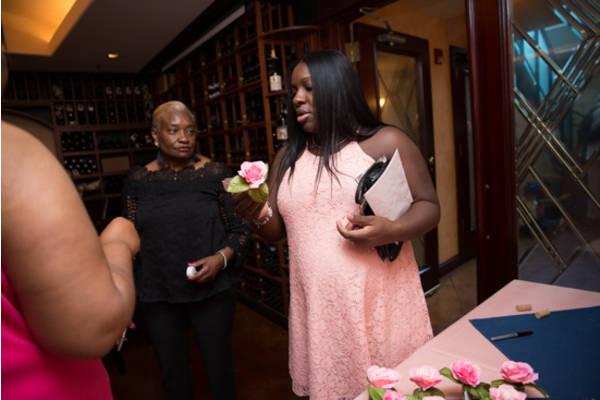 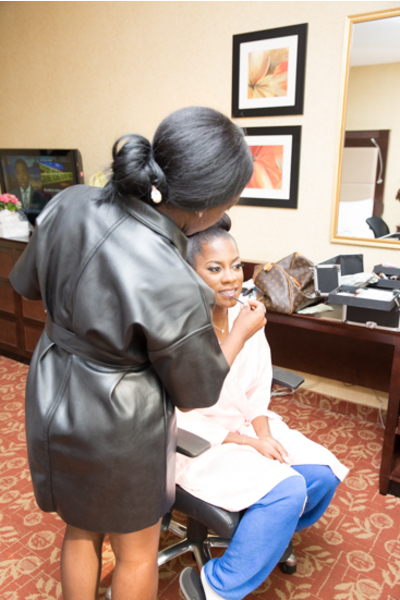 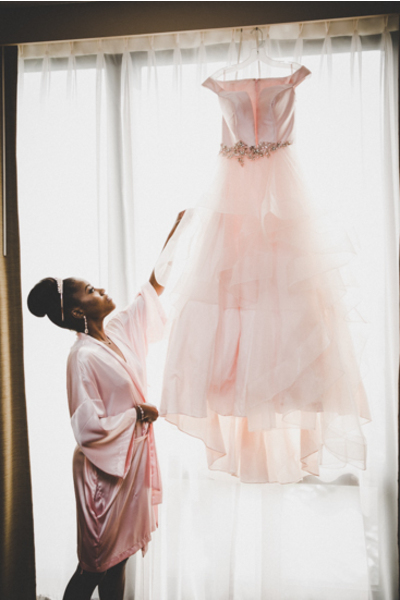 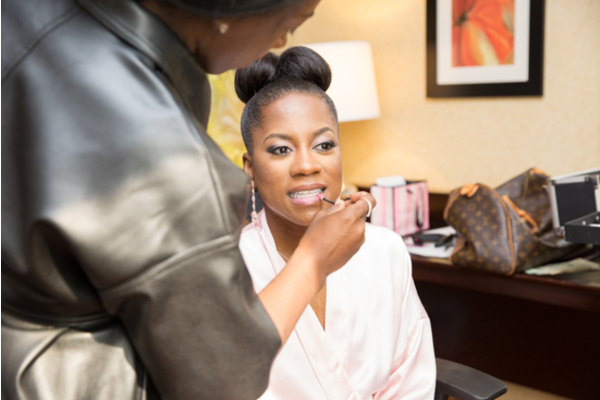 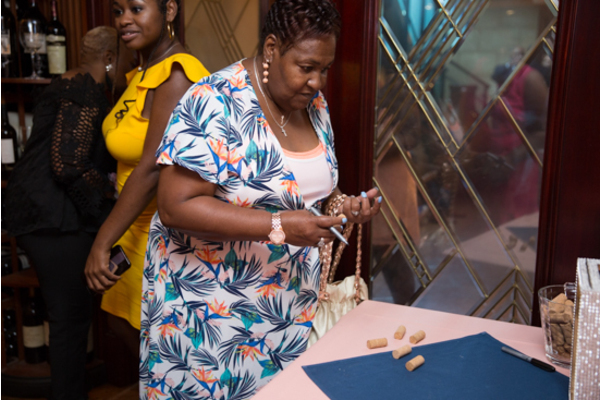 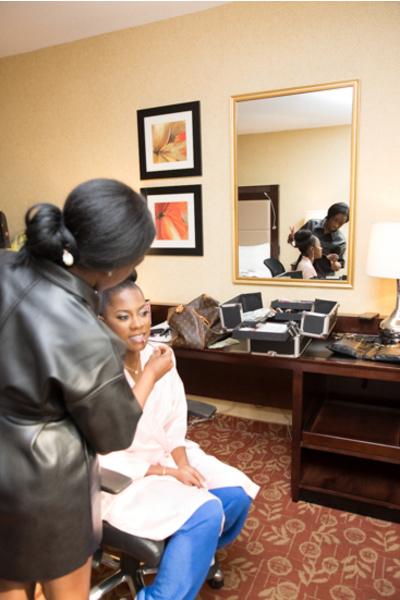 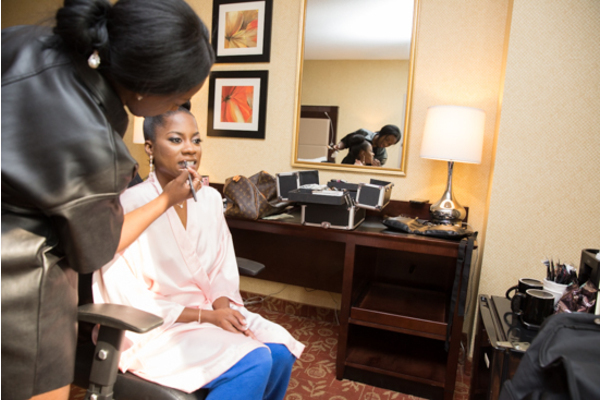 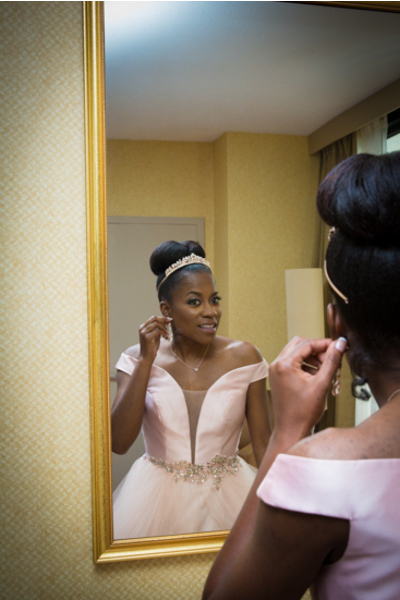 First, Tee started her day getting her makeup done to perfection while wearing a light pink silk robe. 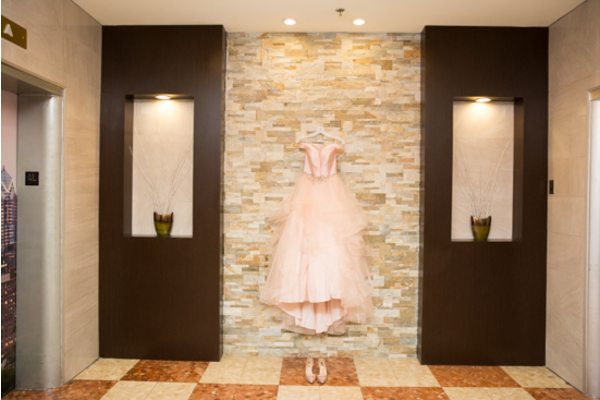 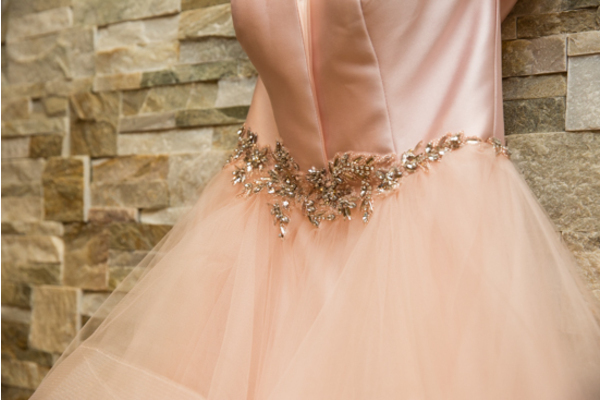 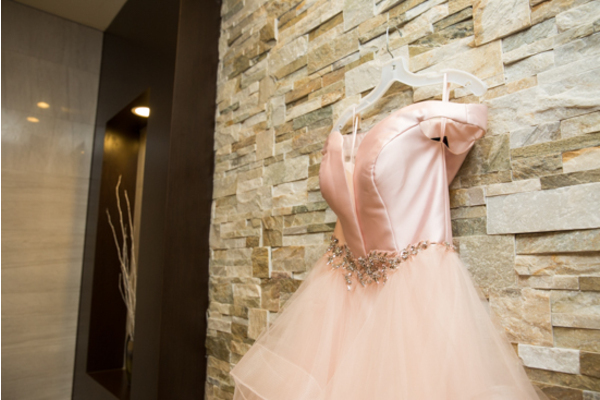 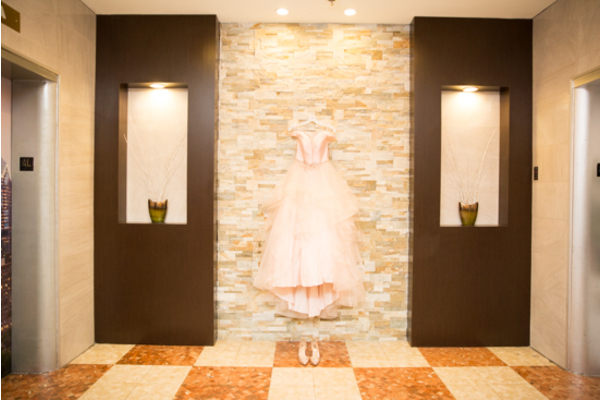 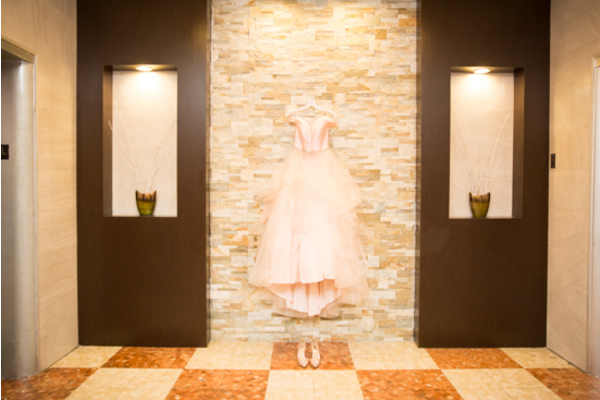 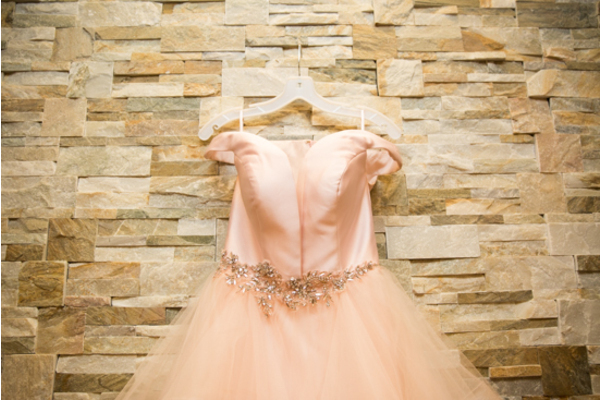 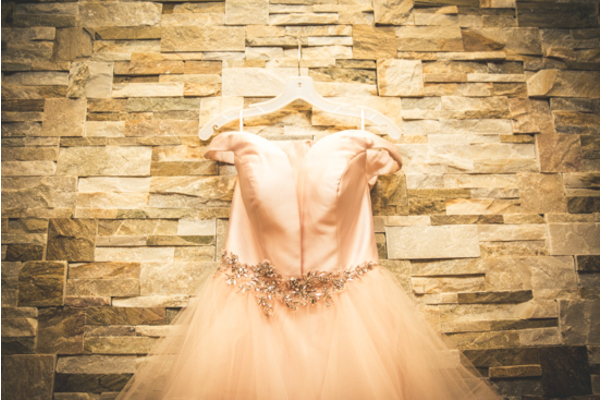 She was pampered from head to toe as she admired her gorgeous pink wedding dress hung on the stone wall. 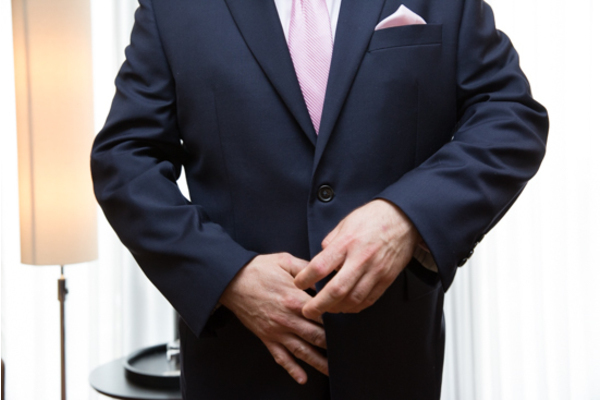 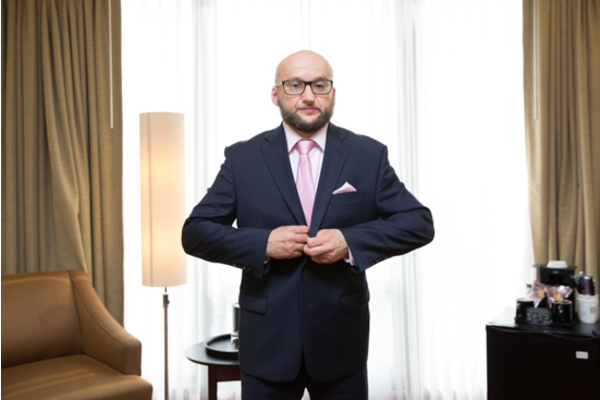 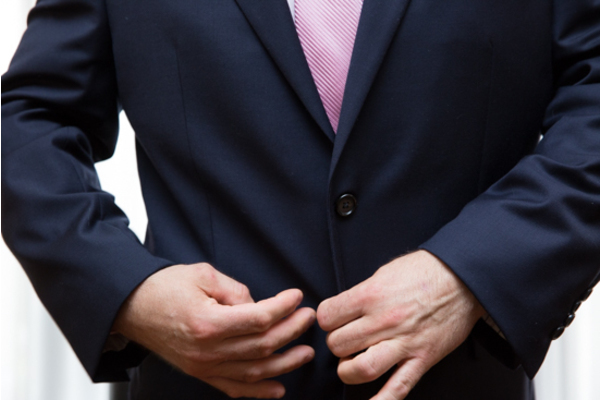 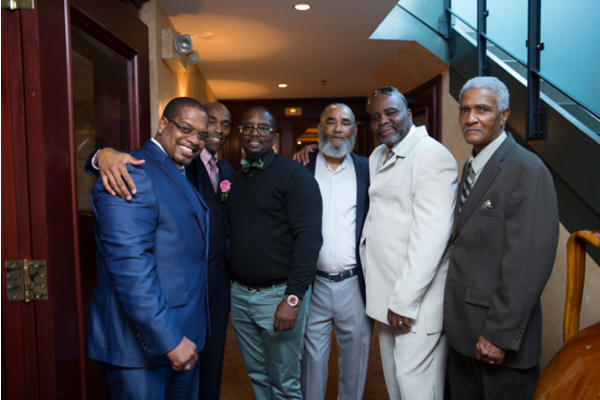 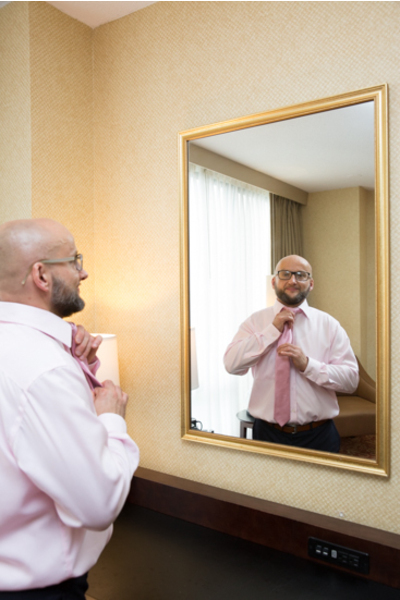 Meanwhile, Hubert was in another room sporting matching ties with his groomsmen. 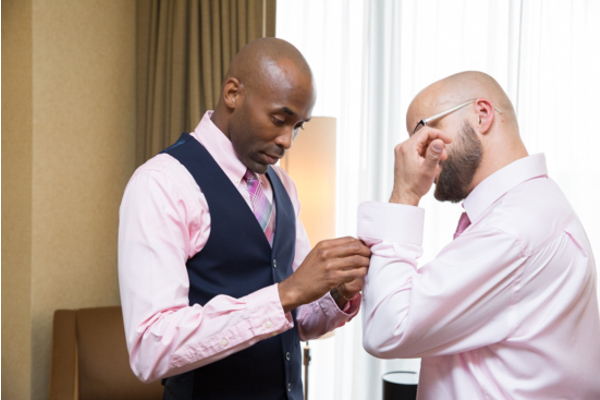 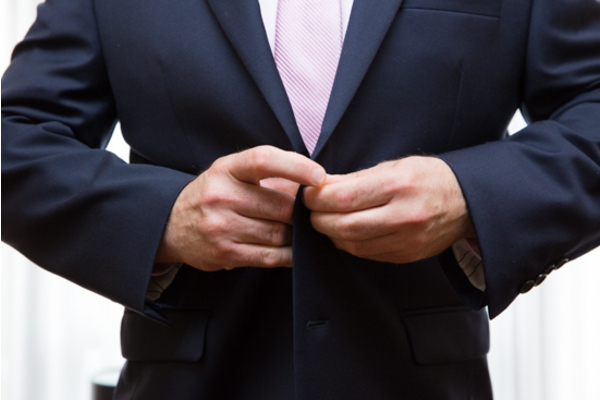 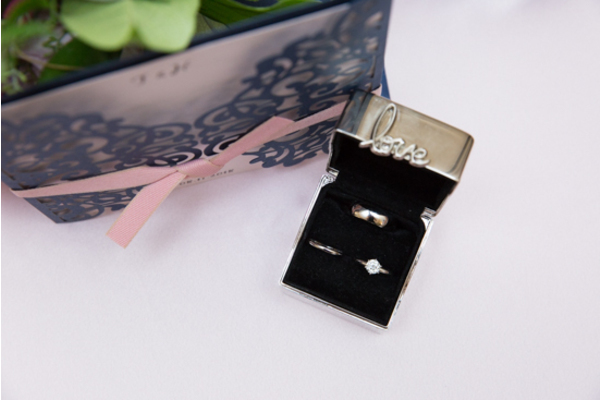 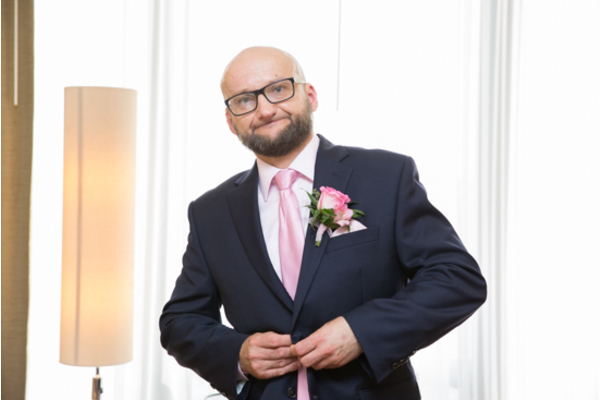 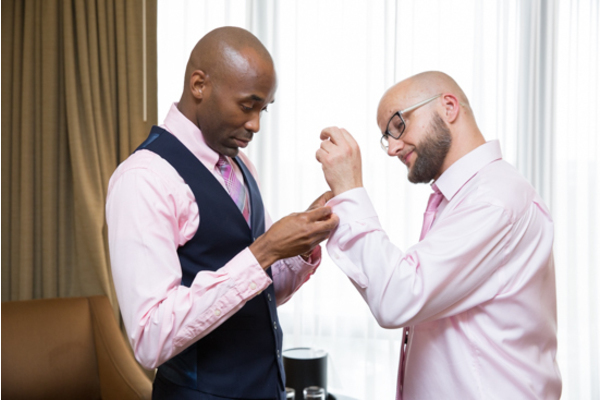 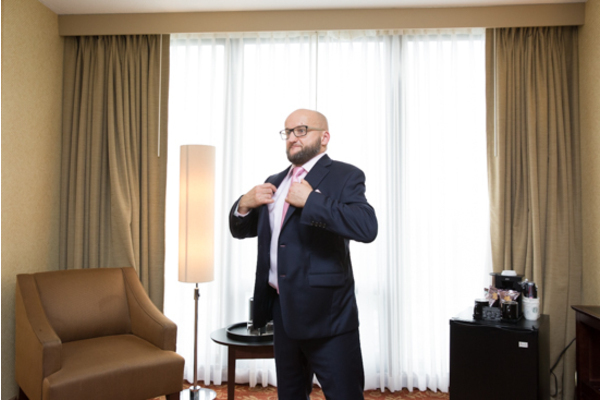 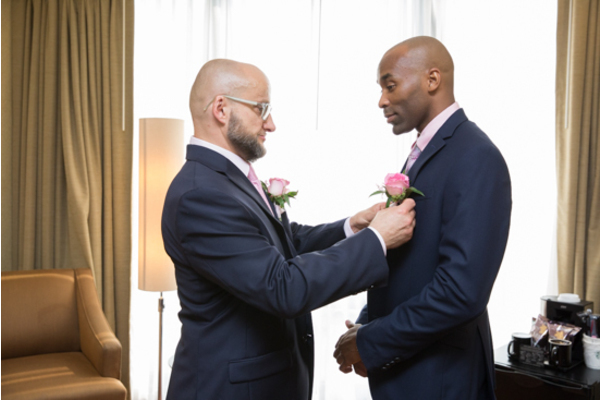 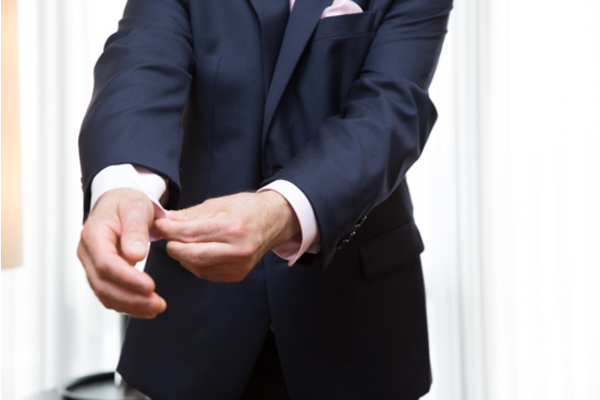 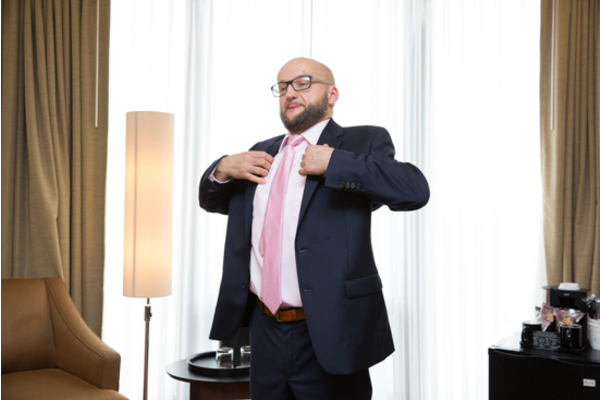 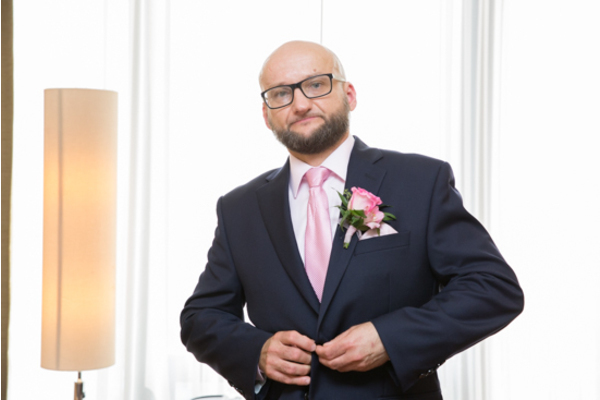 He received help from his best man putting on his cufflinks. 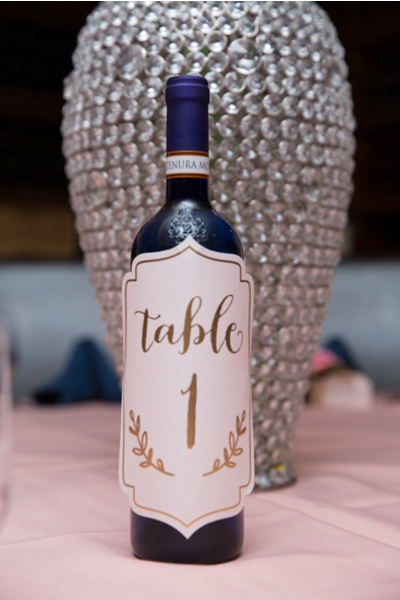 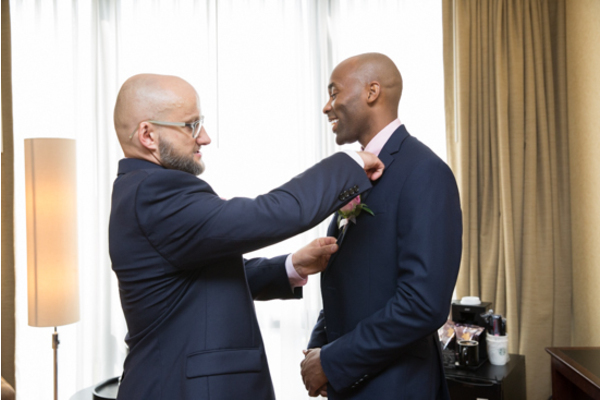 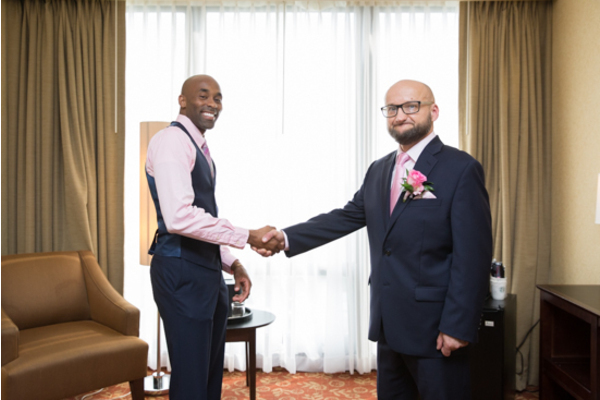 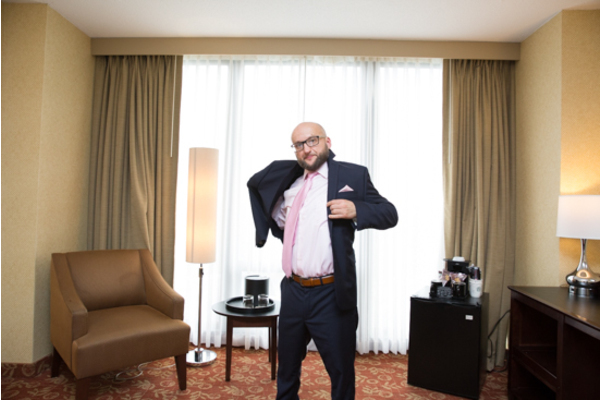 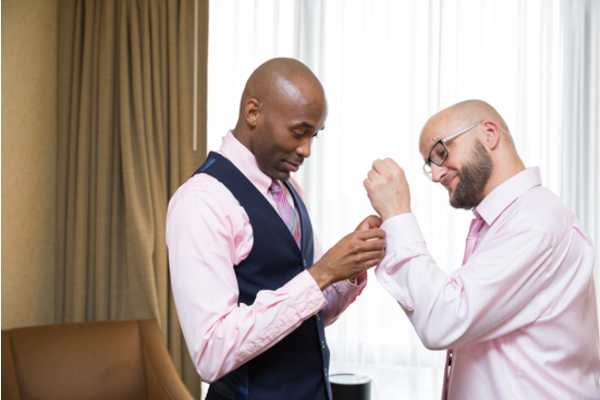 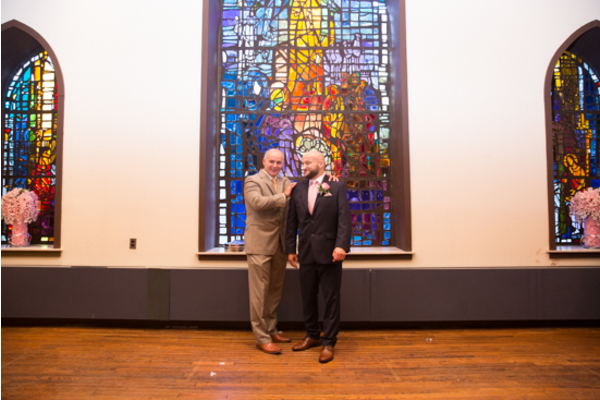 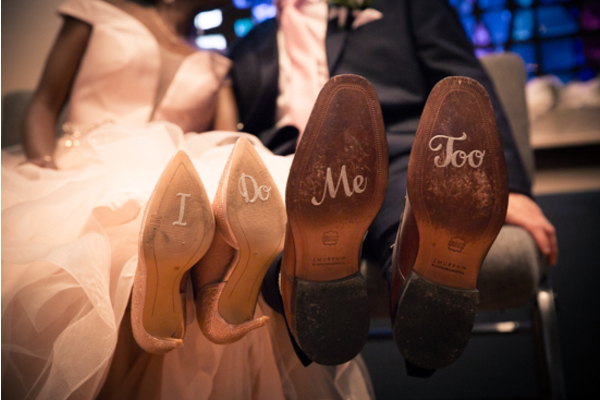 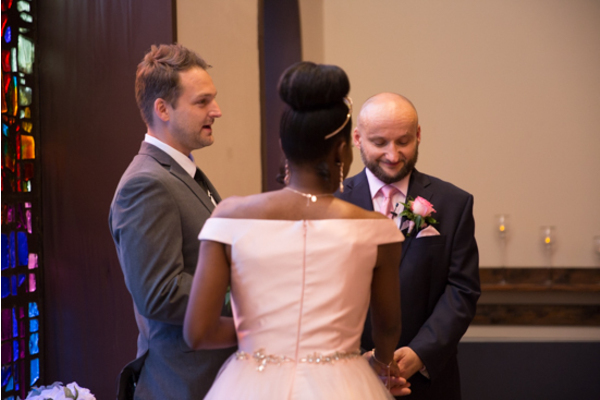 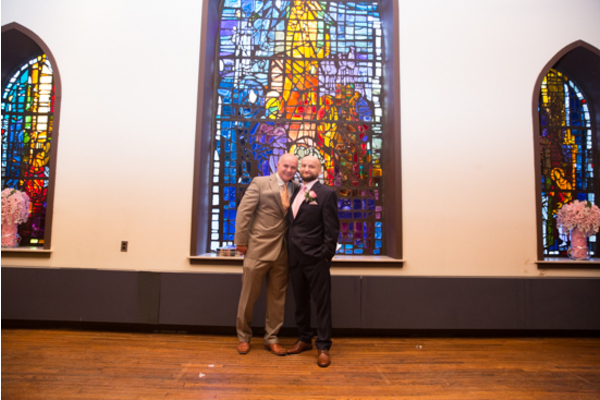 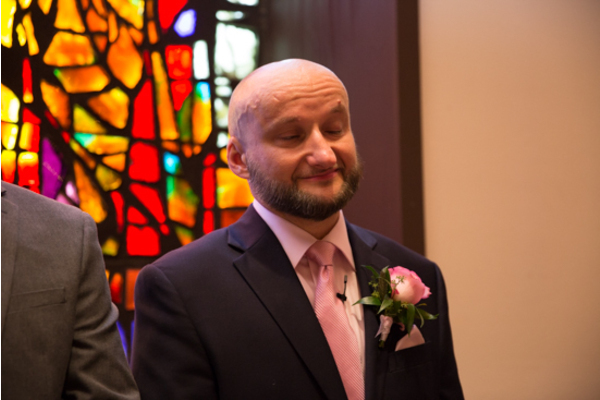 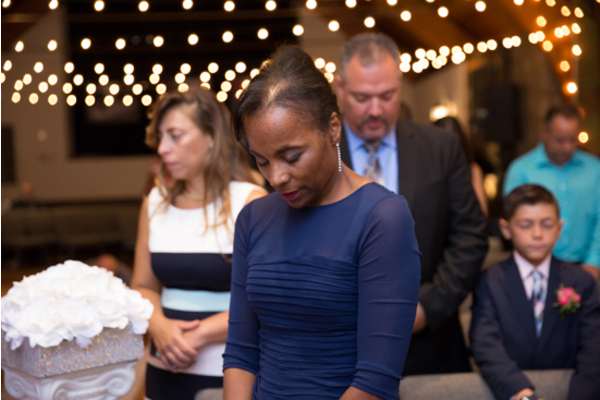 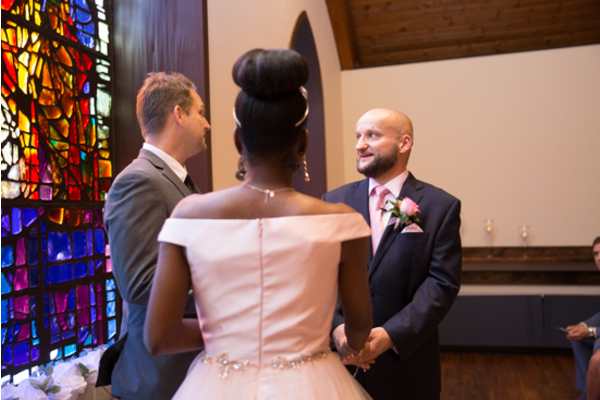 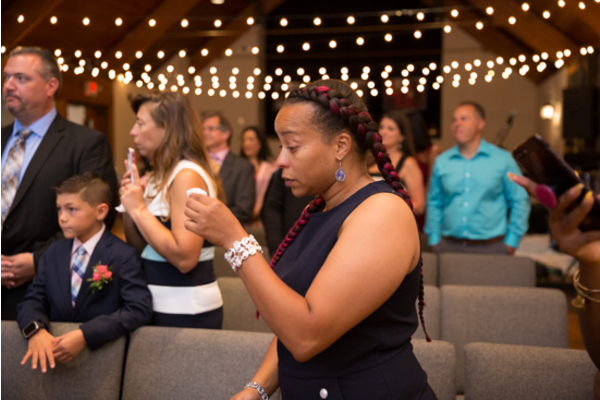 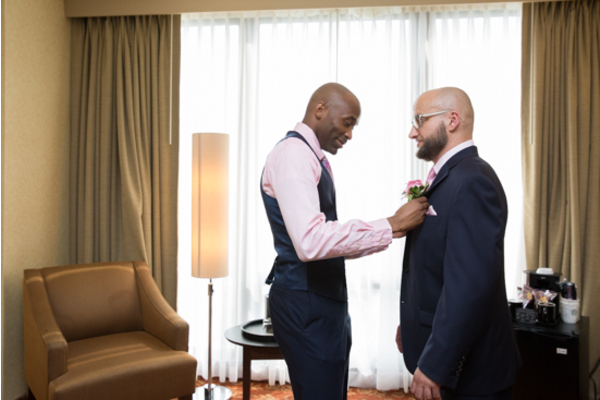 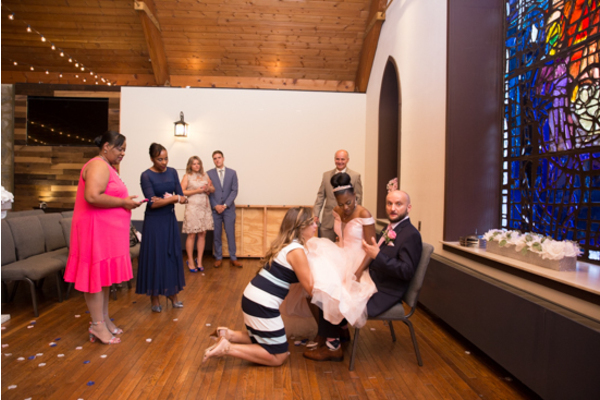 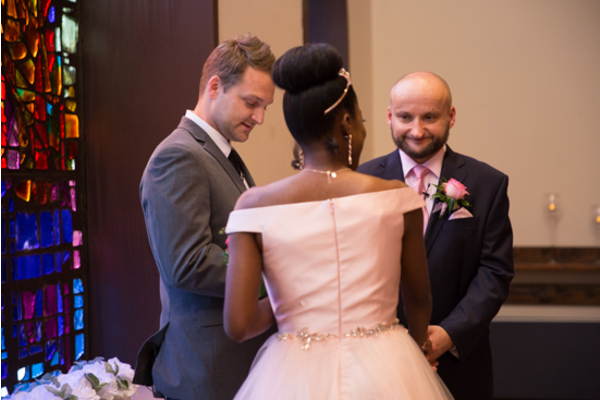 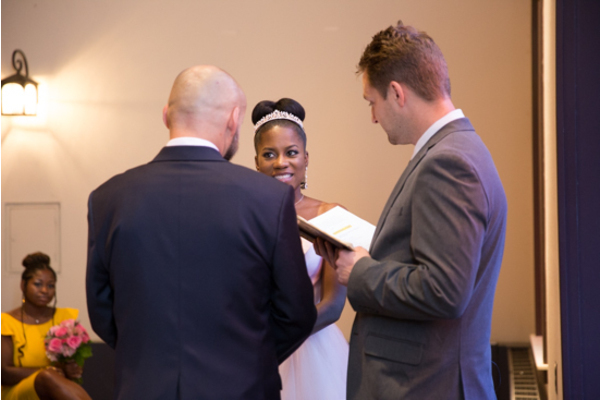 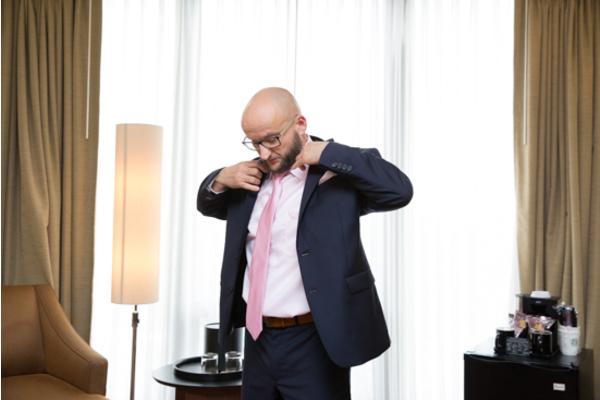 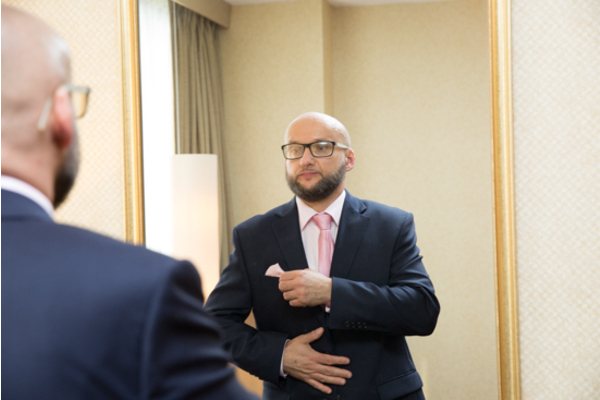 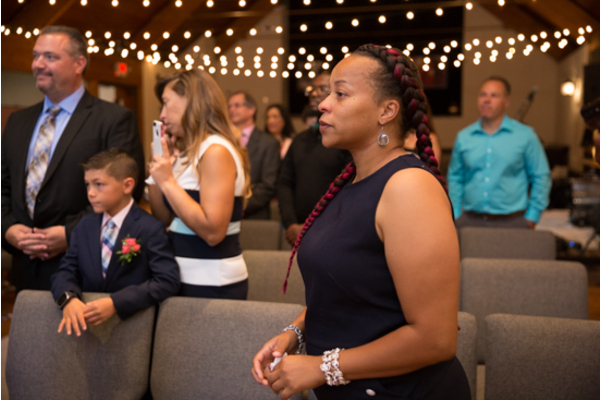 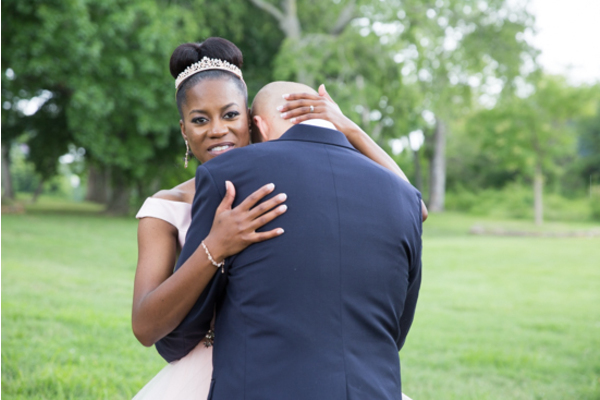 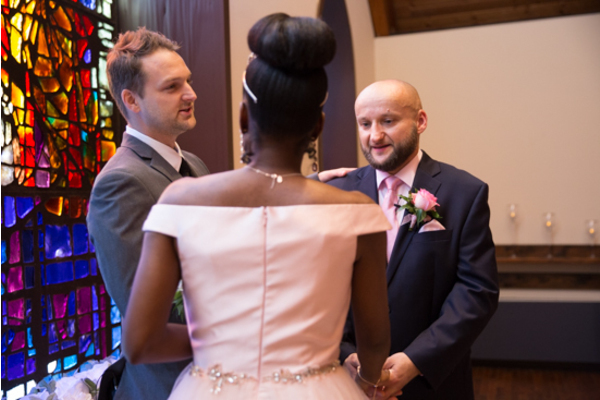 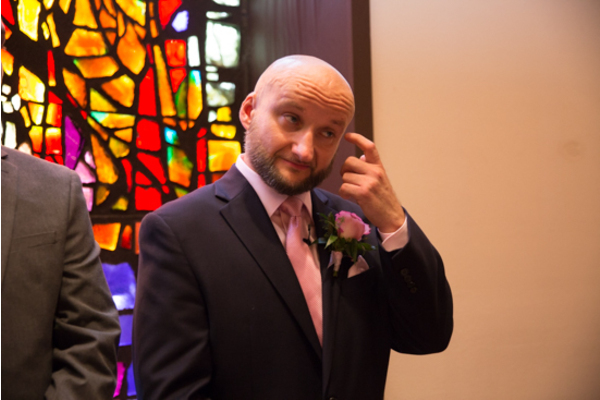 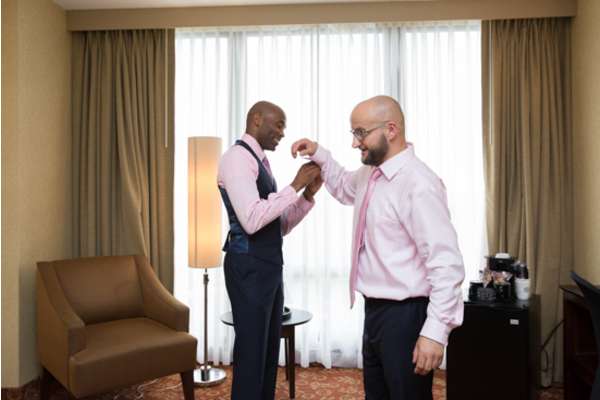 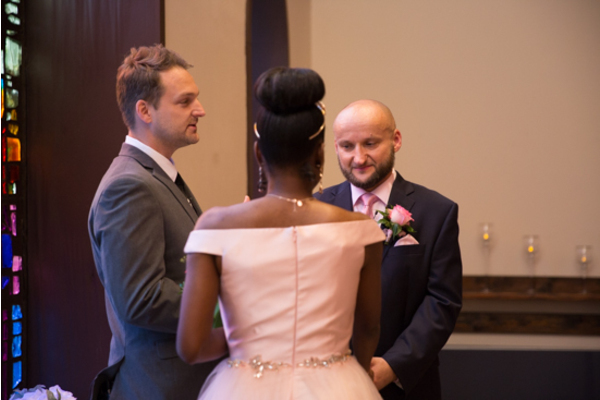 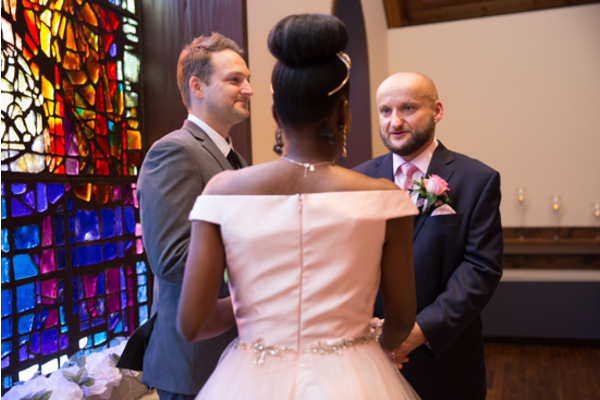 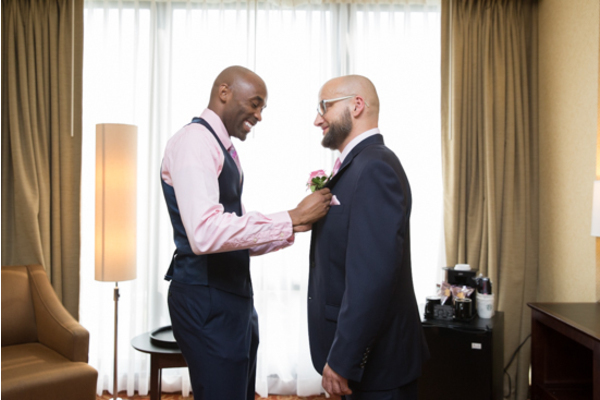 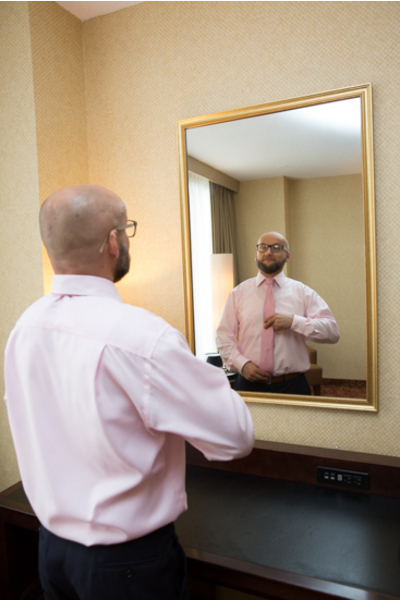 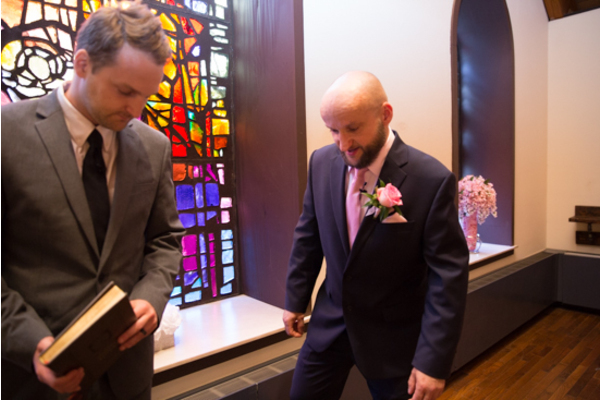 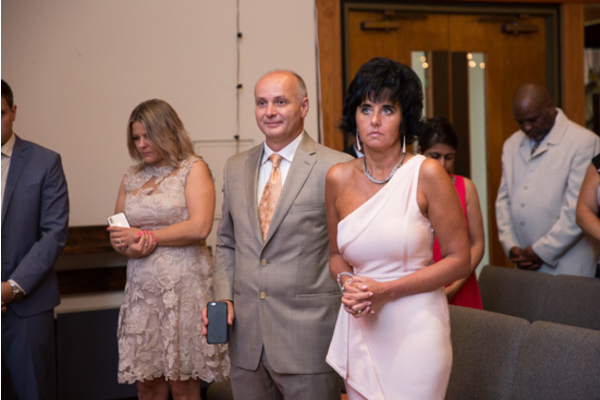 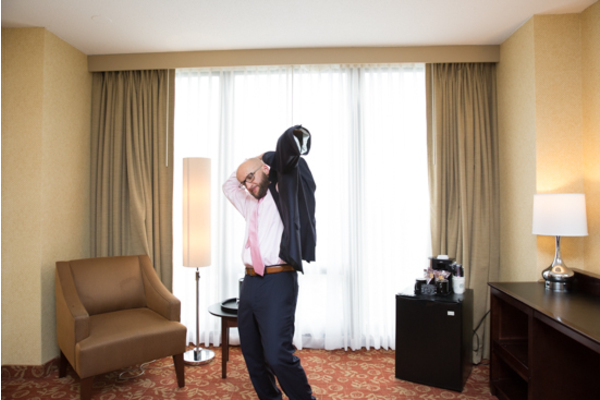 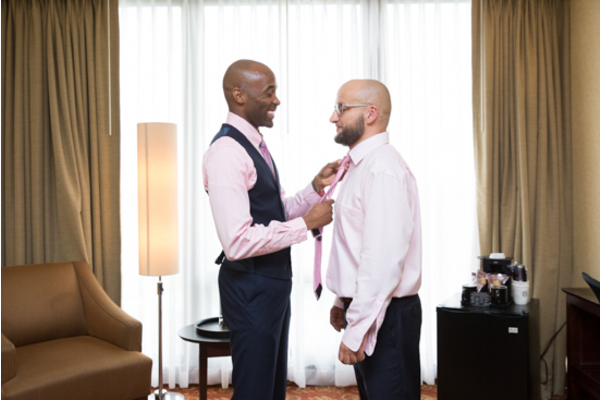 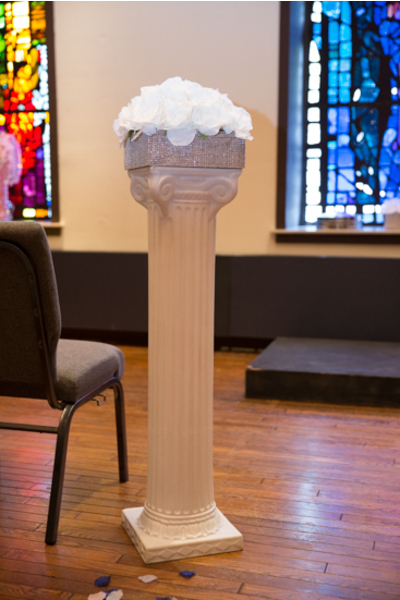 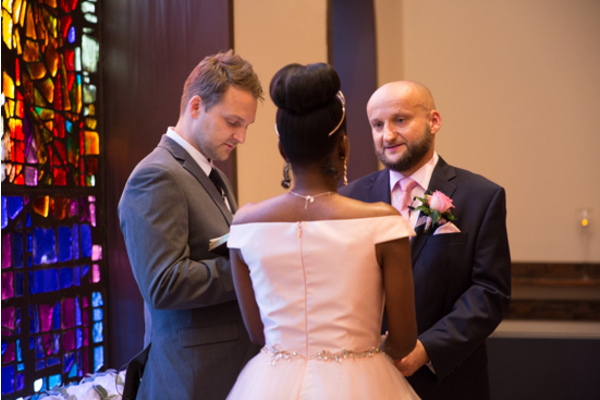 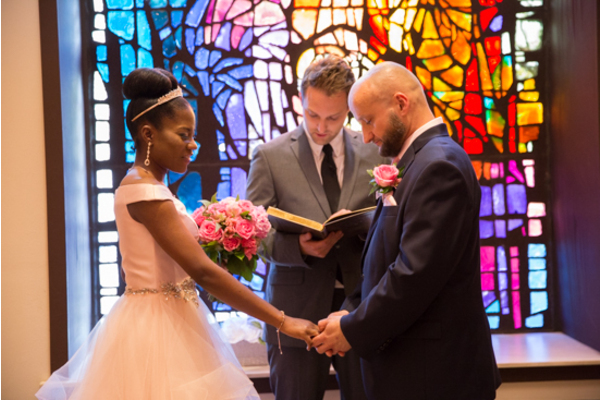 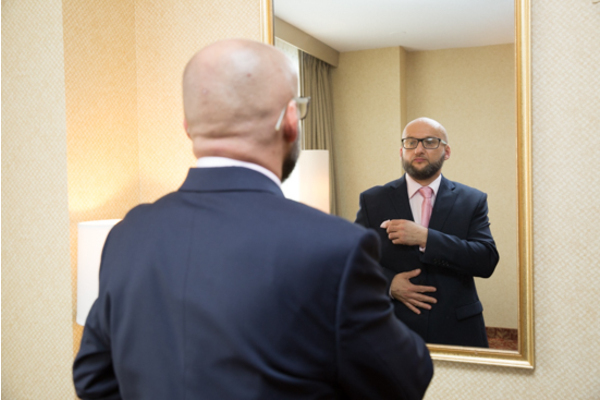 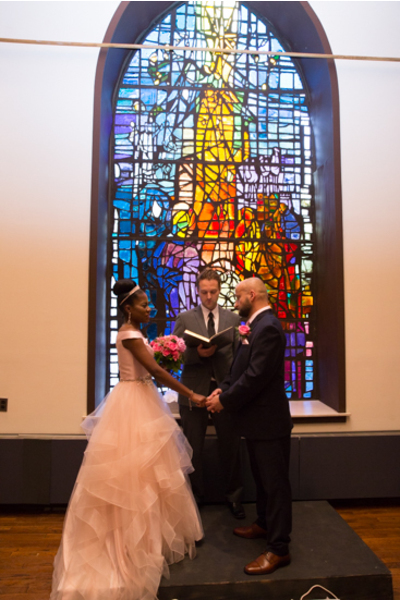 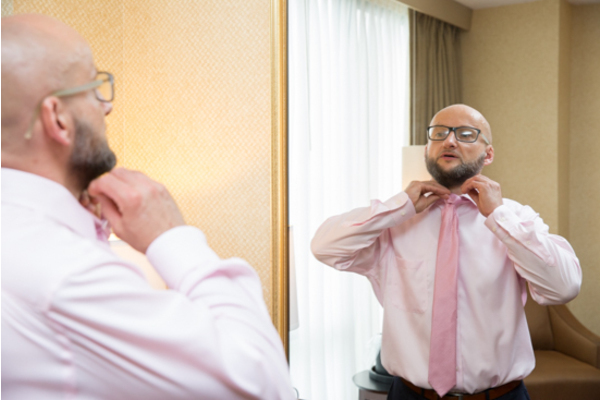 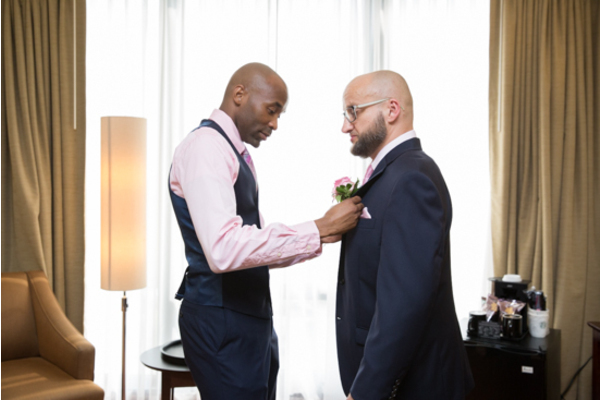 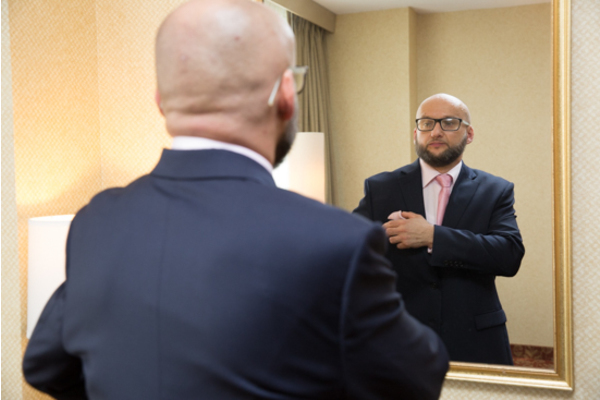 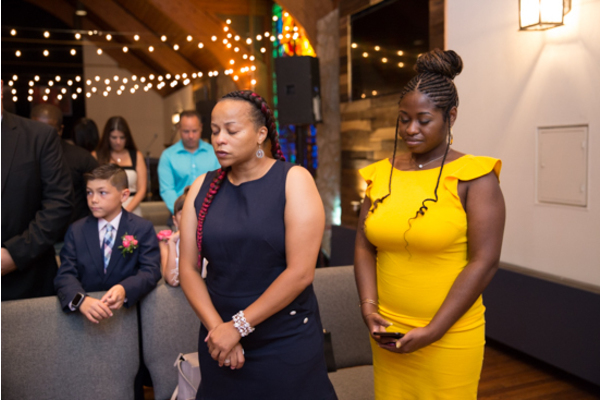 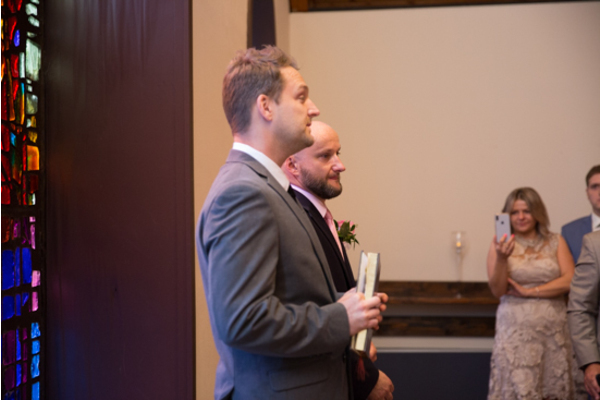 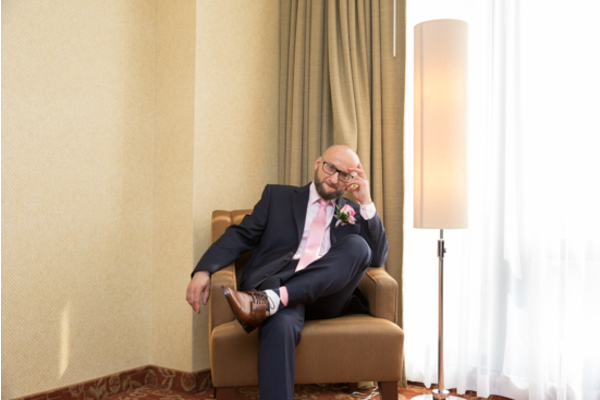 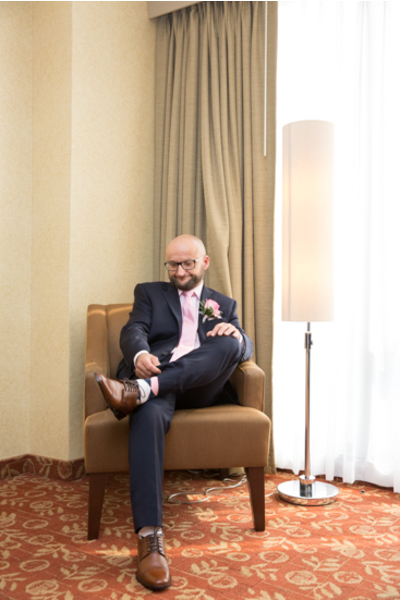 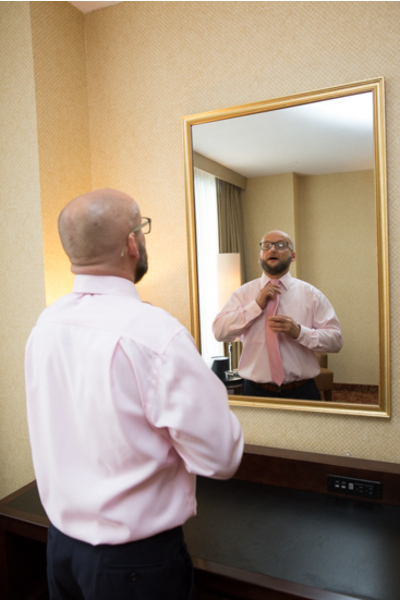 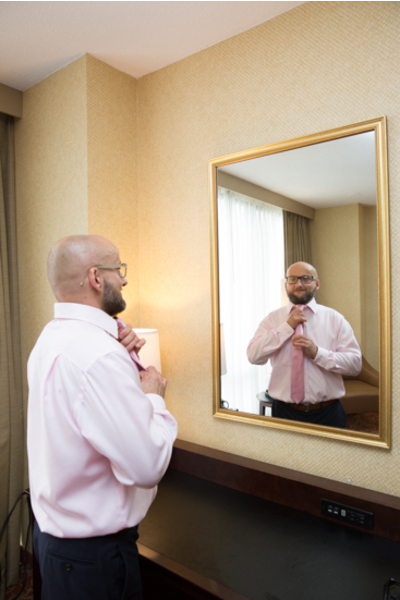 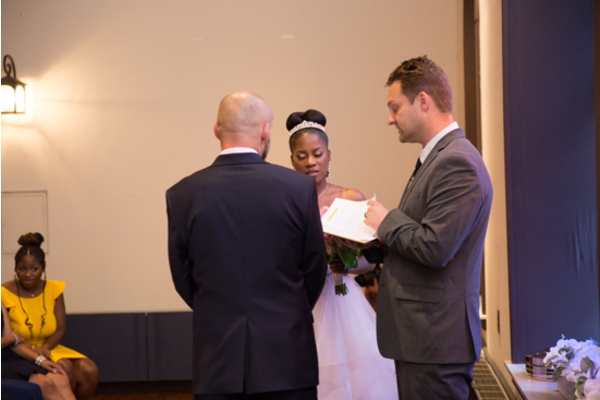 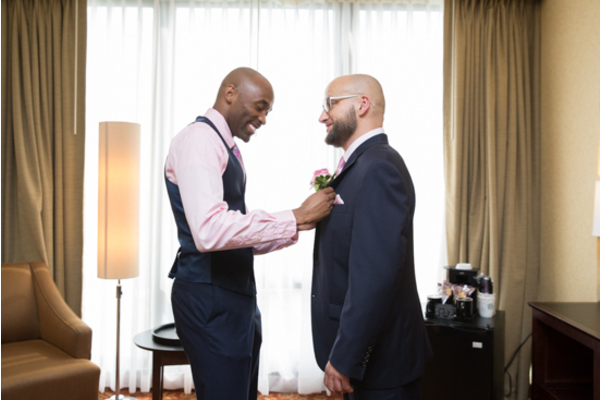 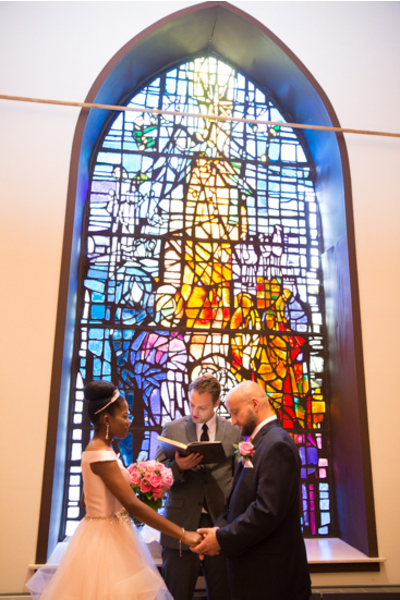 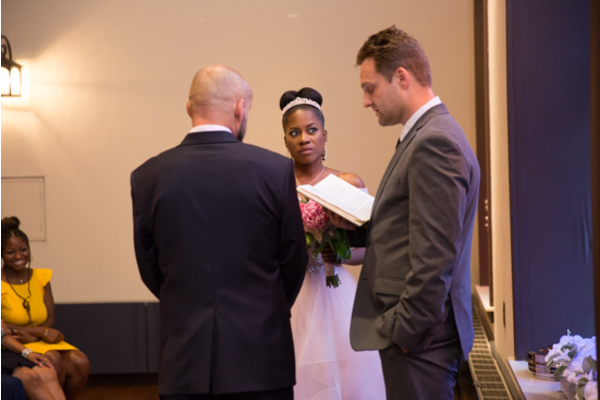 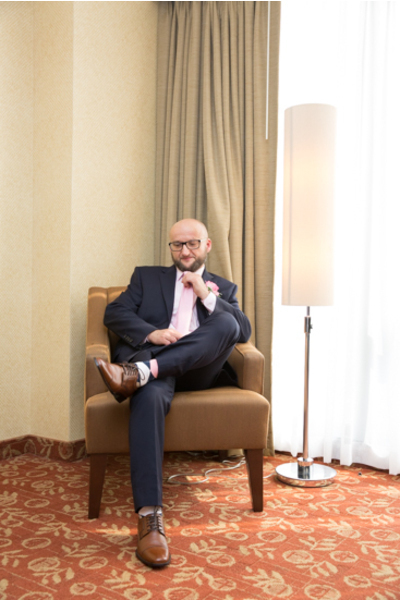 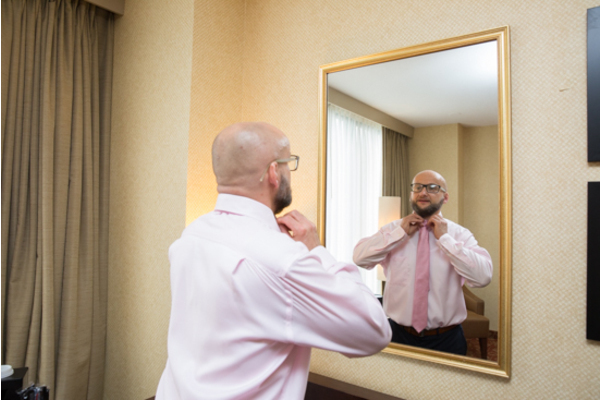 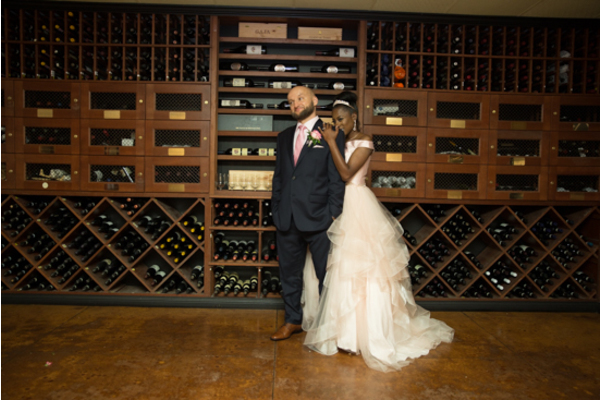 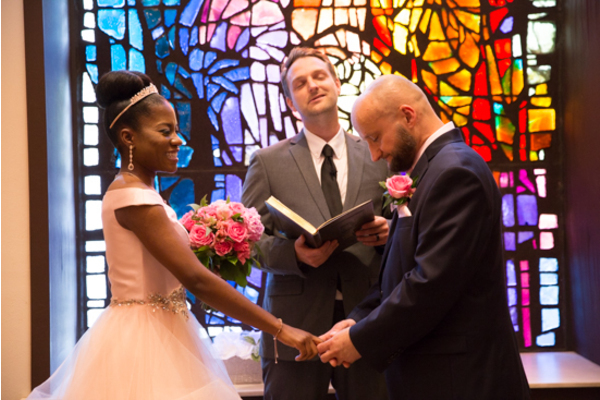 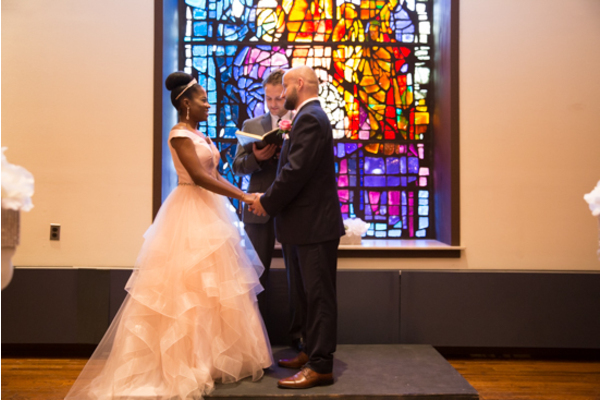 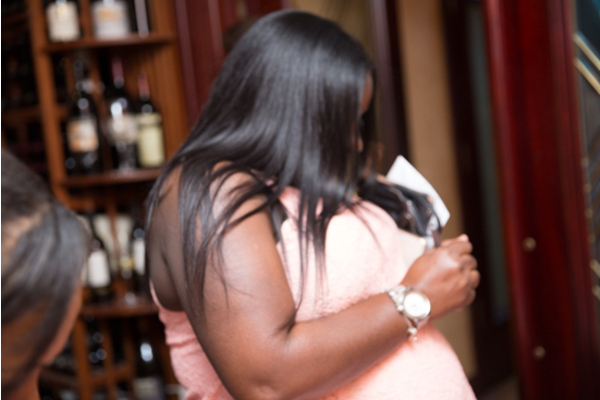 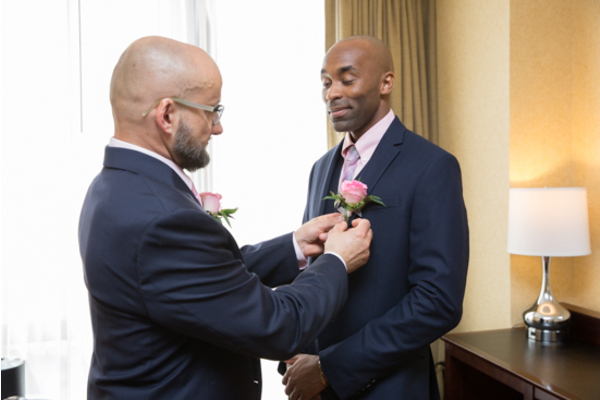 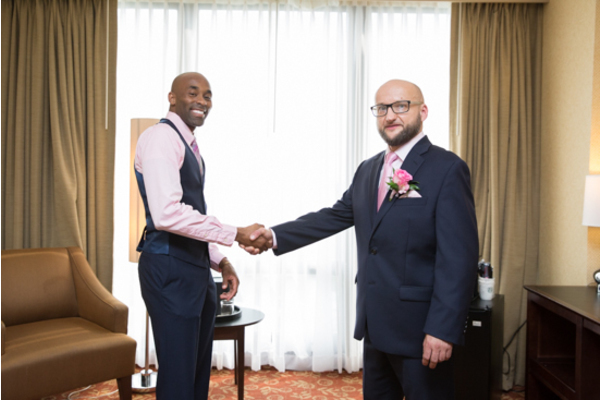 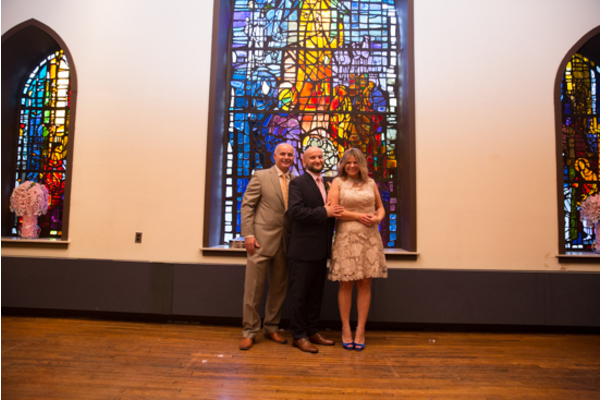 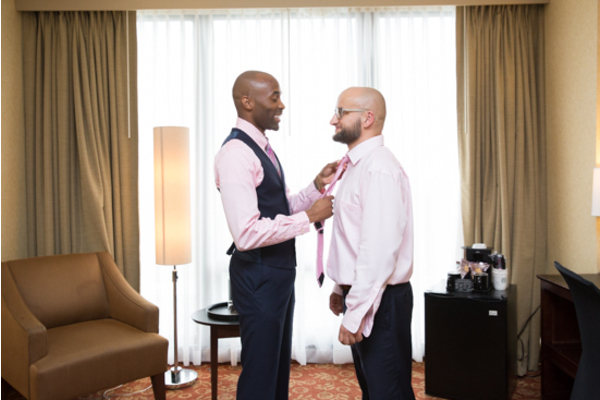 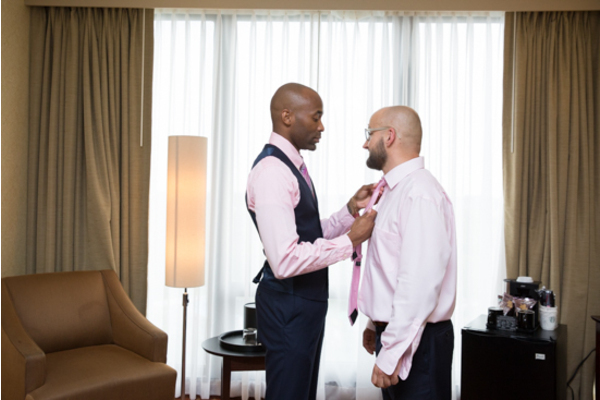 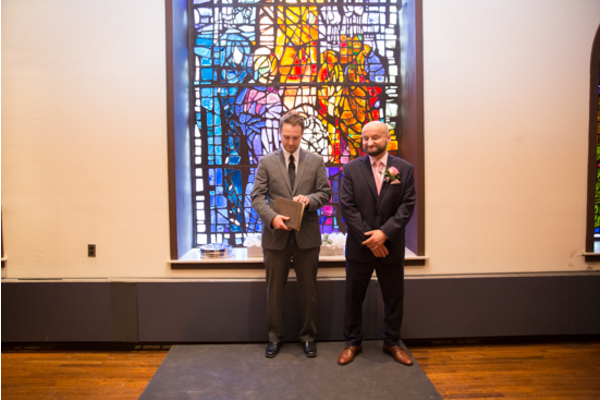 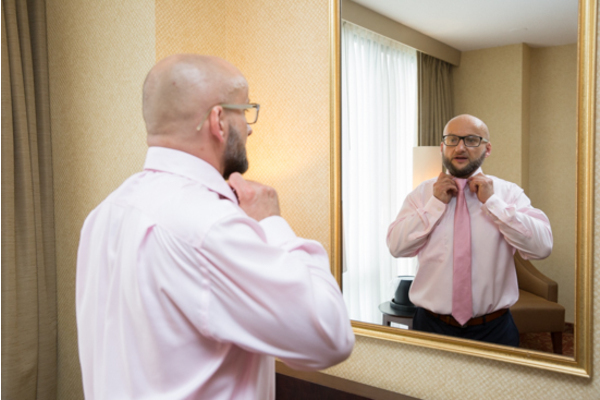 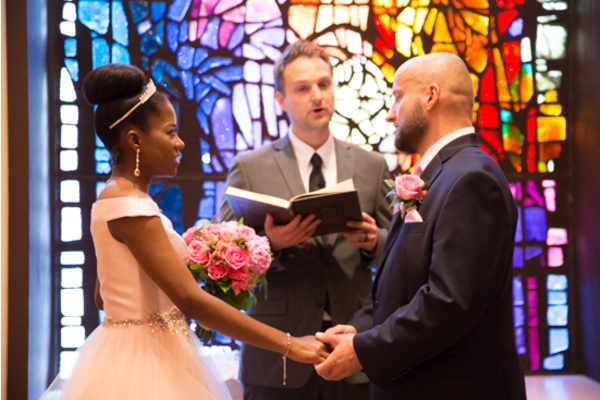 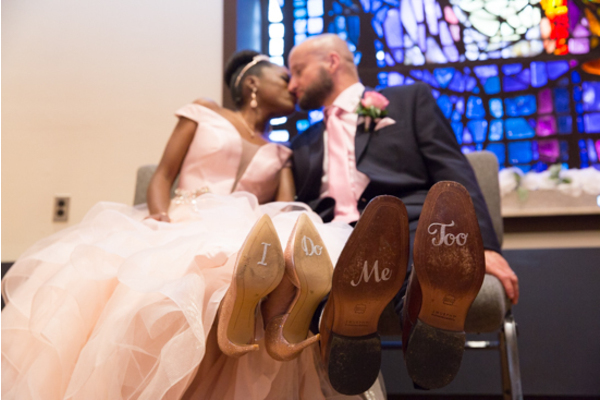 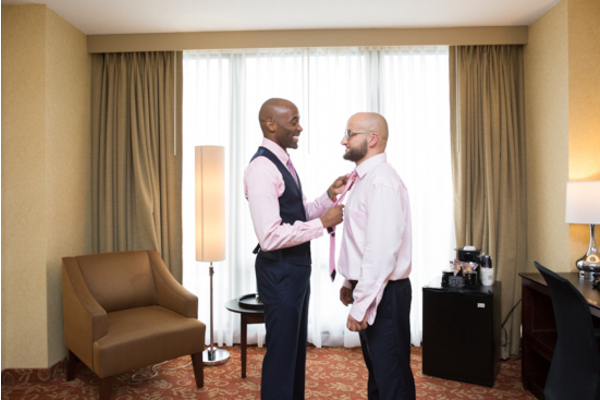 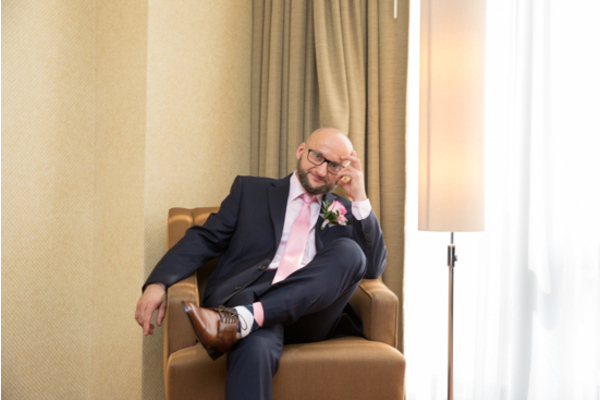 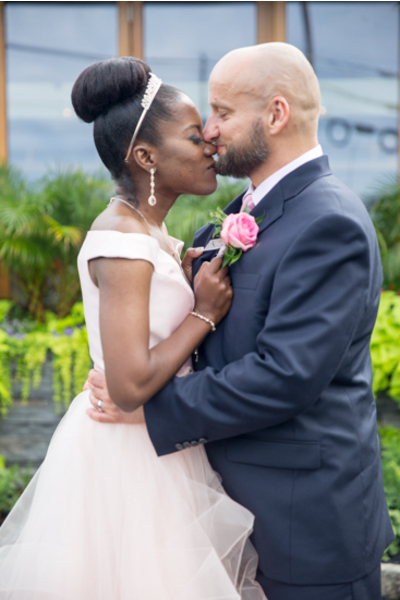 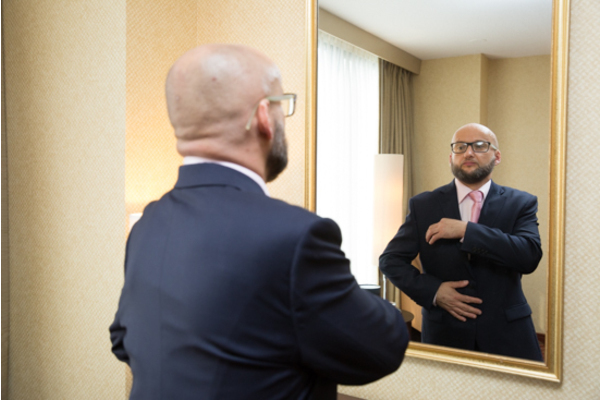 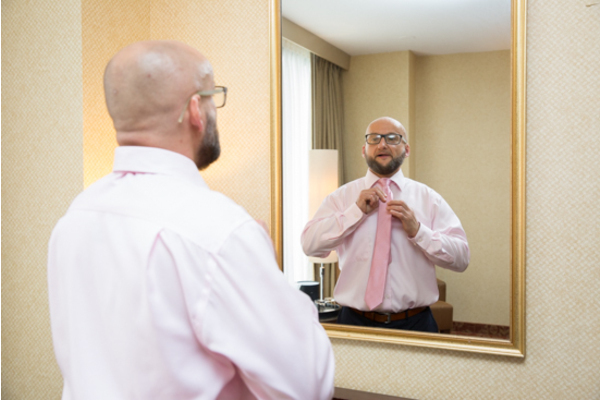 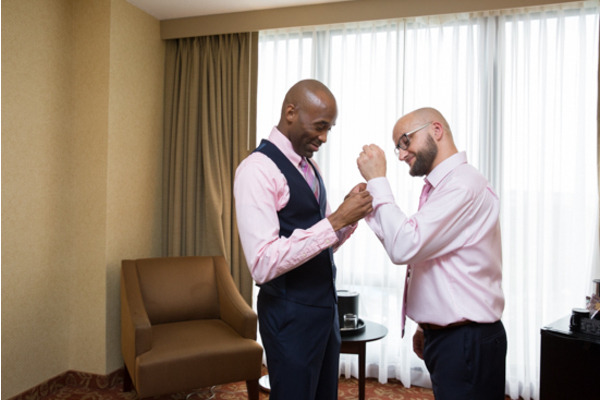 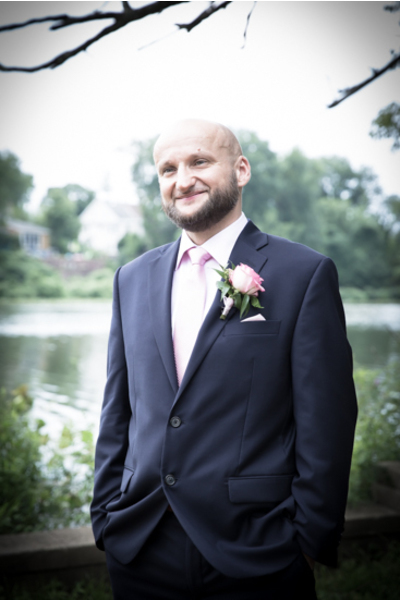 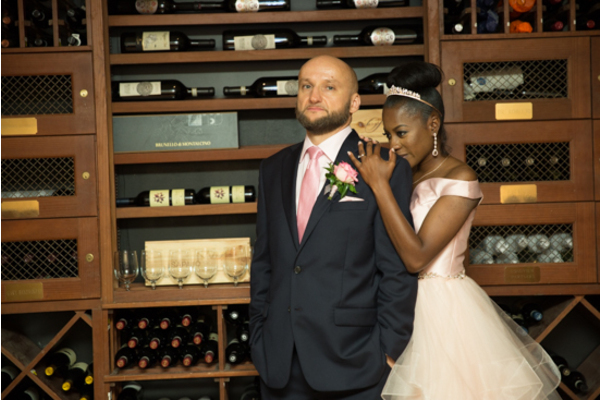 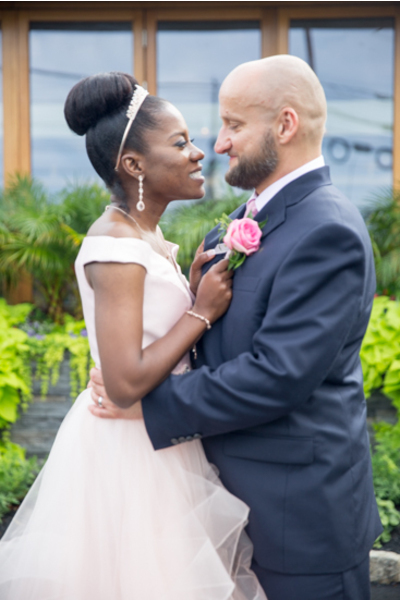 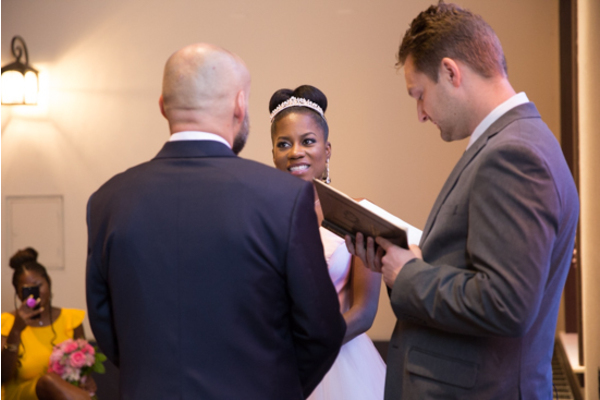 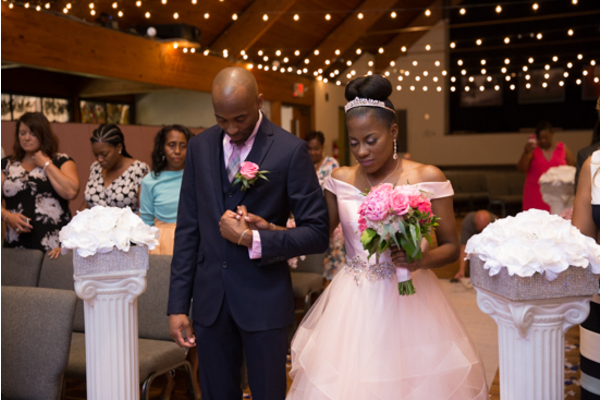 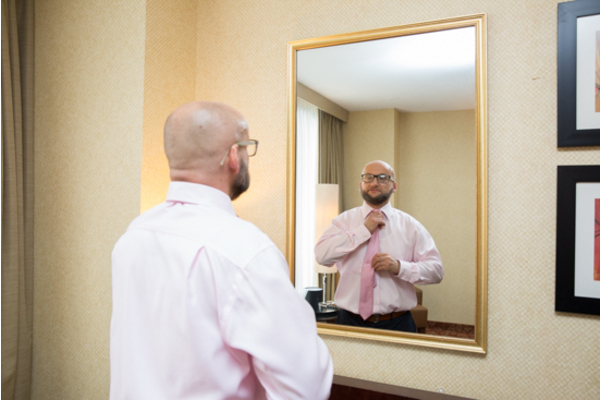 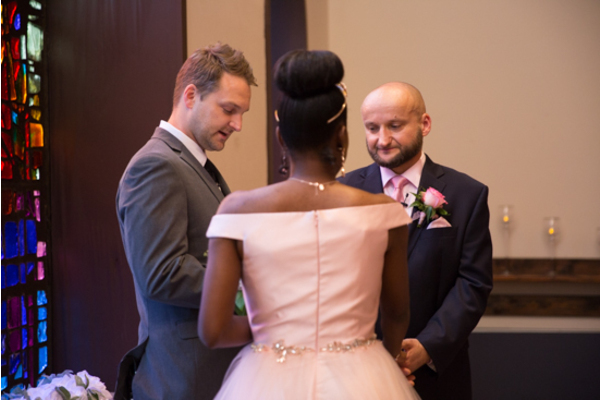 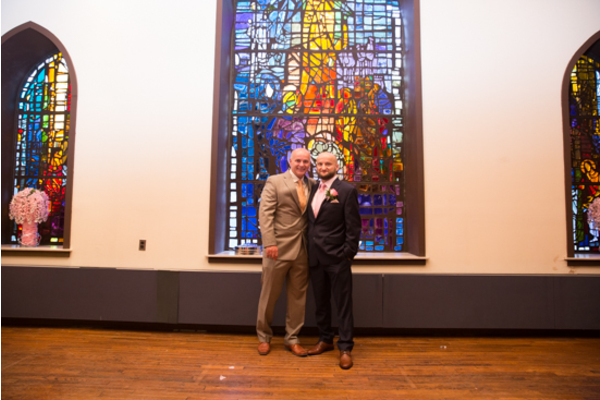 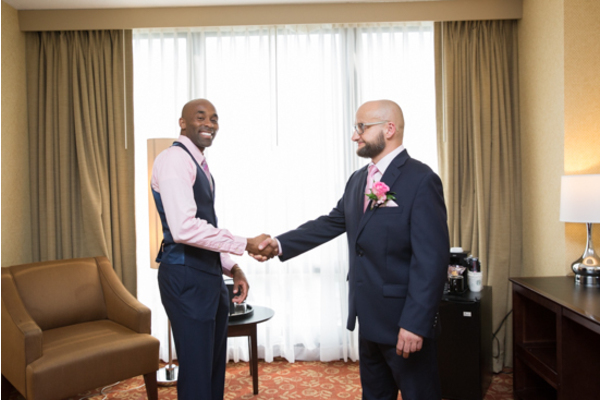 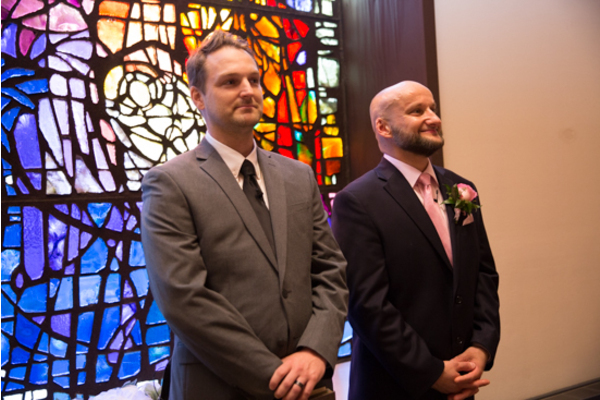 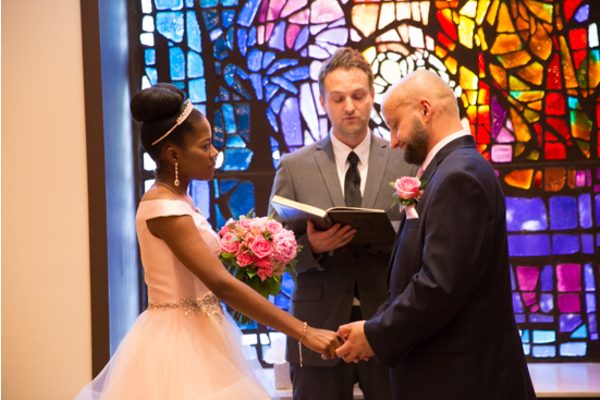 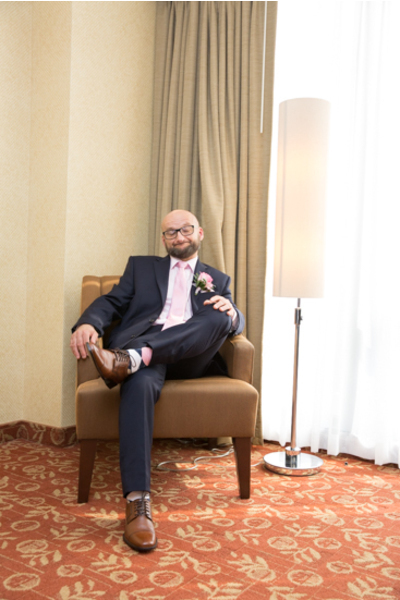 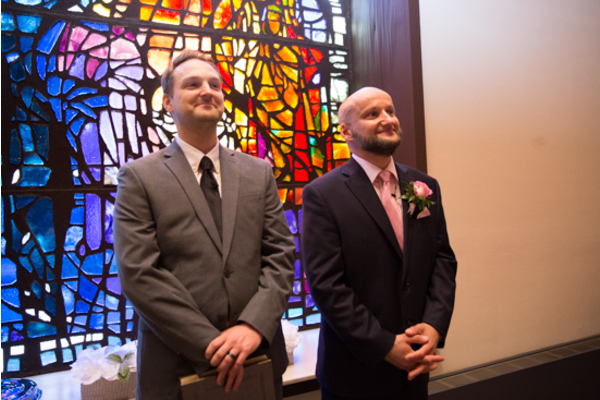 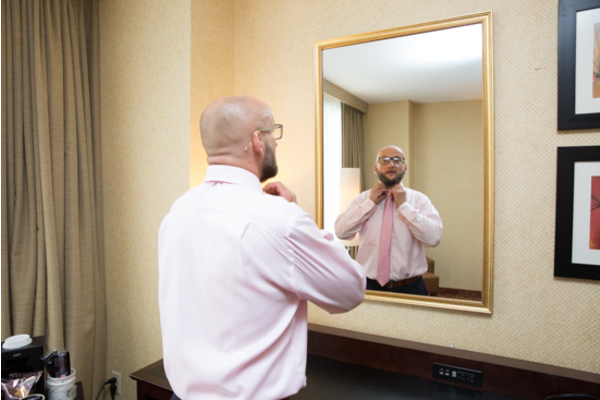 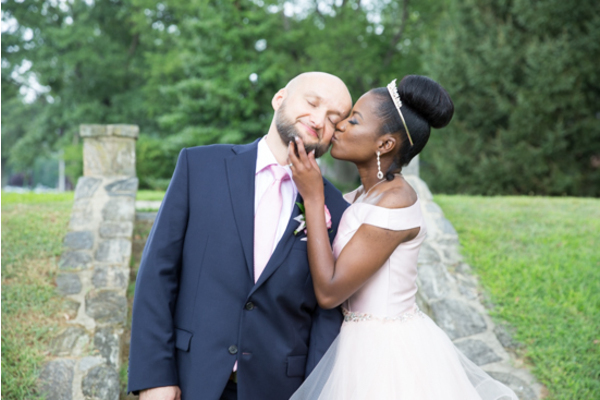 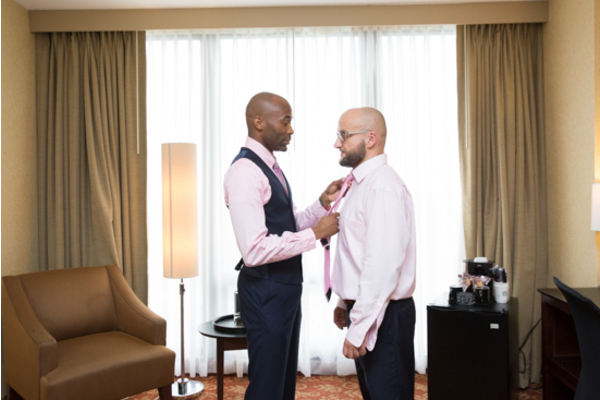 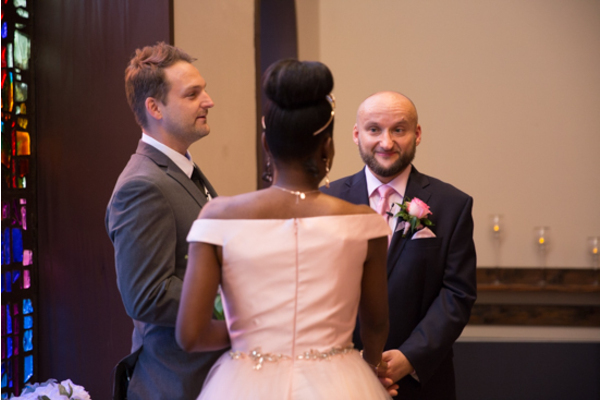 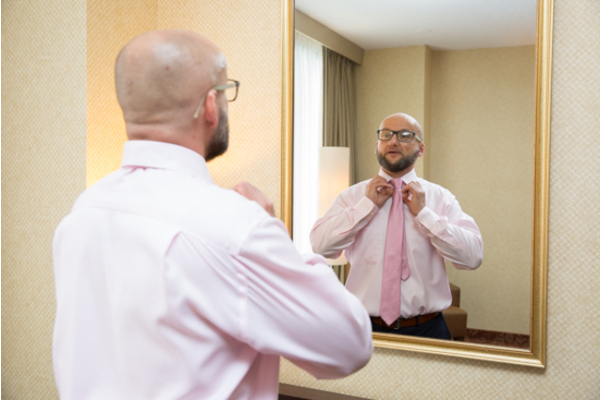 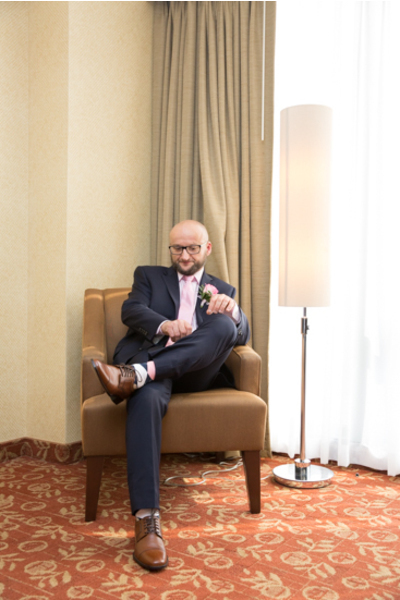 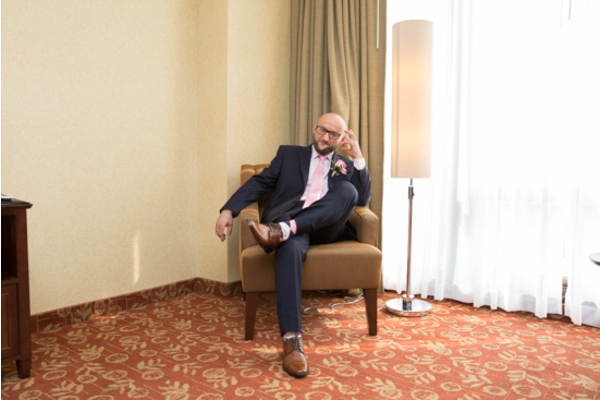 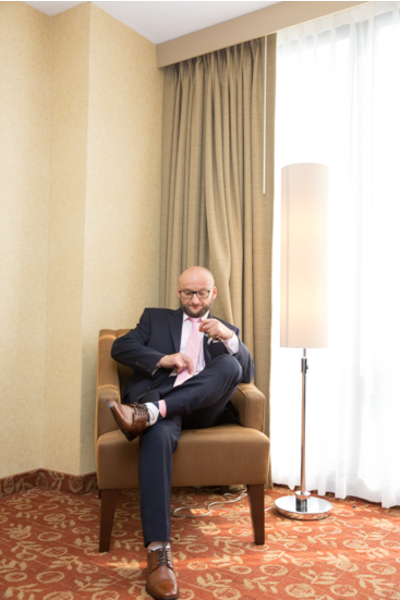 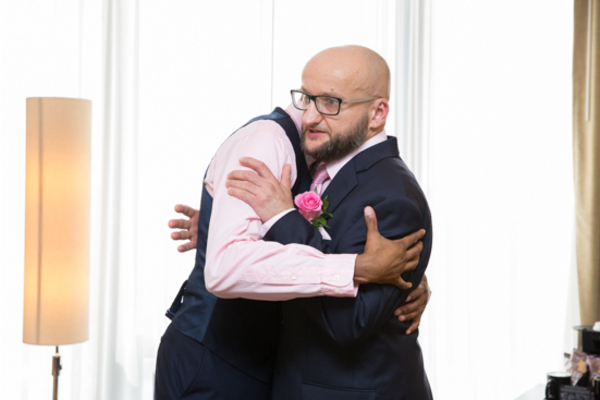 Our NJ Wedding Photographer snapped a few photos of the two preparing to say “I Do”. 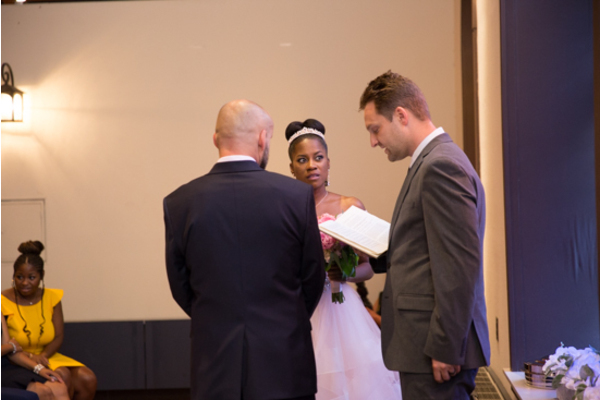 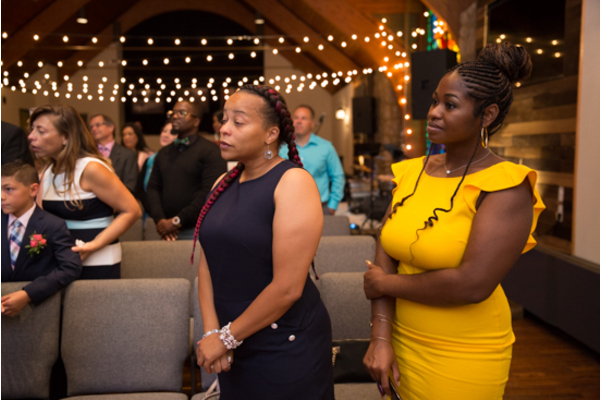 Next, it was time for the ceremony! 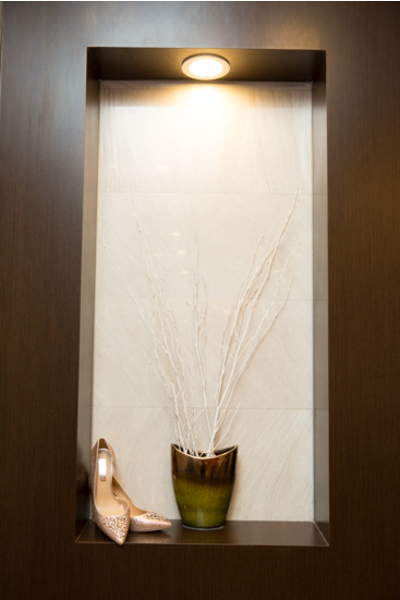 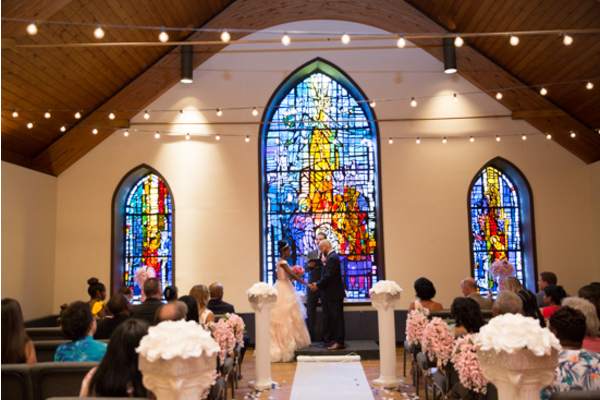 The twinkle lights that hung from the ceiling added an elegant touch to the room. 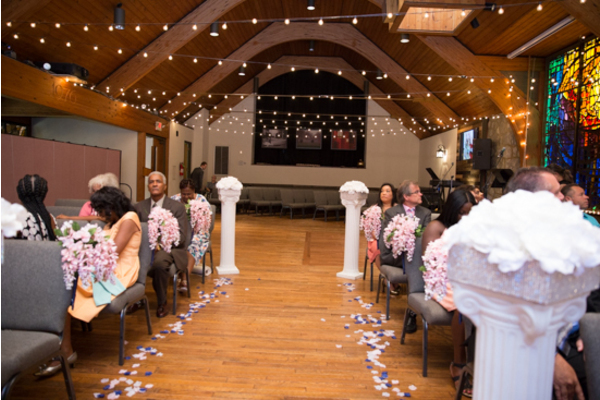 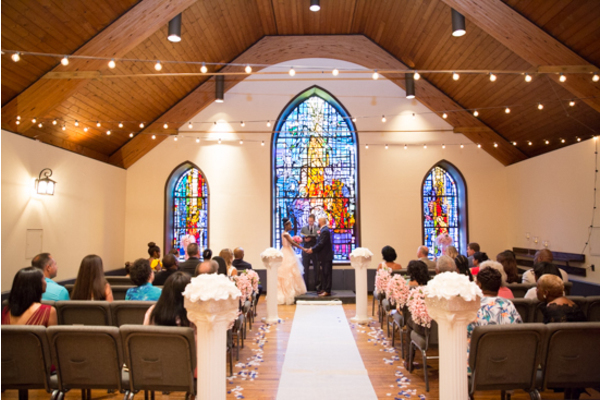 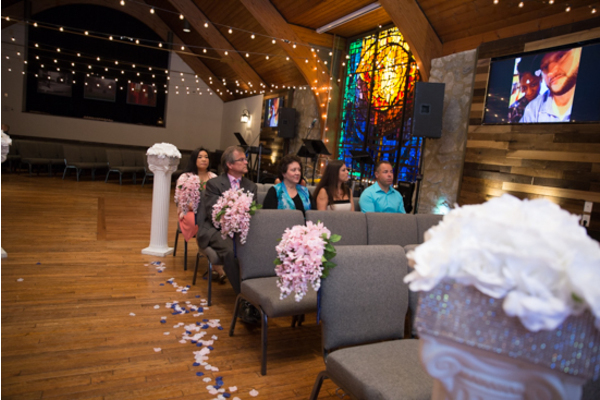 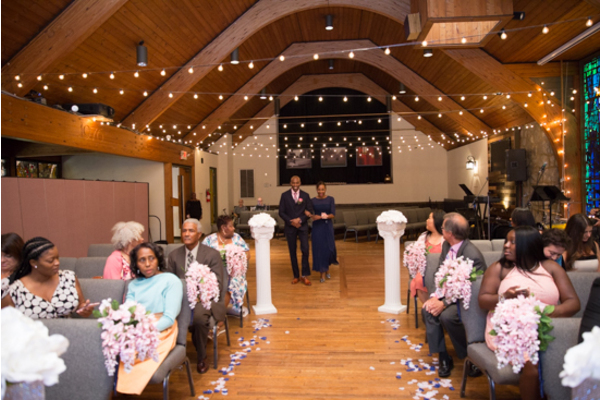 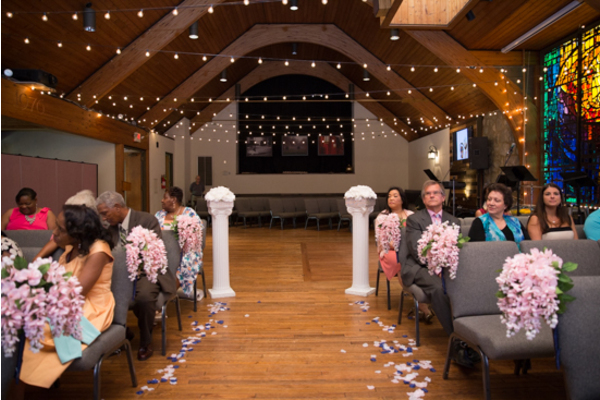 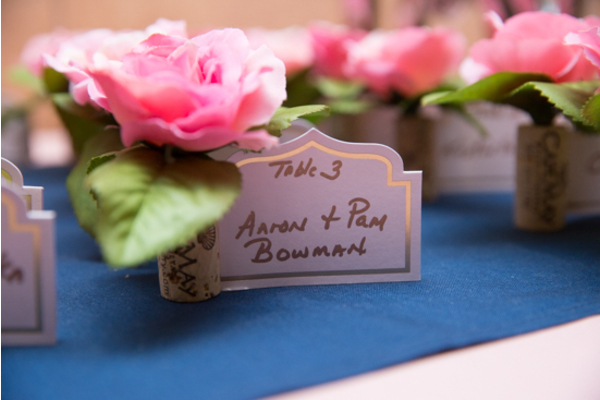 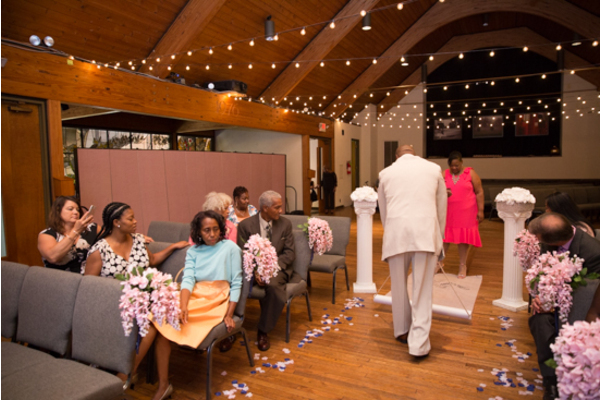 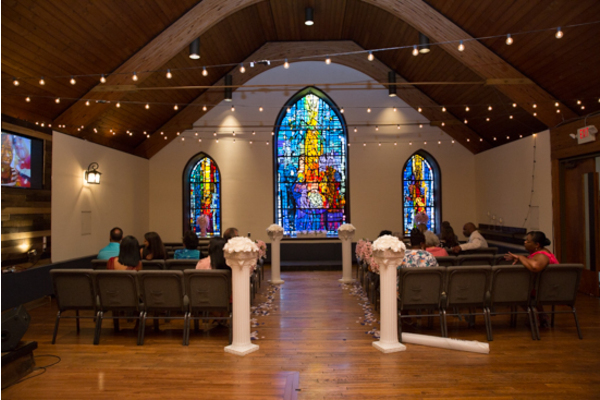 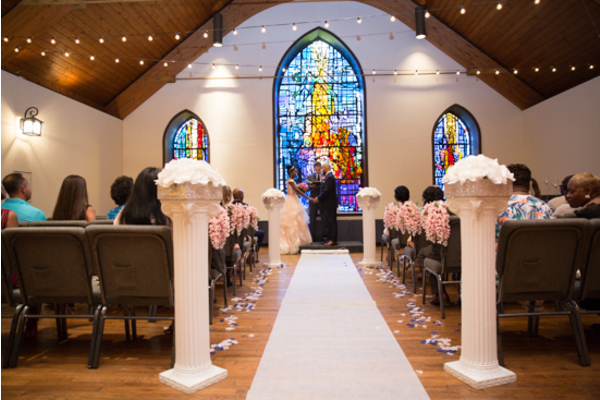 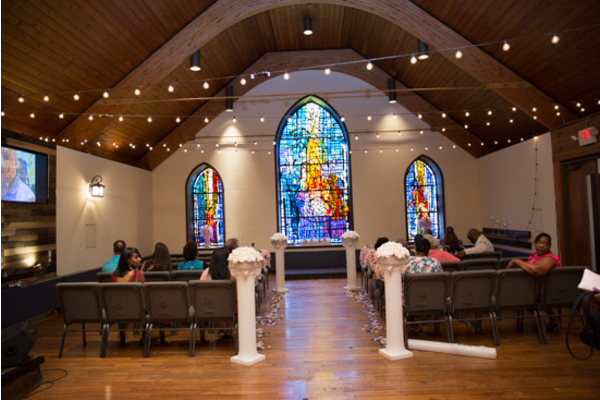 Additionally, the aisle was lined with flower petals to match their theme. 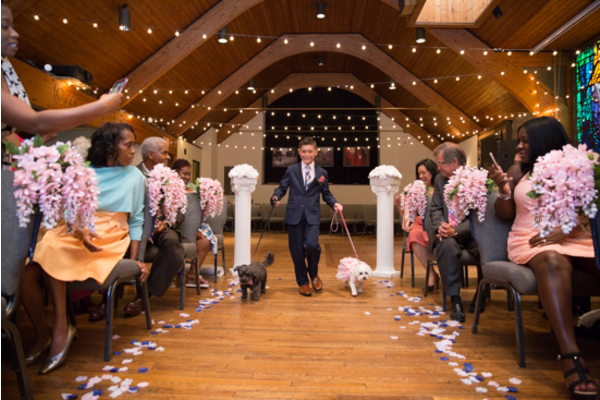 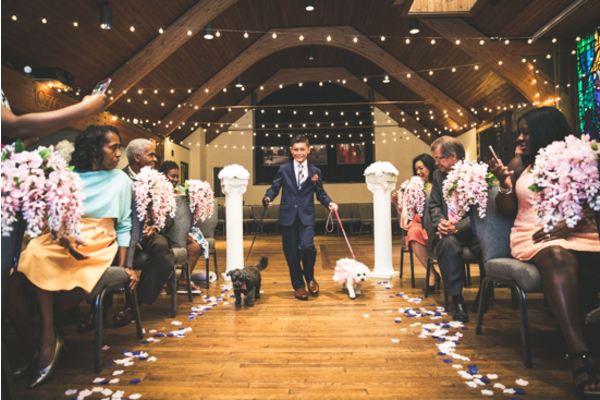 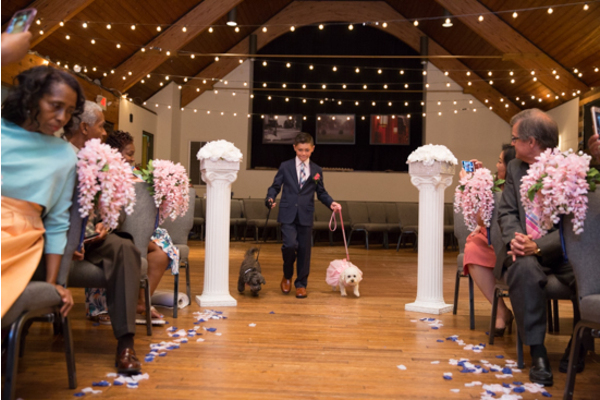 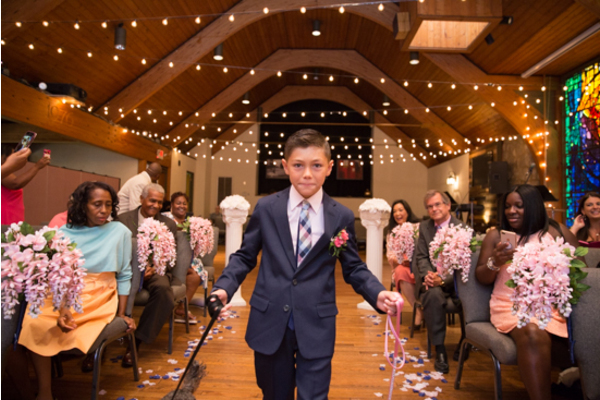 The ring barrier walked down the aisle escorted by two adorable puppies! 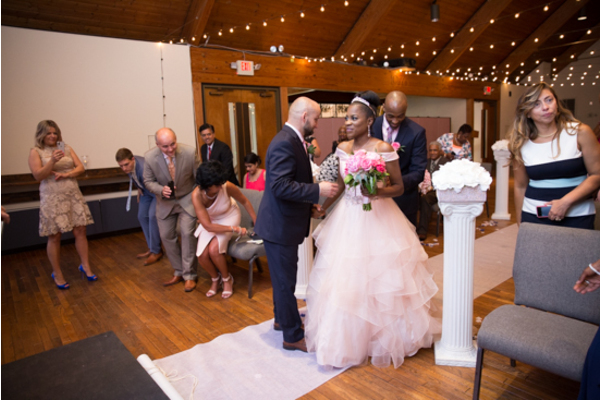 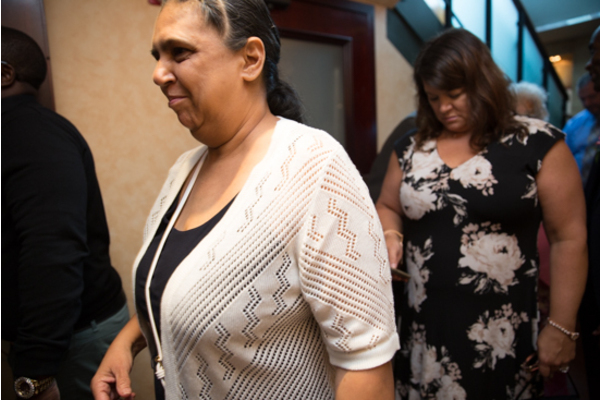 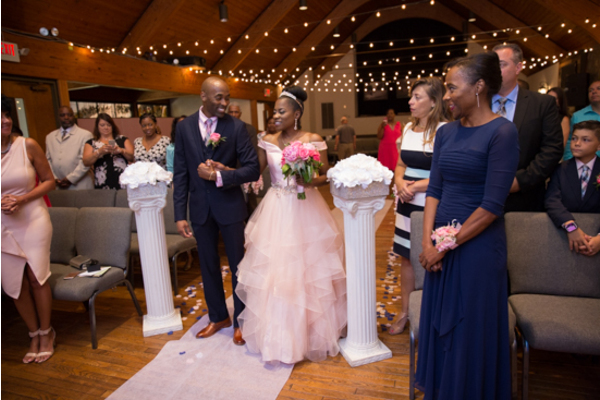 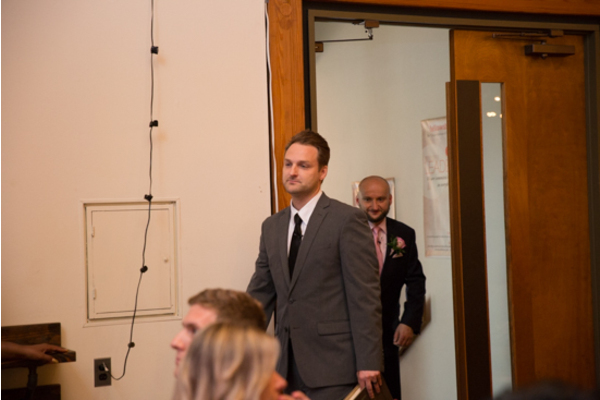 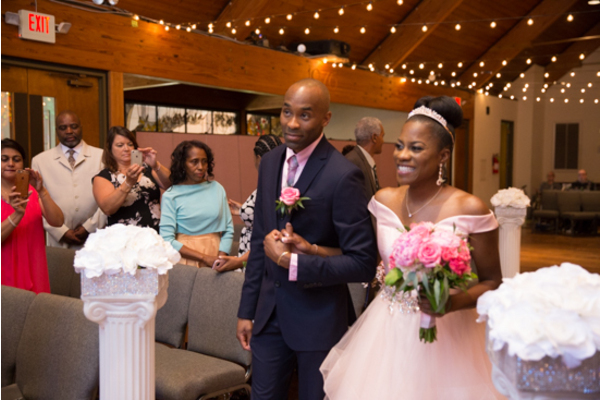 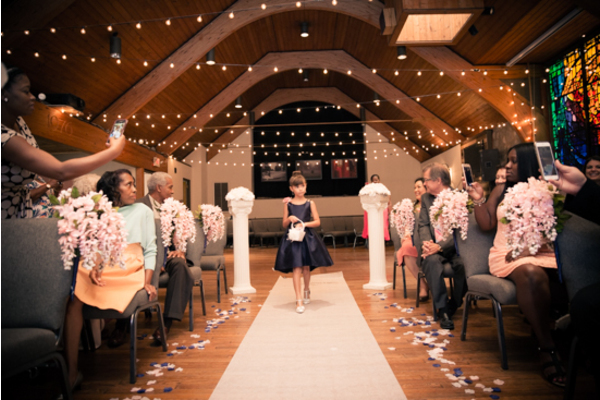 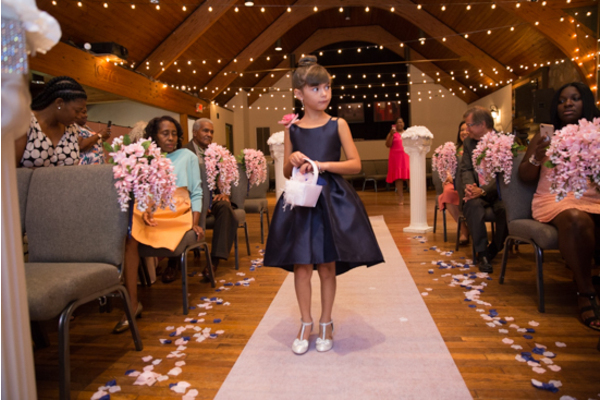 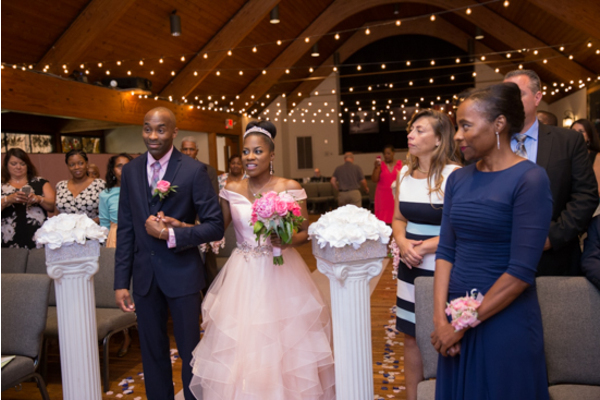 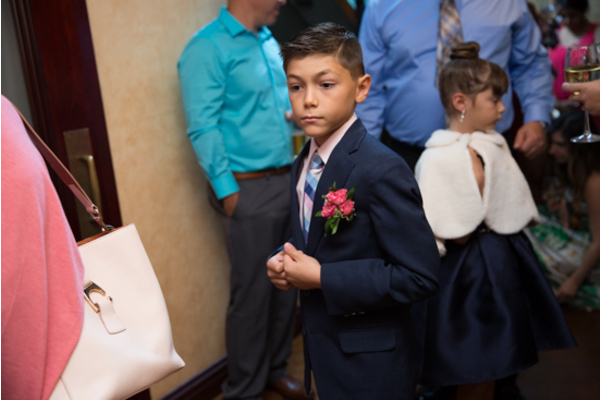 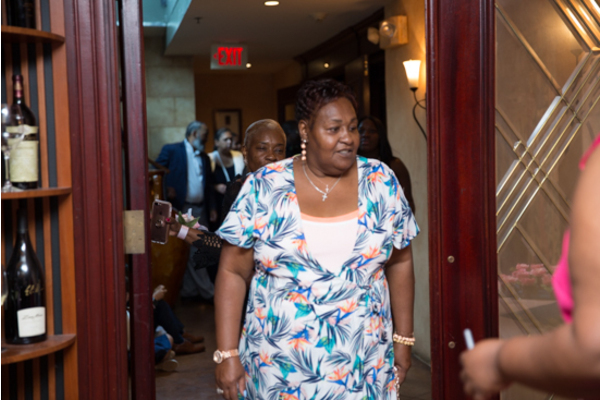 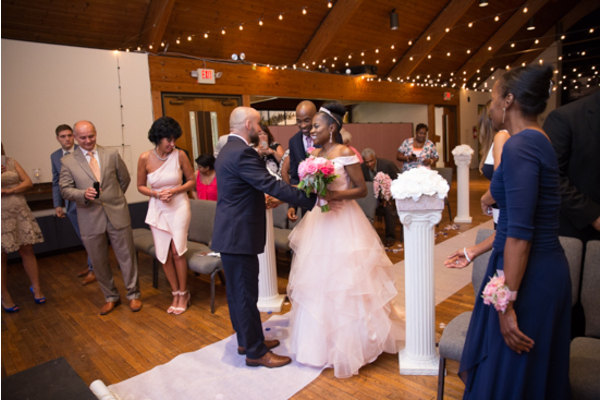 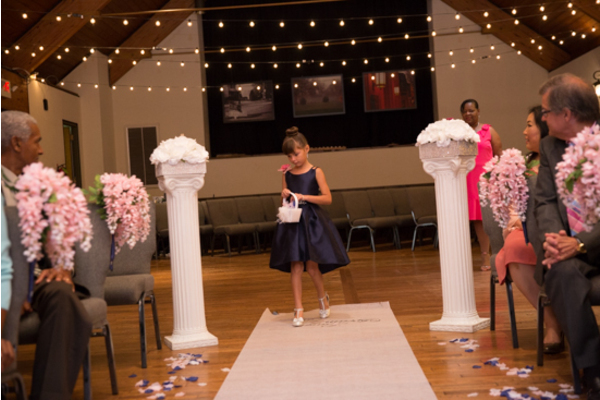 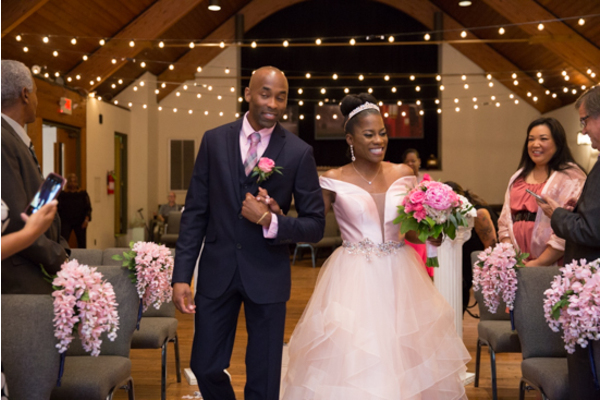 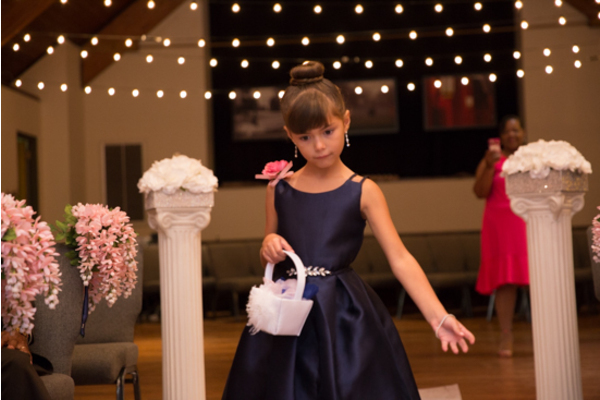 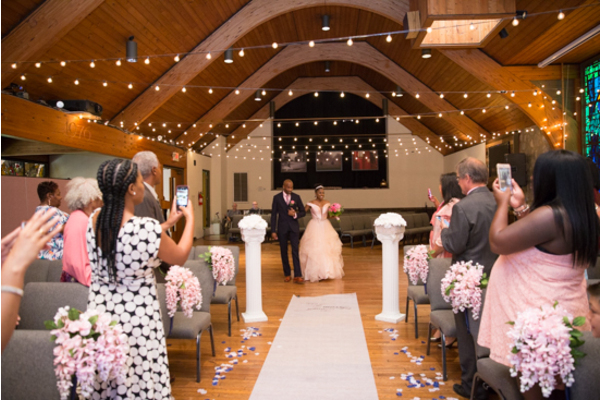 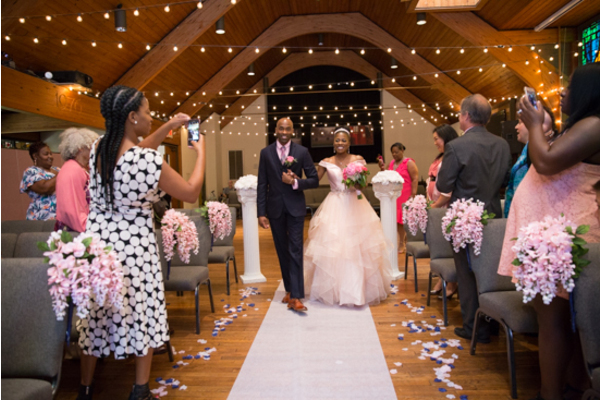 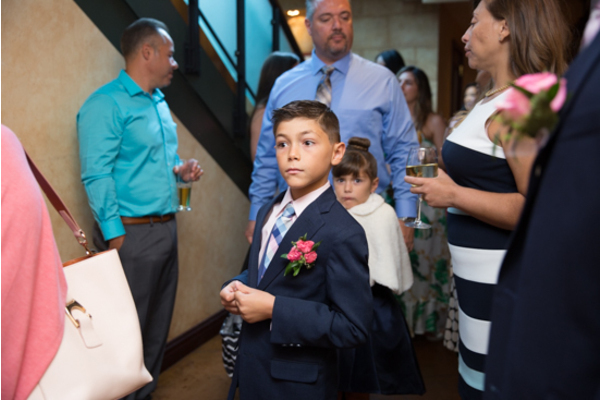 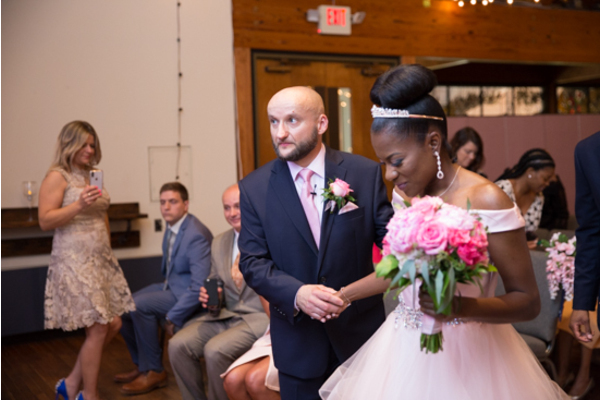 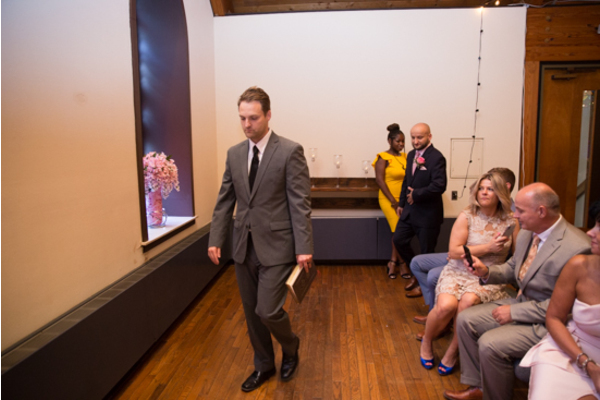 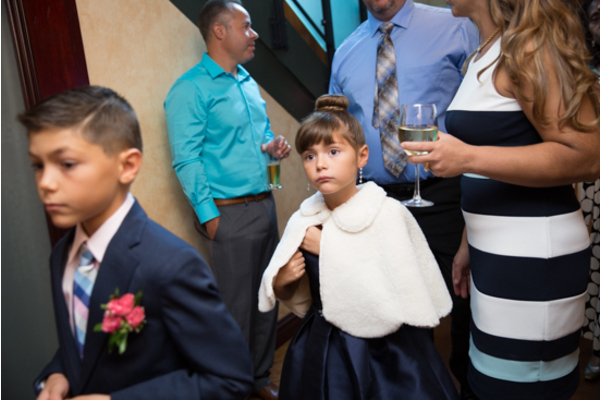 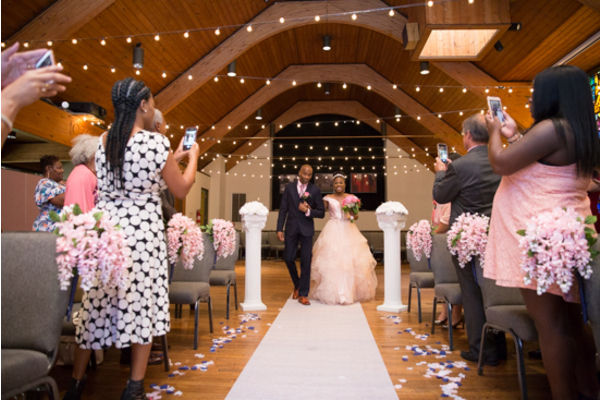 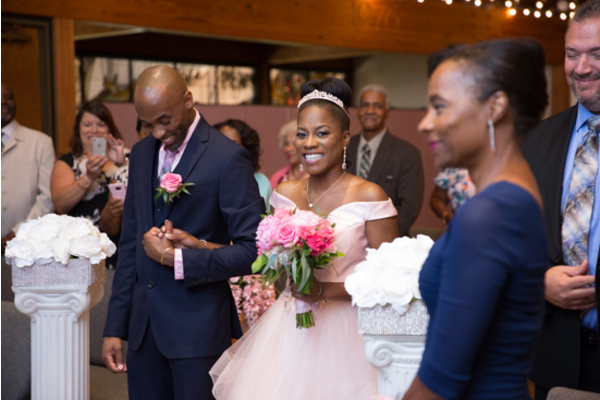 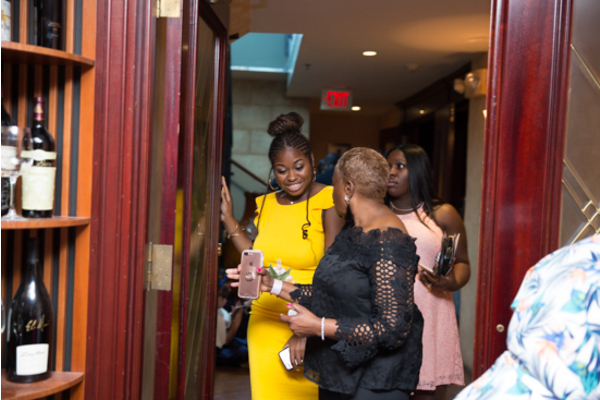 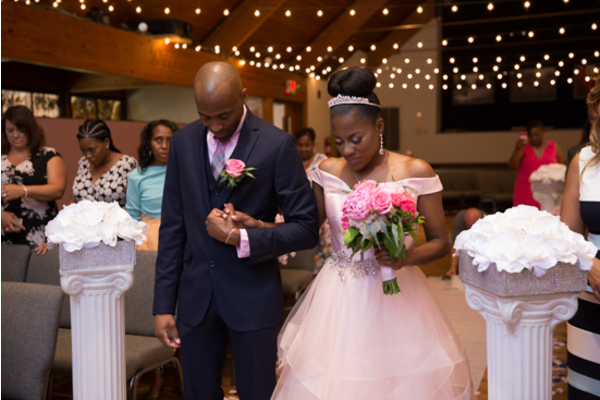 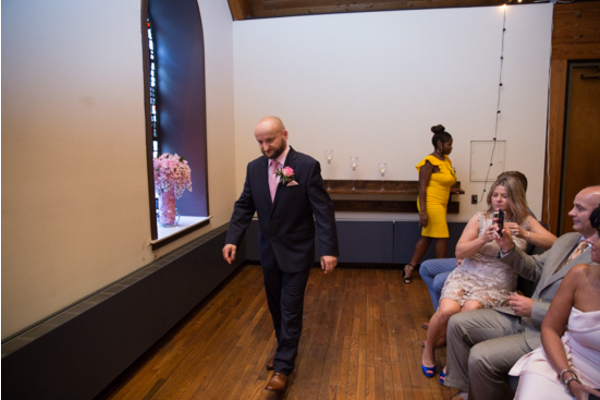 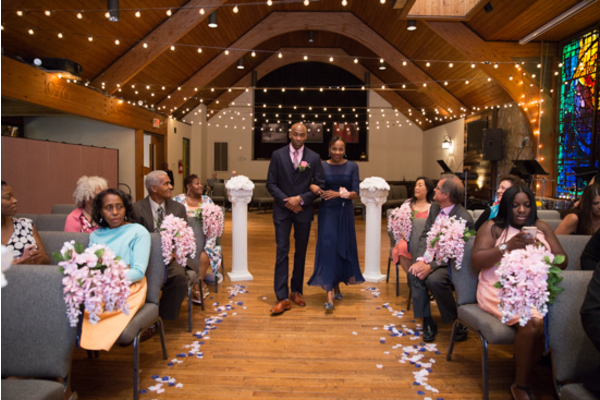 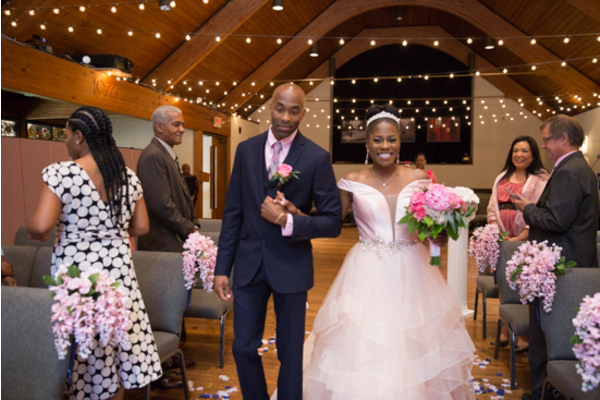 Our NJ Wedding Photographer captured the bride making her way down the aisle! 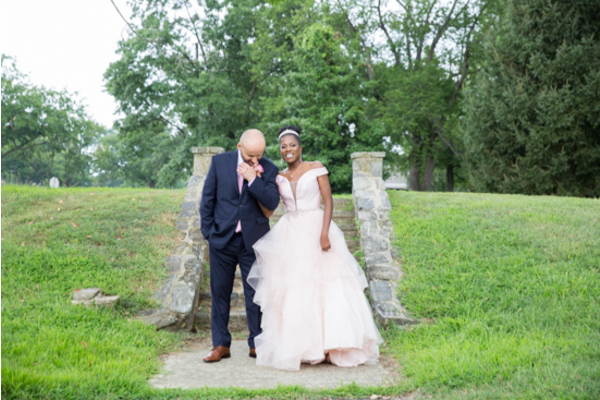 She looked like a princess and Hubert could not stop smiling. 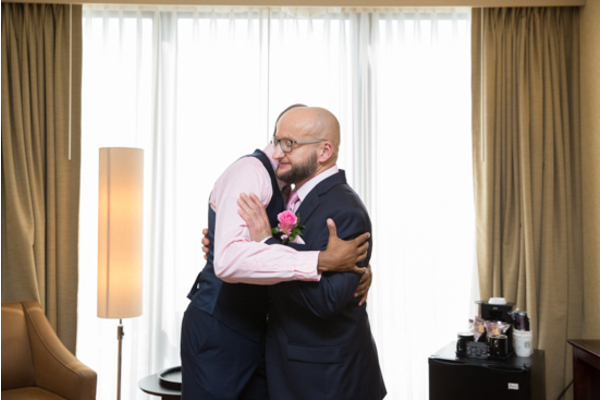 Later on at the reception, Tee and Hubert had a romantic first dance together as all of their guests watched them in awe. 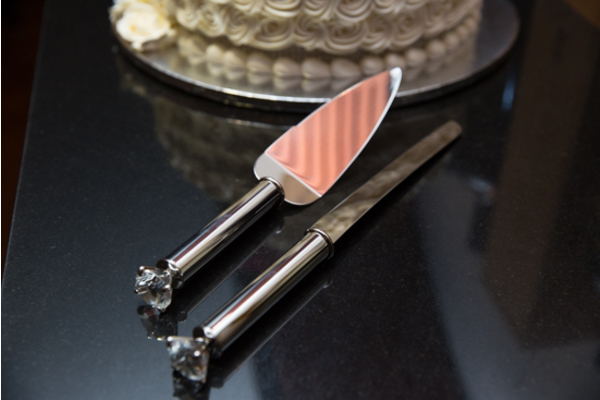 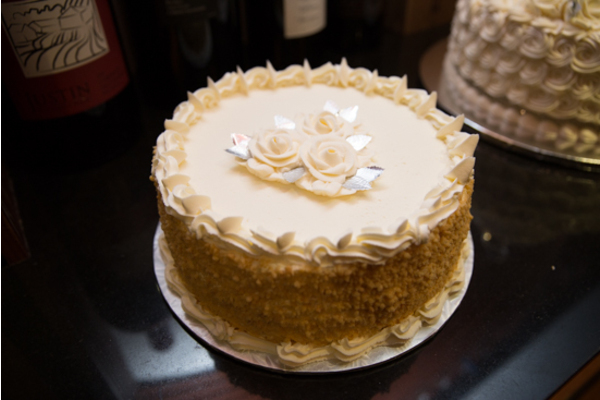 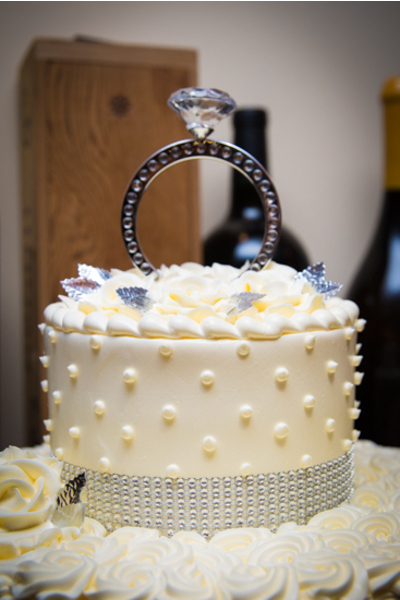 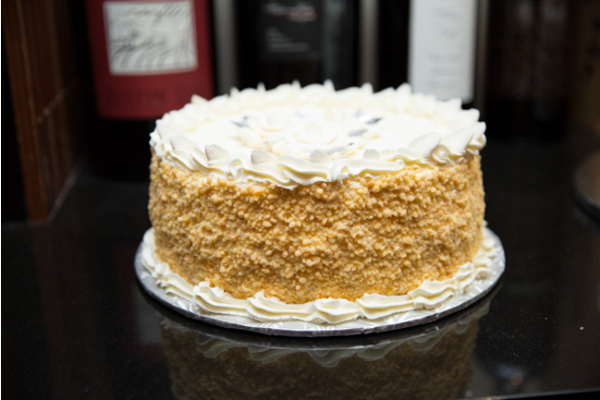 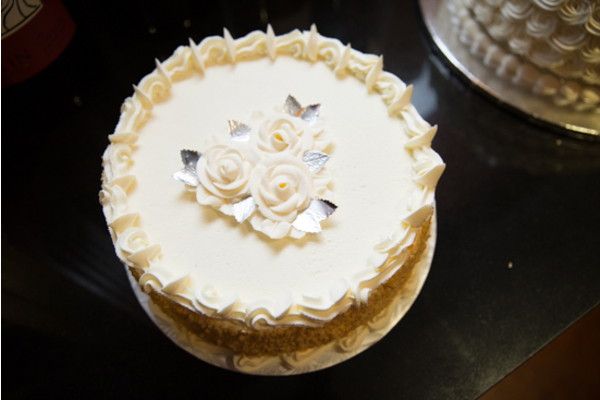 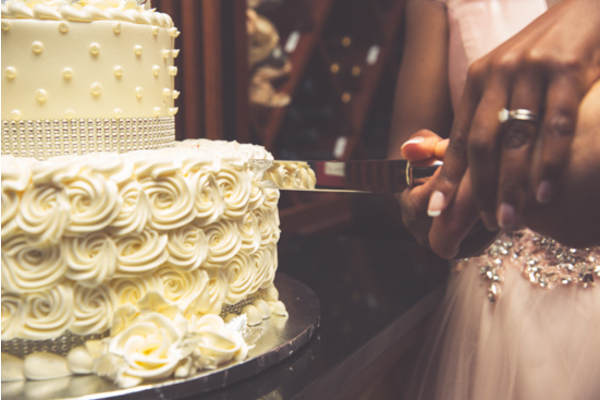 The newlyweds had a cake cutting ceremony where they playfully fed each other the first bite of cake. 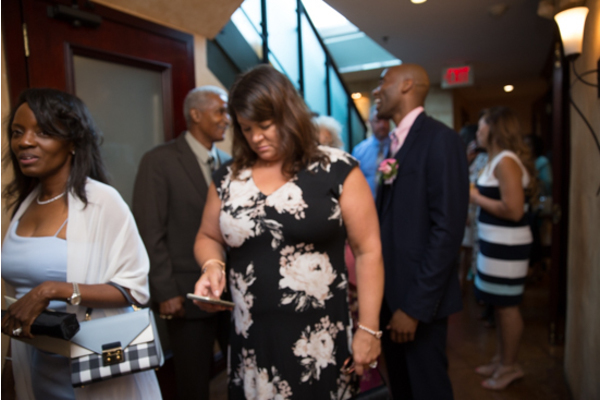 The dance floor was packed all night long! 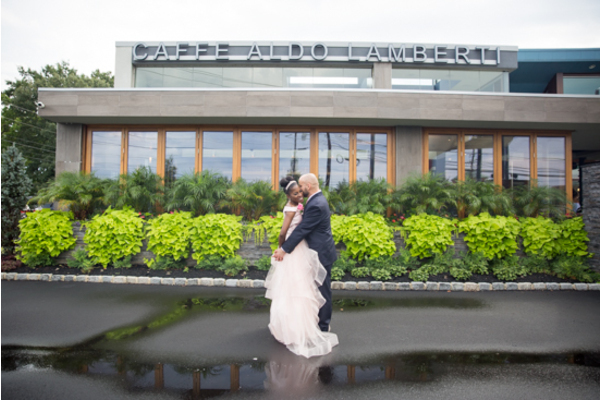 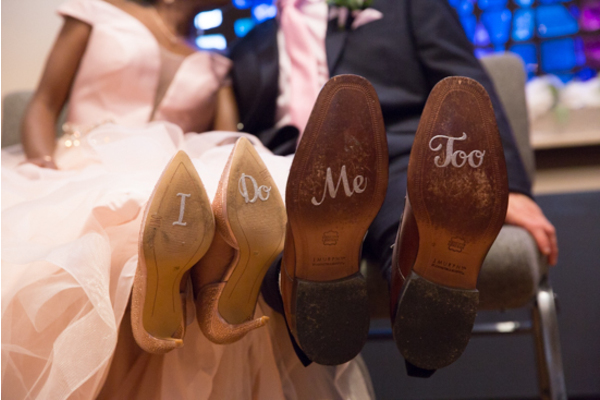 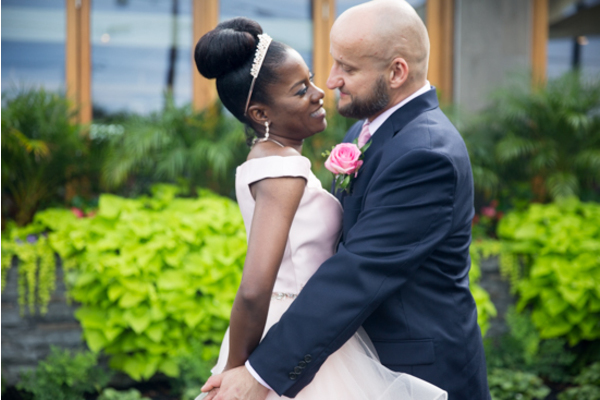 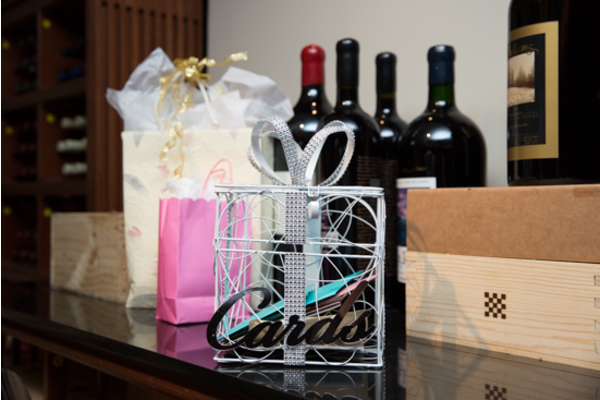 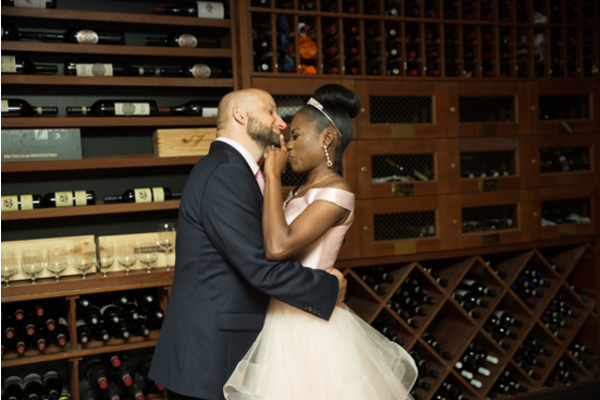 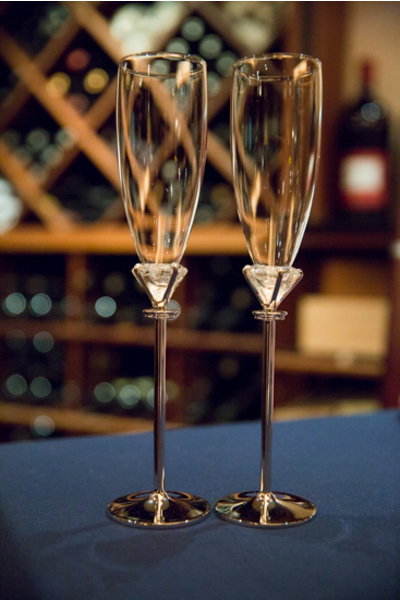 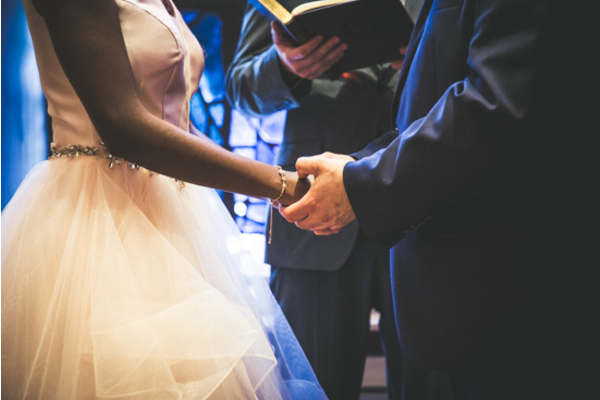 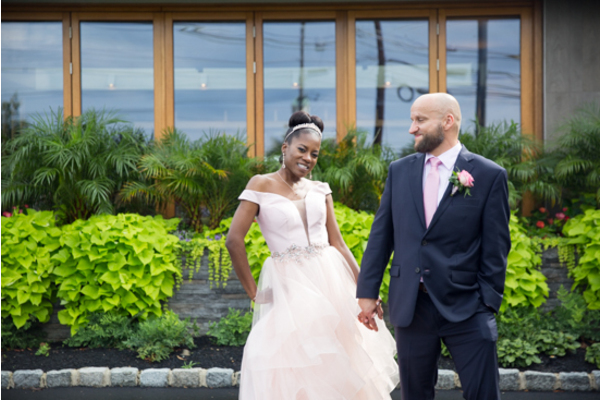 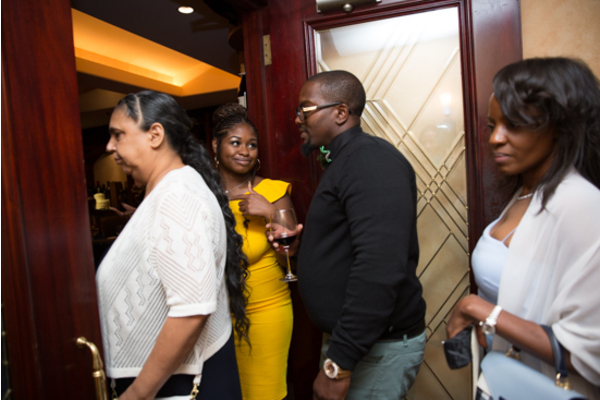 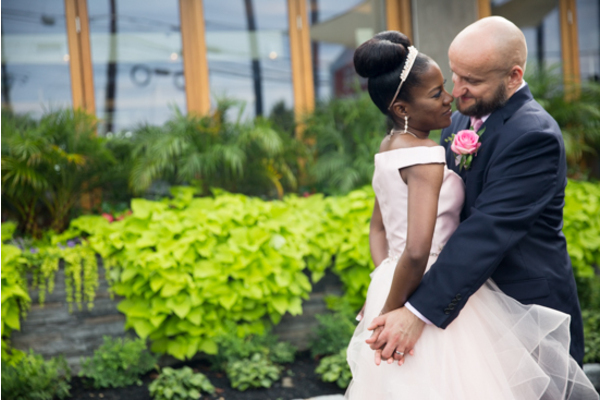 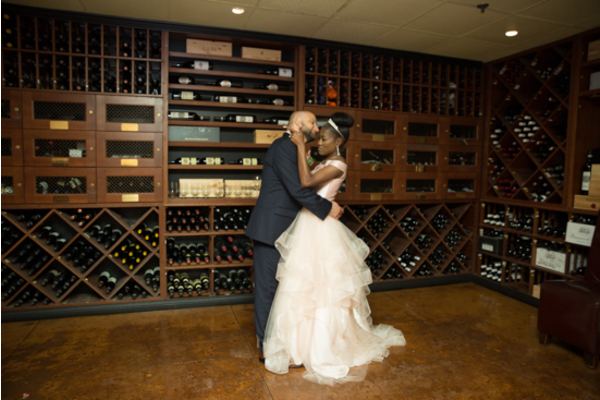 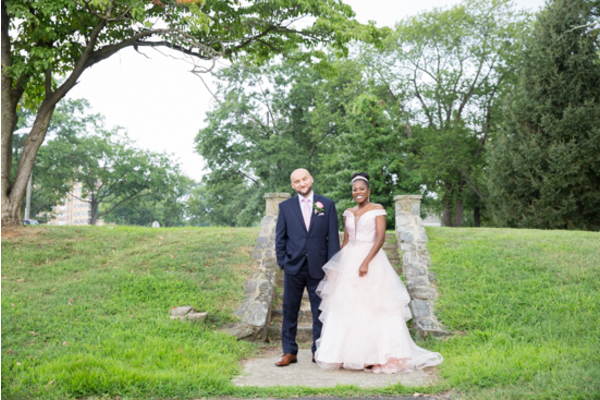 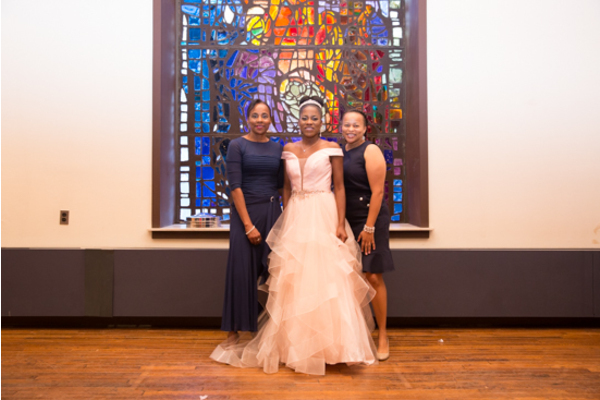 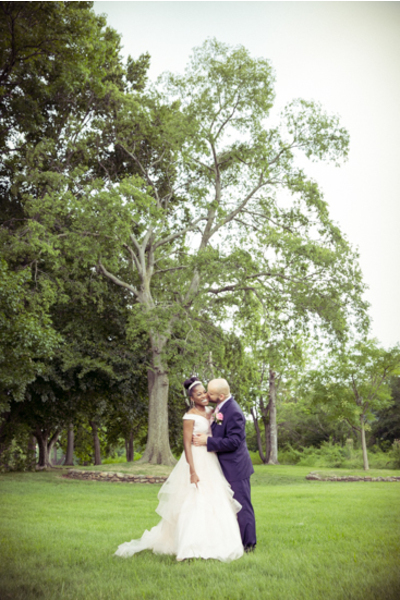 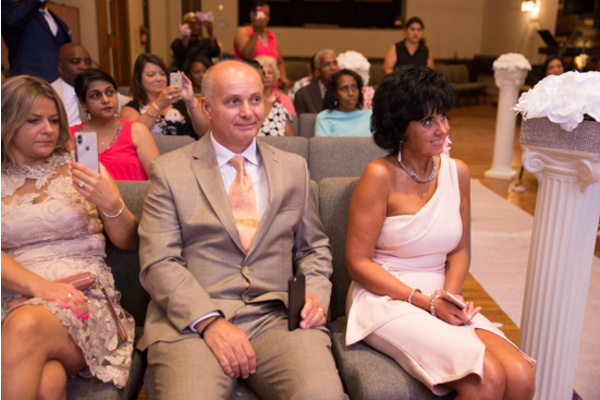 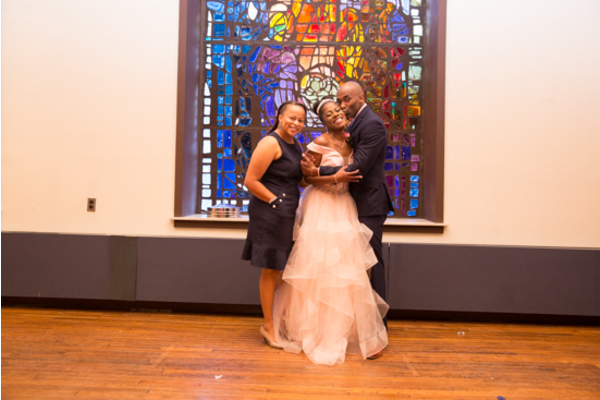 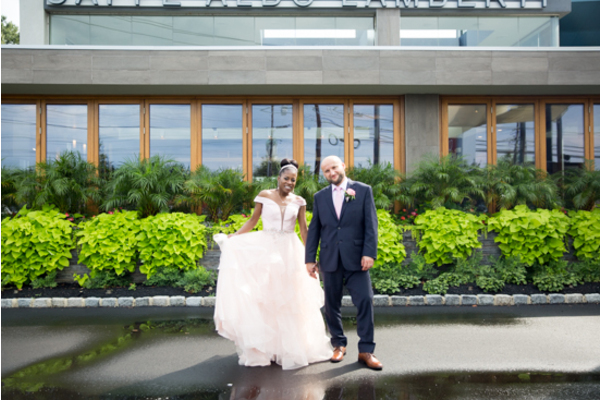 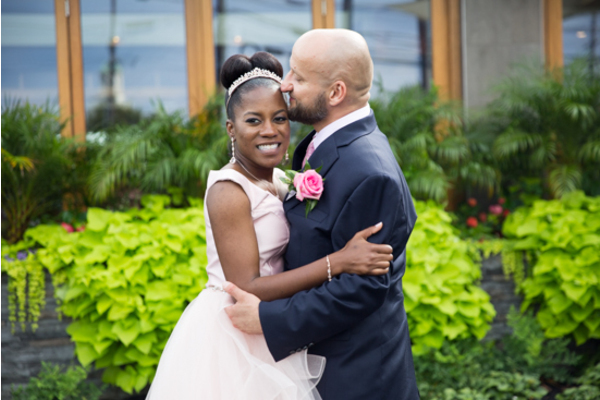 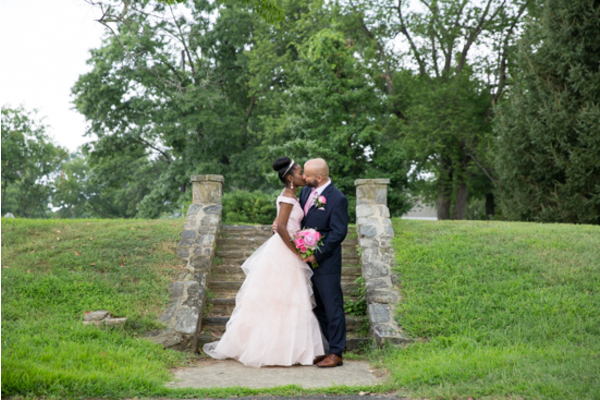 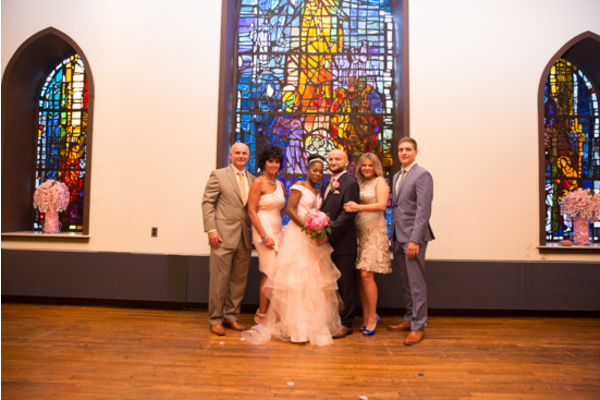 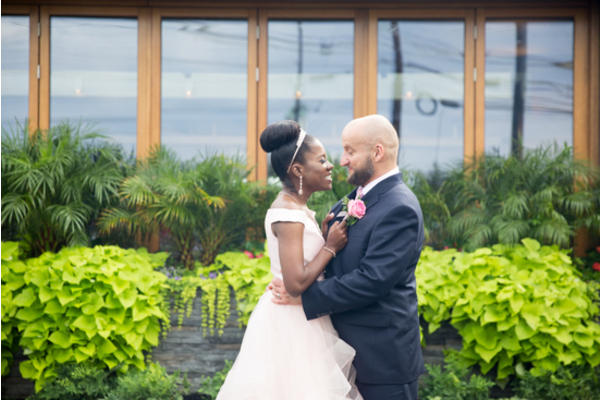 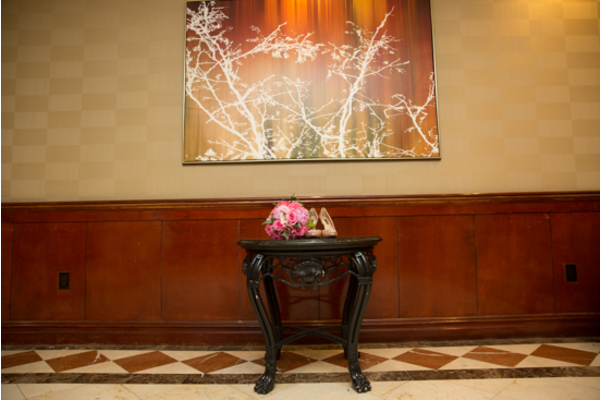 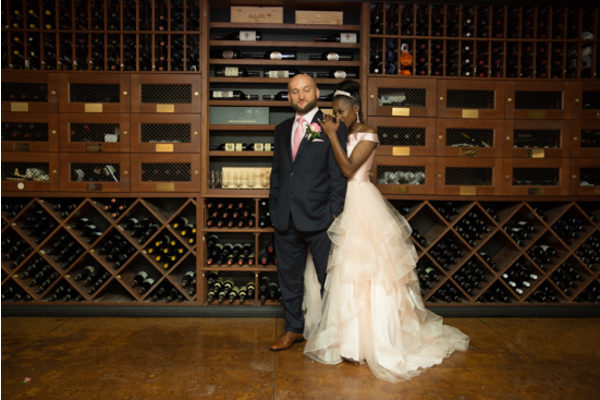 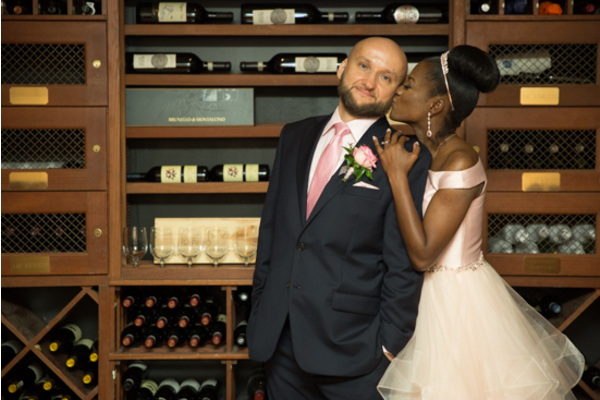 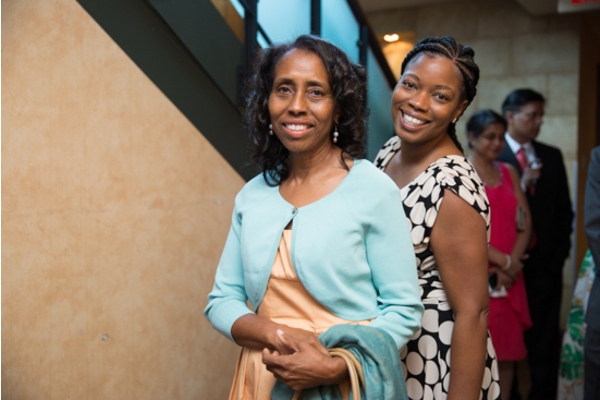 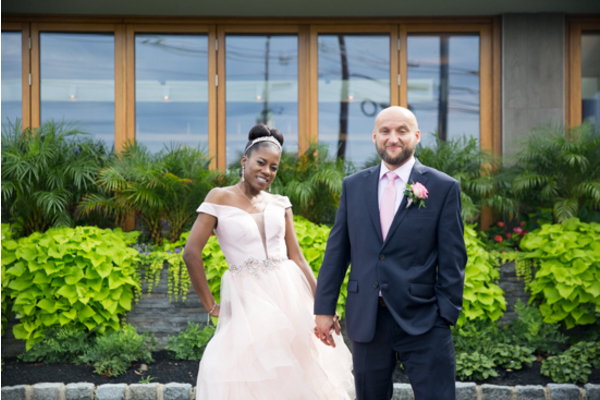 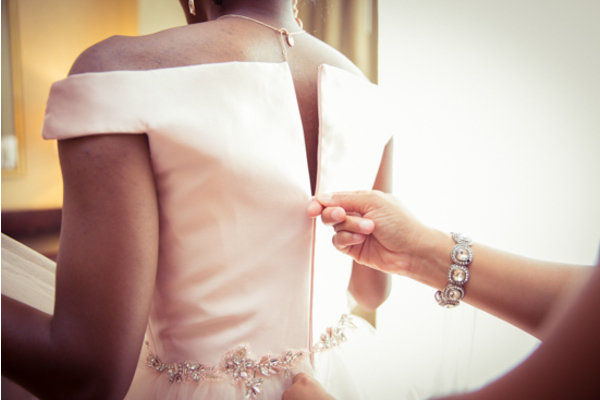 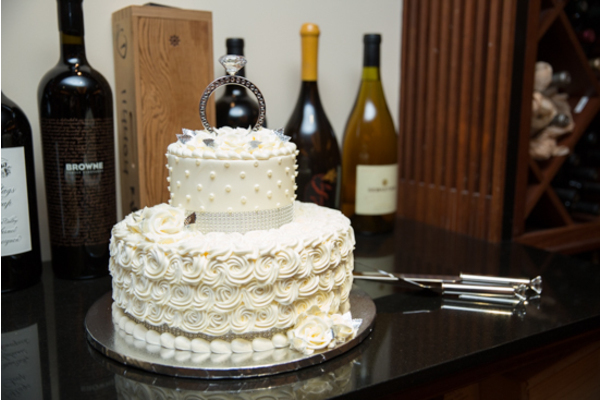 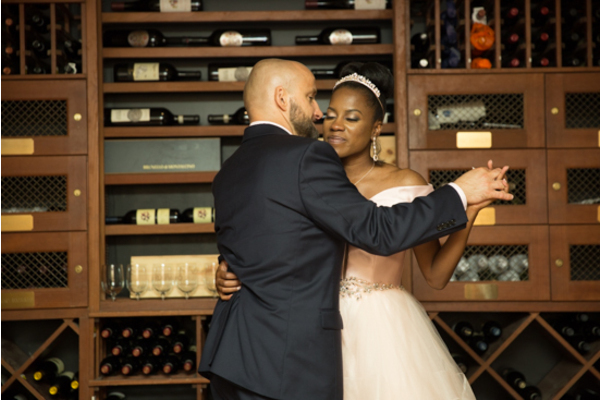 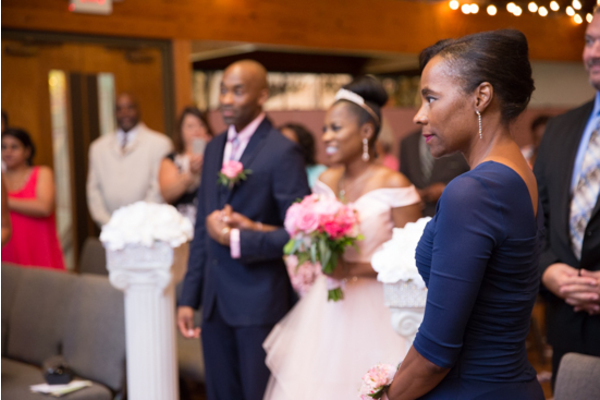 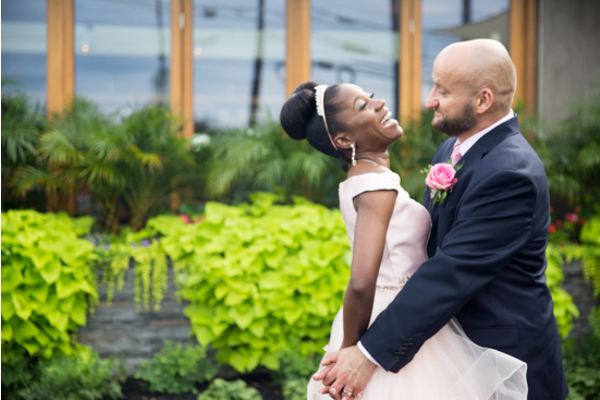 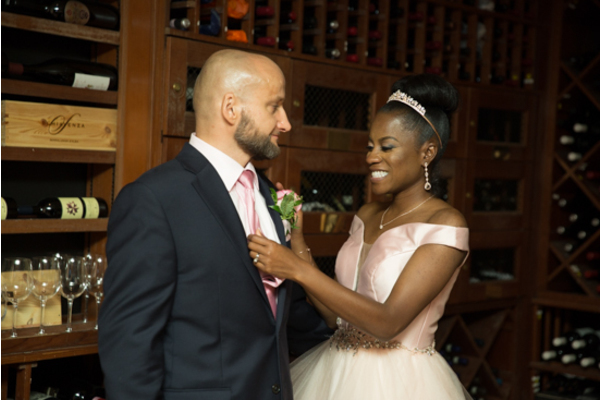 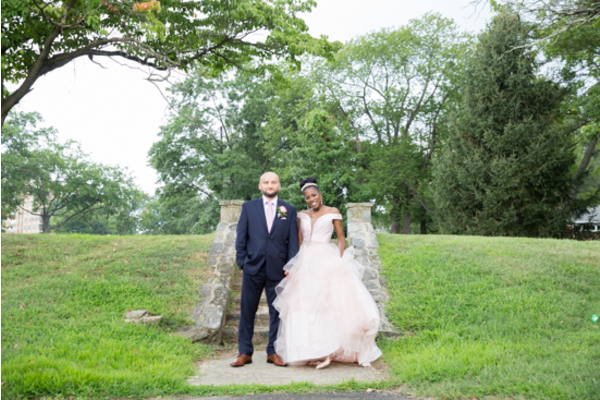 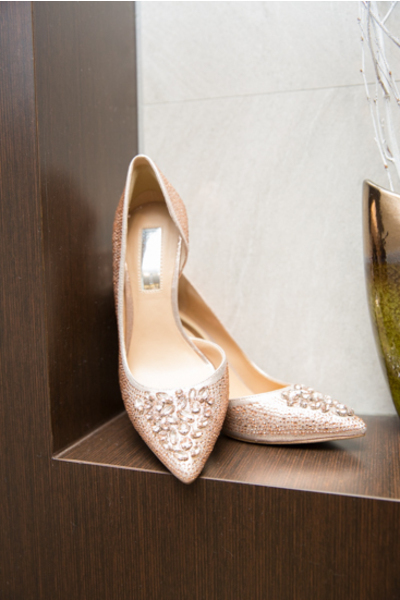 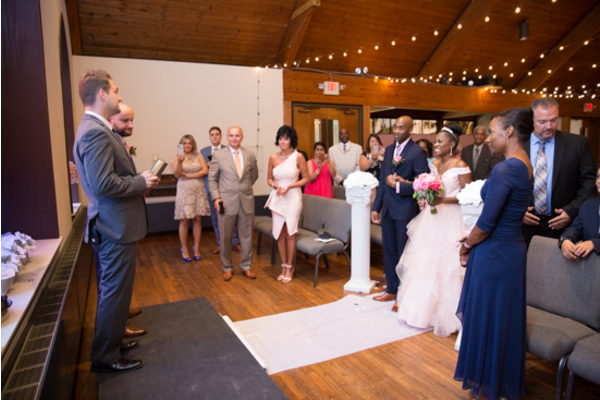 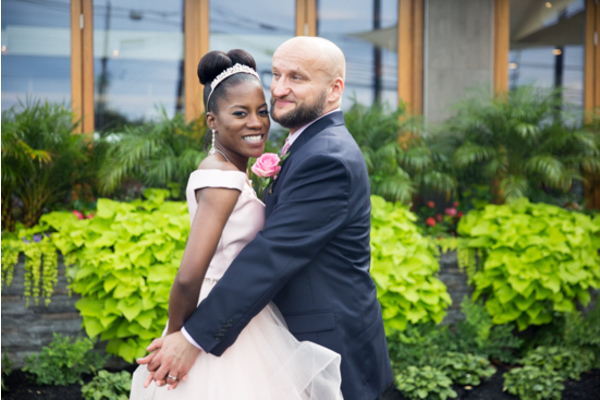 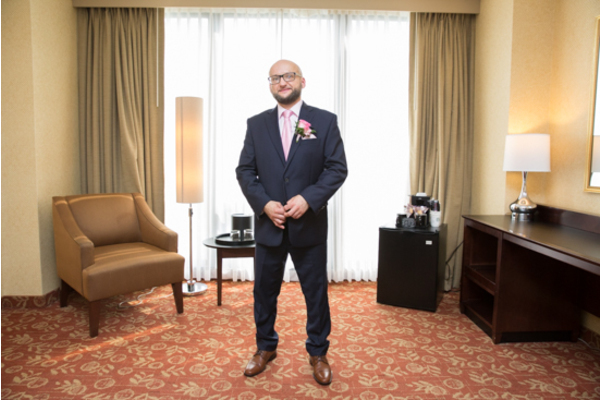 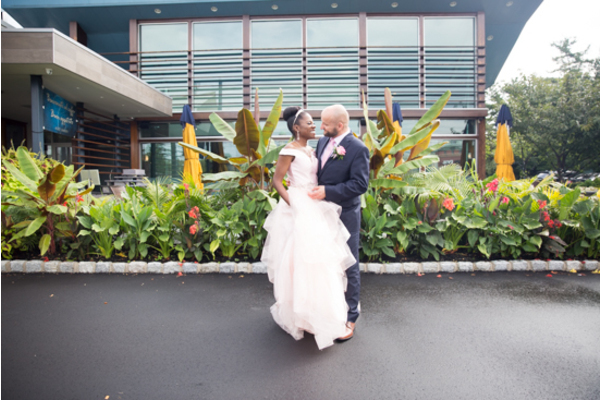 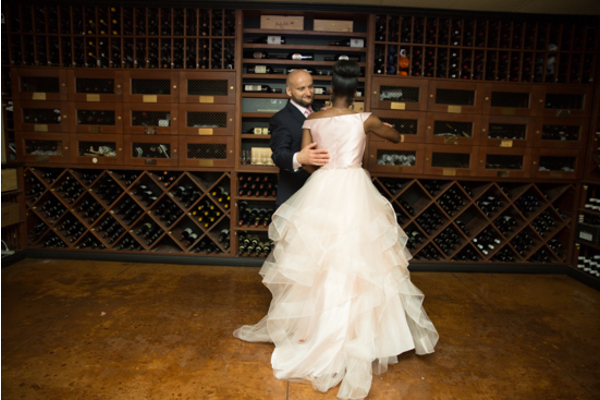 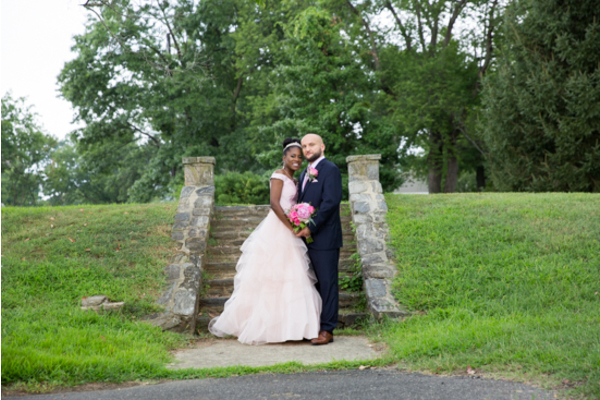 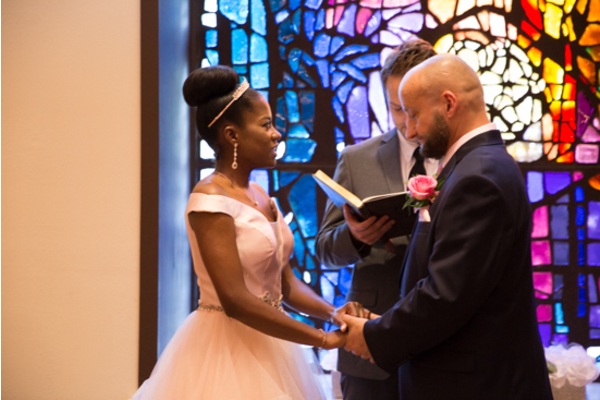 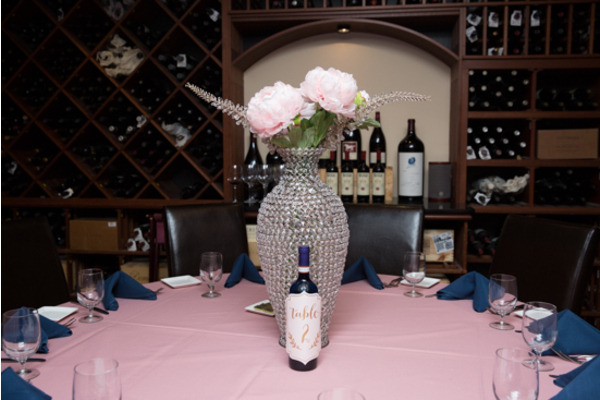 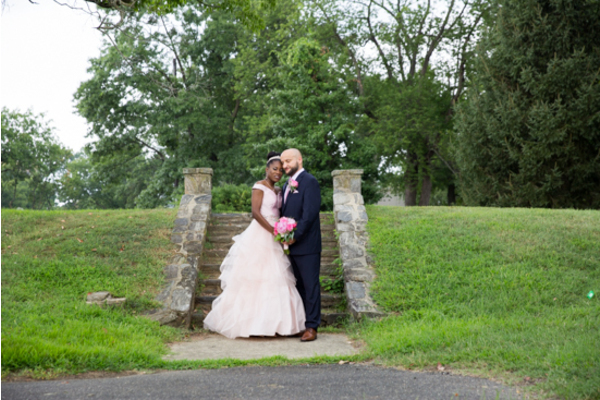 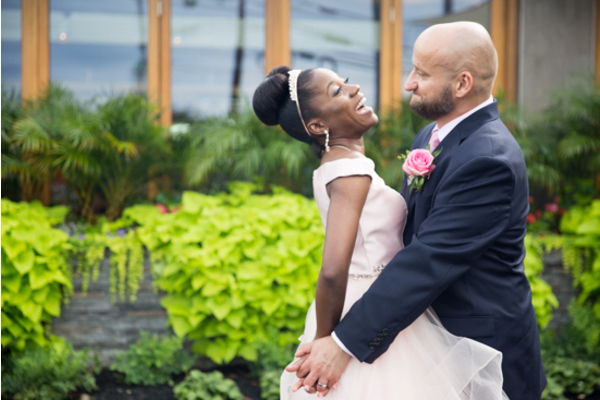 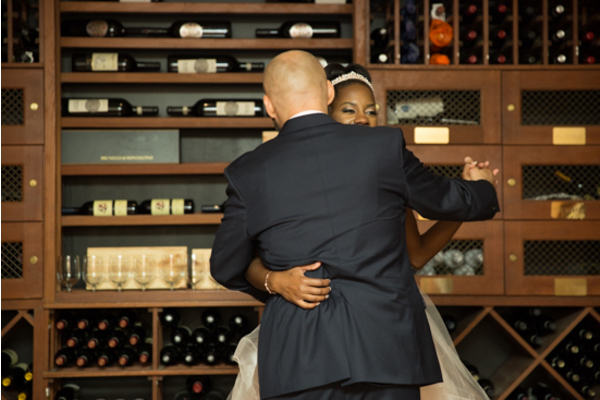 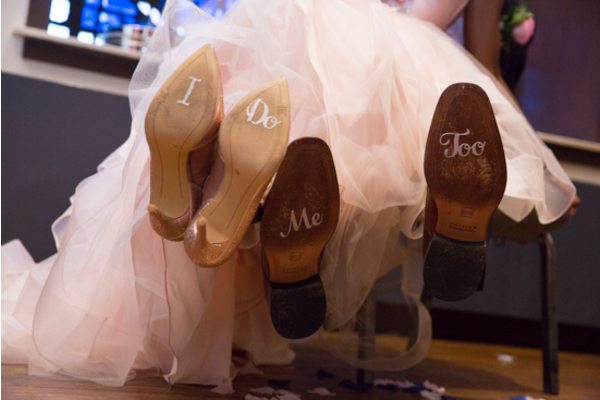 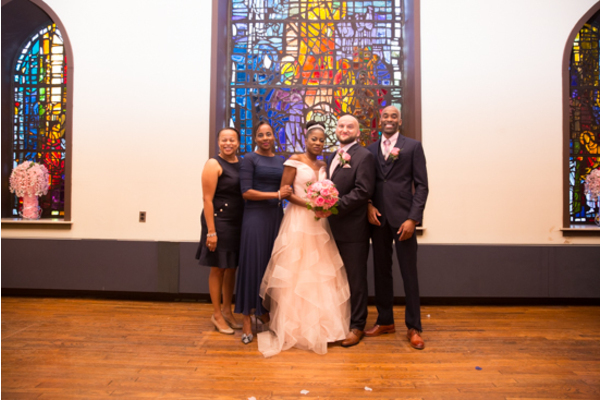 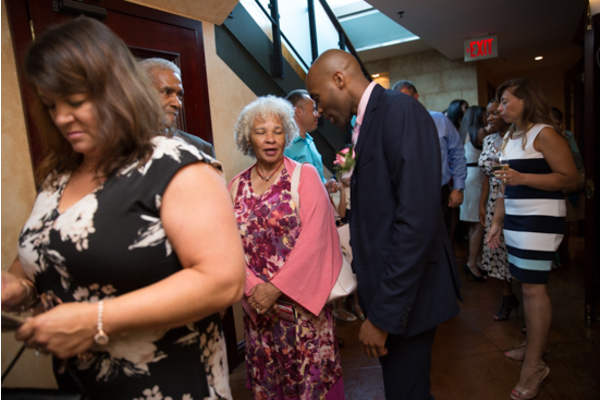 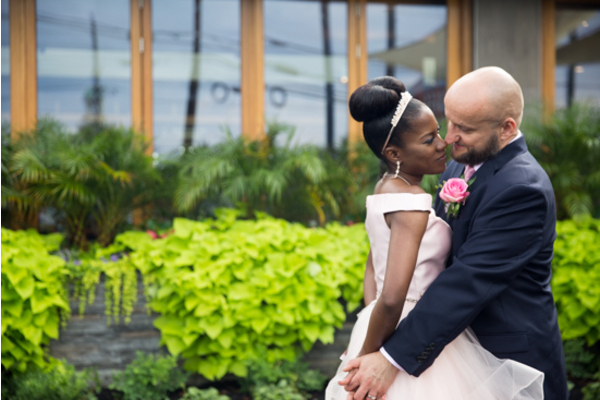 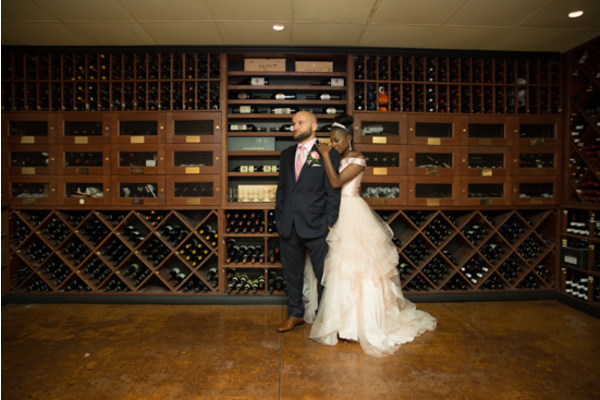 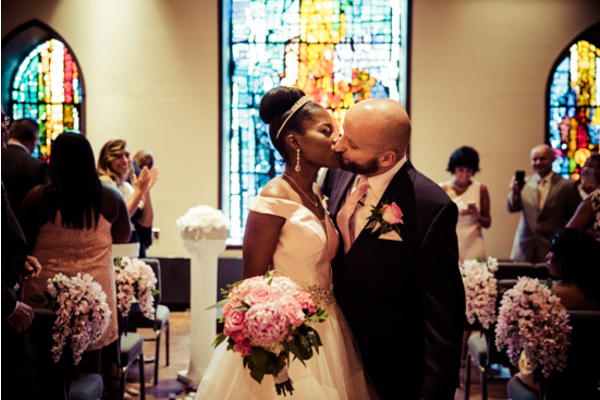 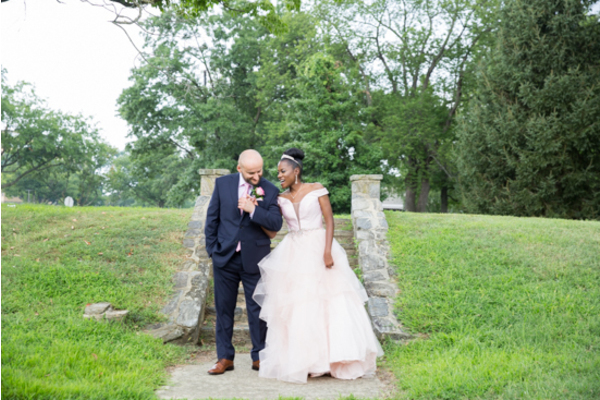 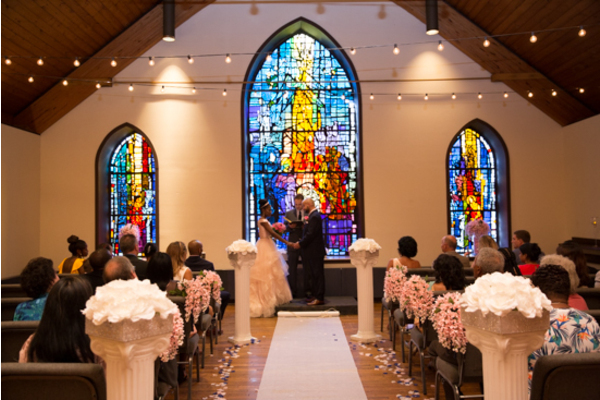 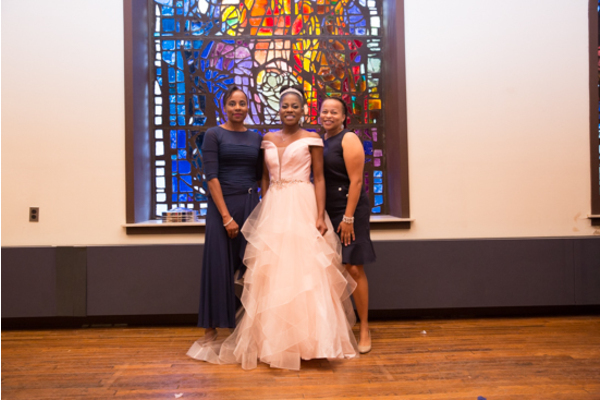 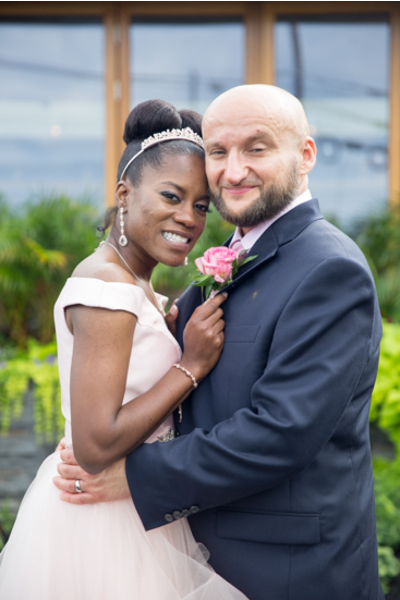 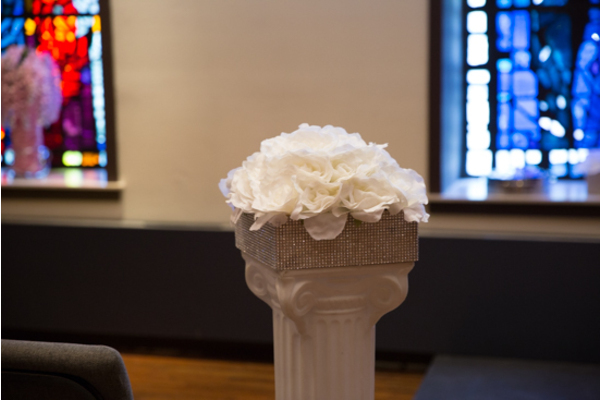 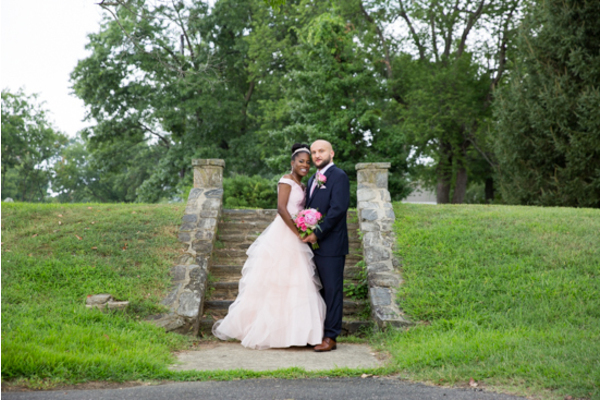 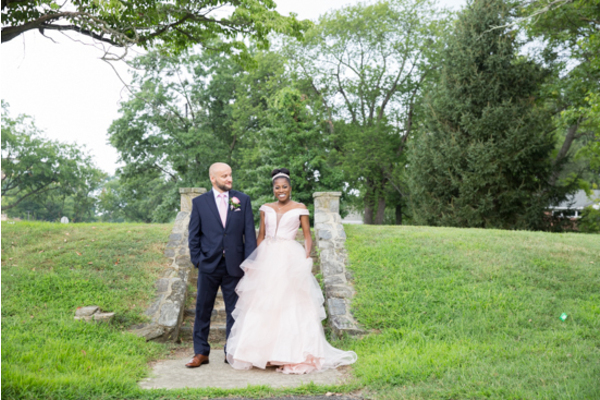 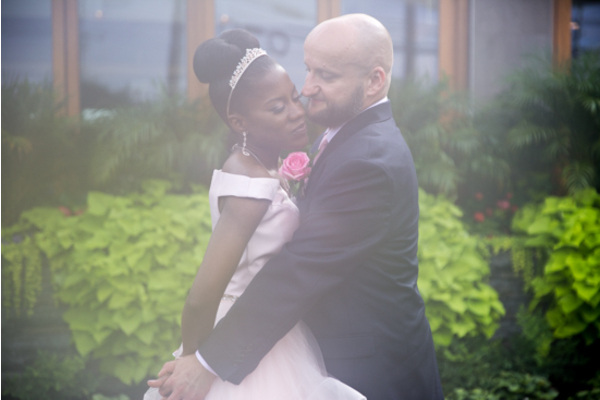 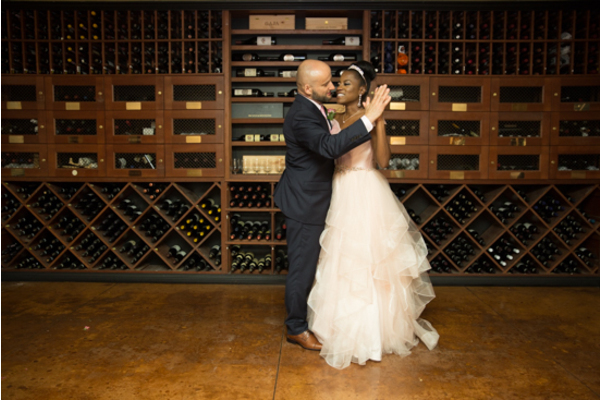 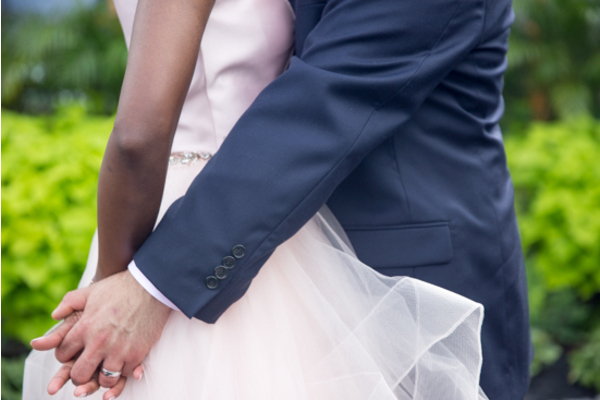 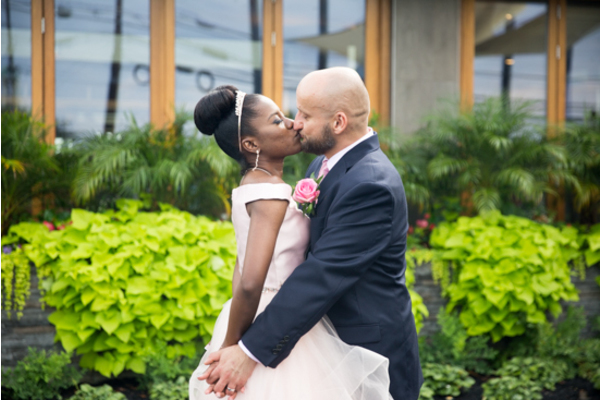 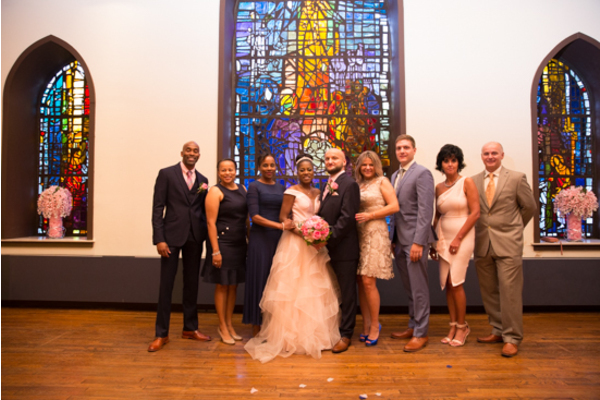 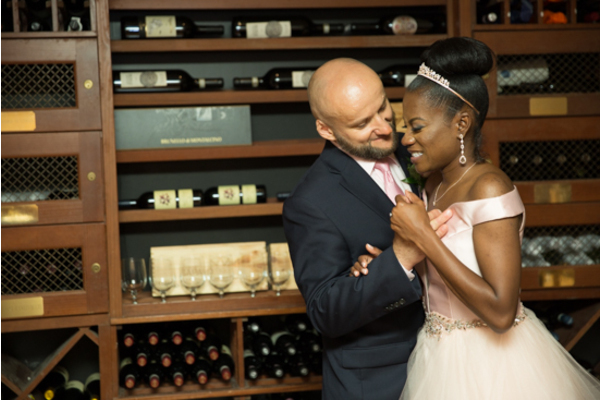 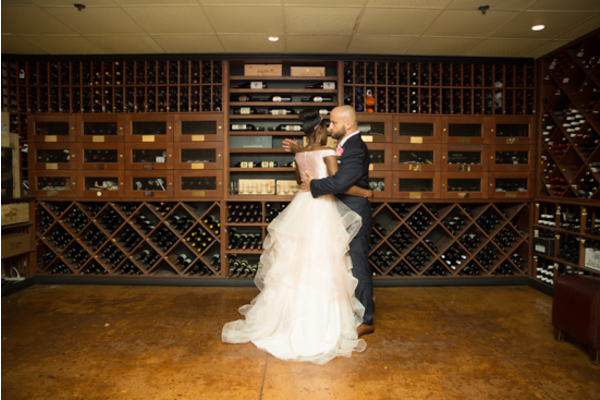 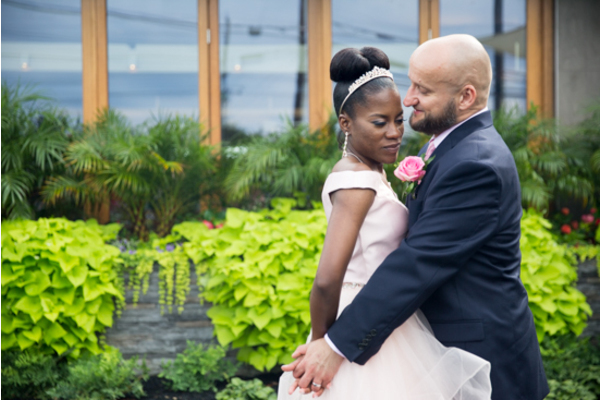 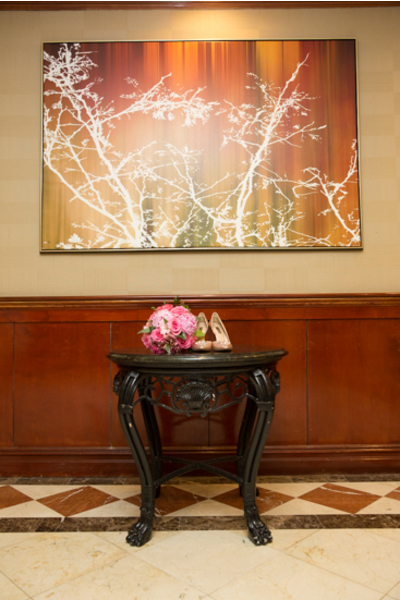 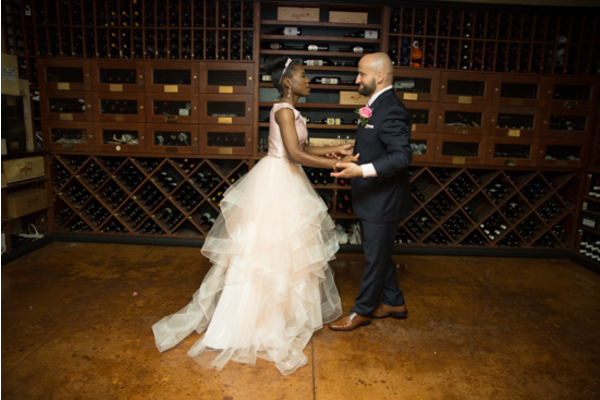 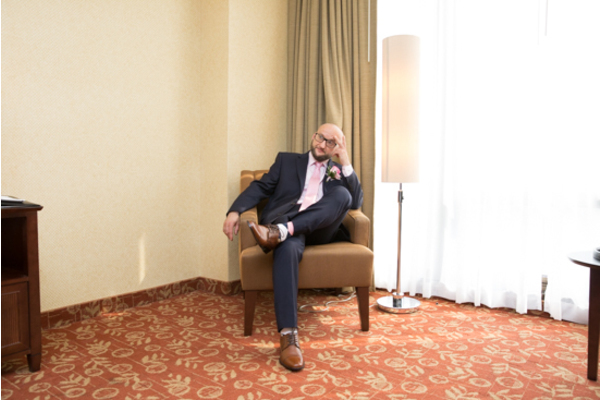 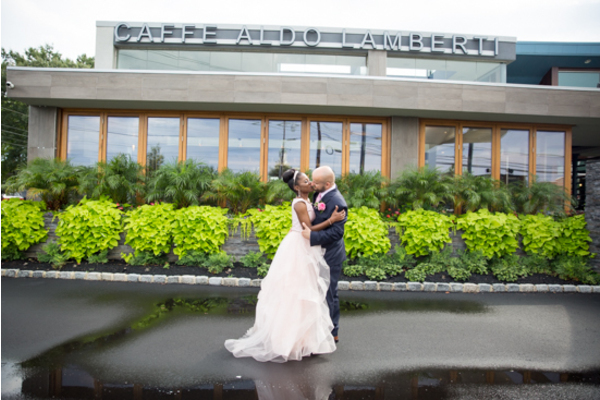 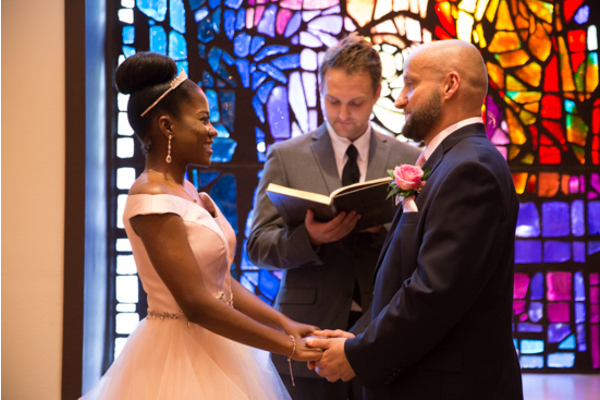 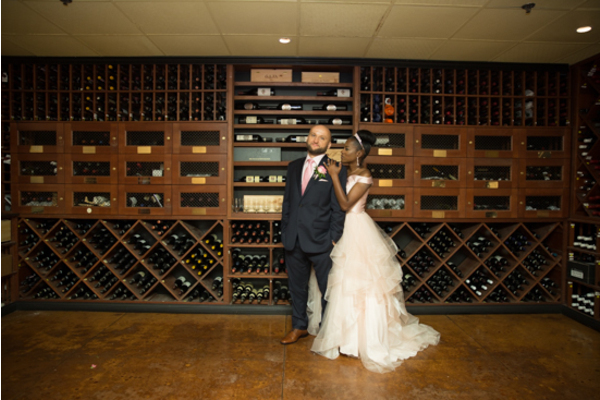 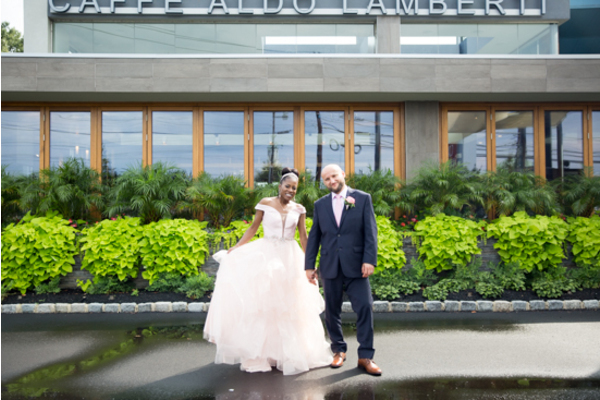 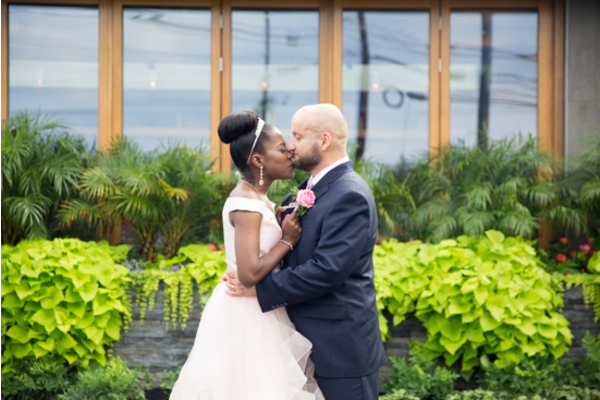 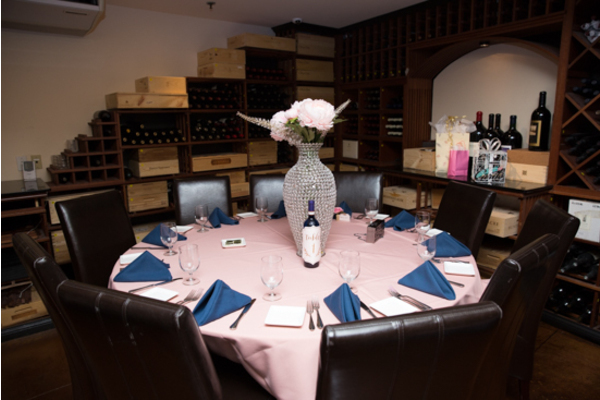 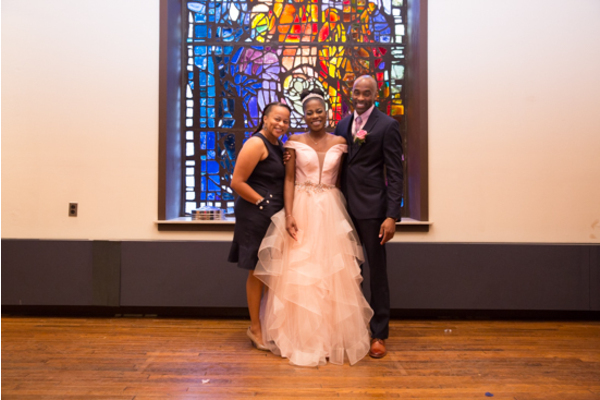 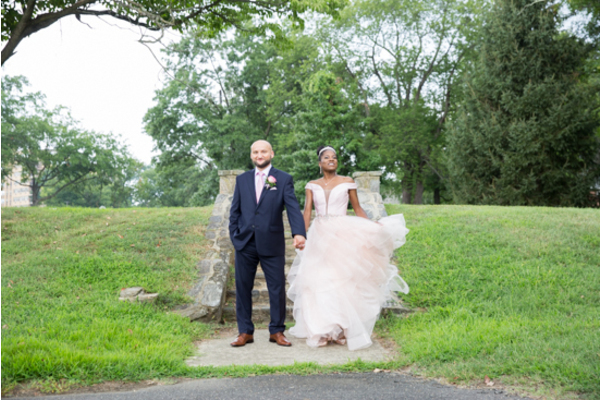 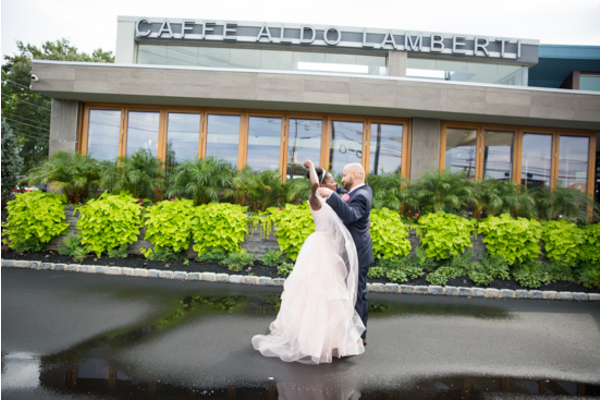 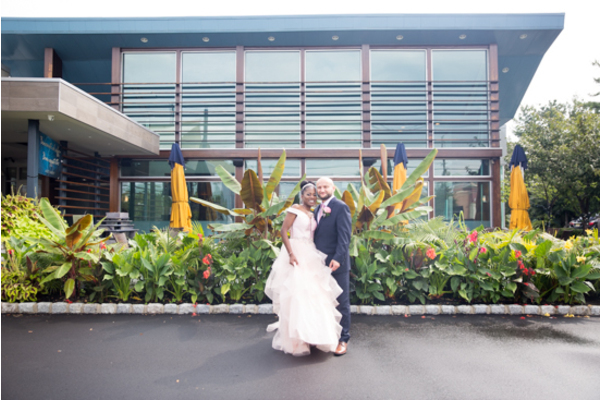 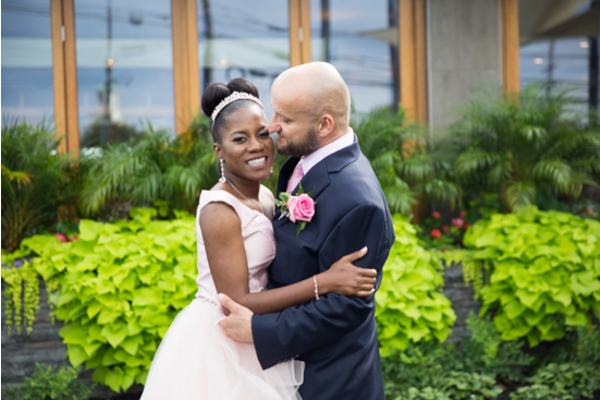 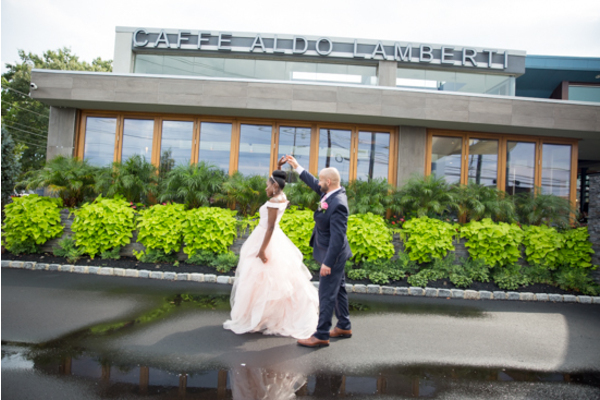 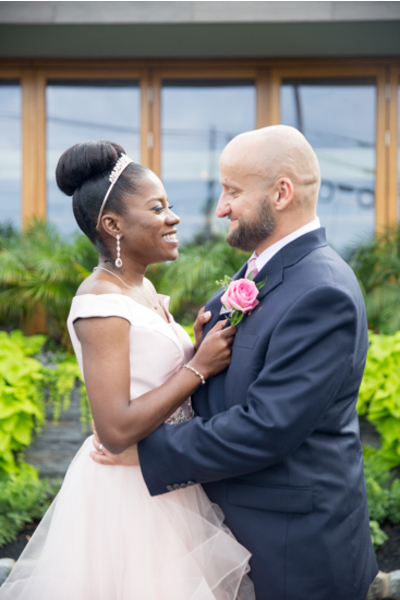 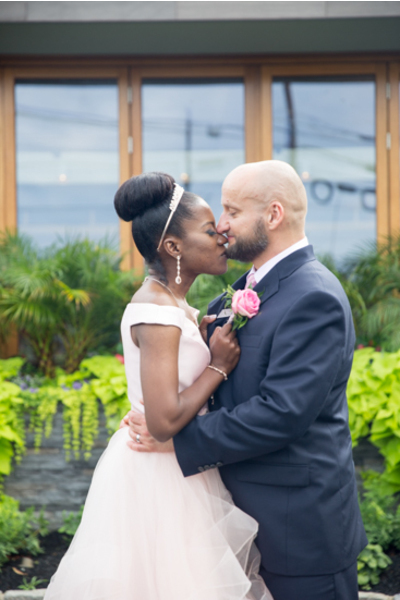 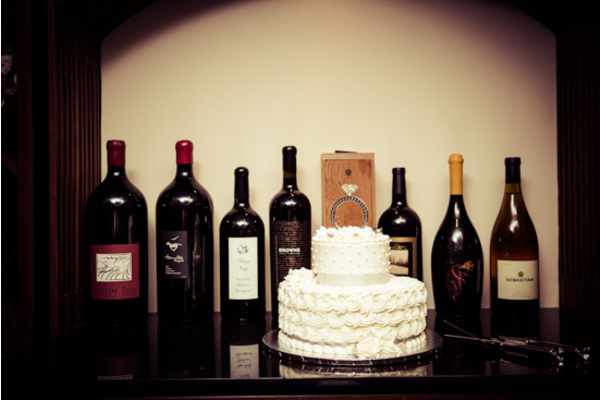 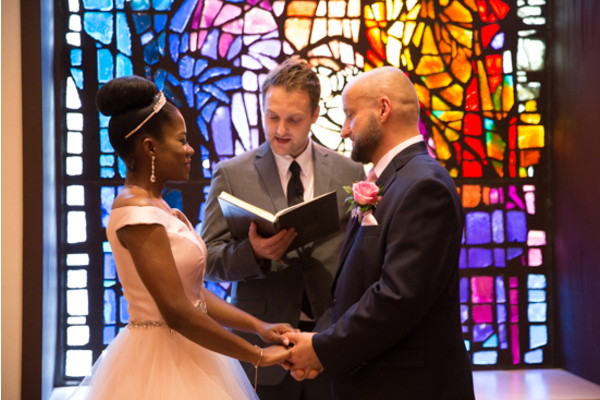 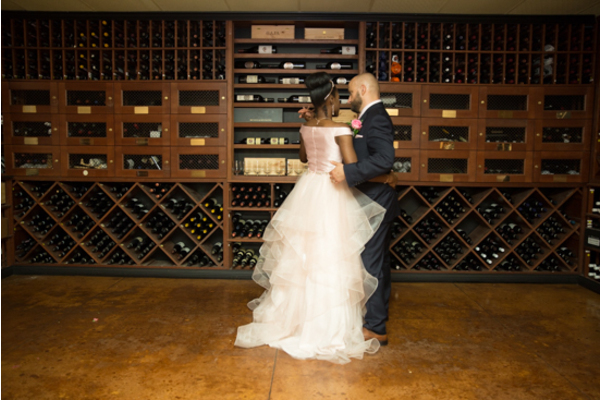 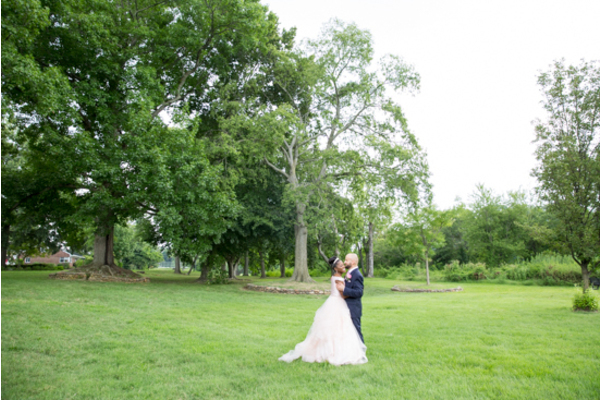 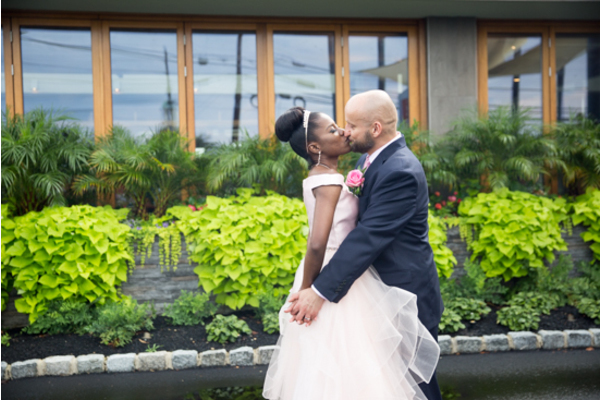 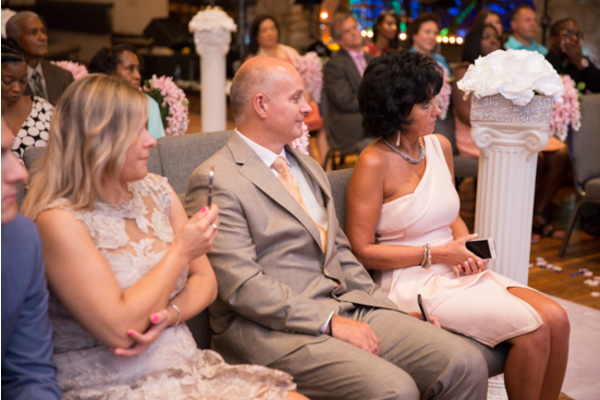 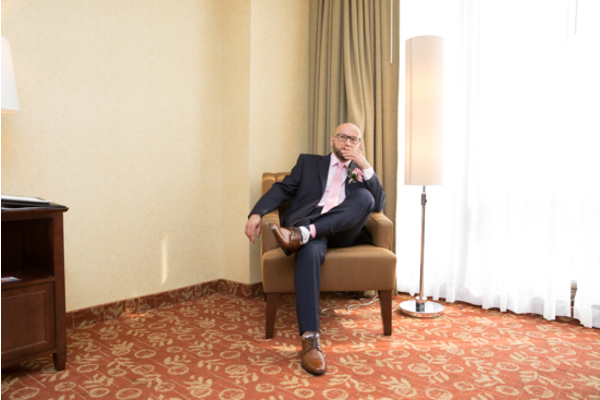 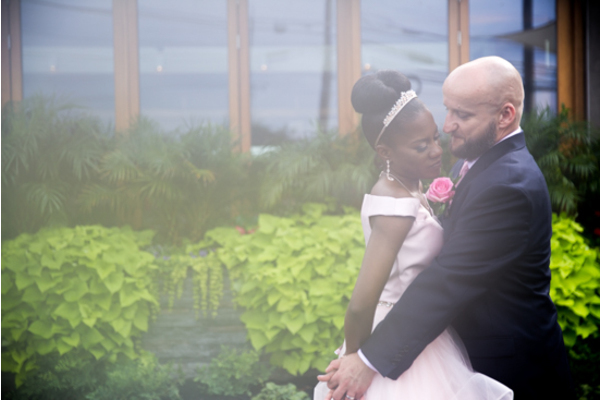 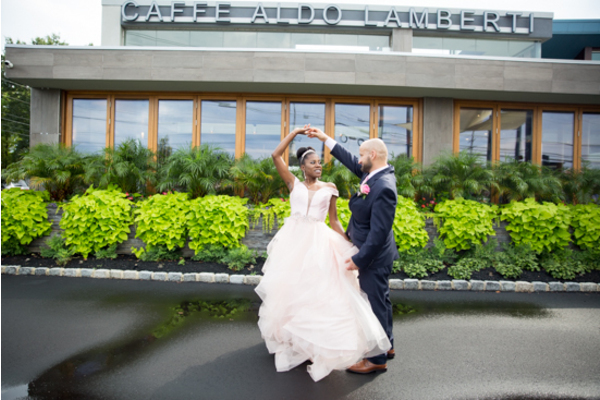 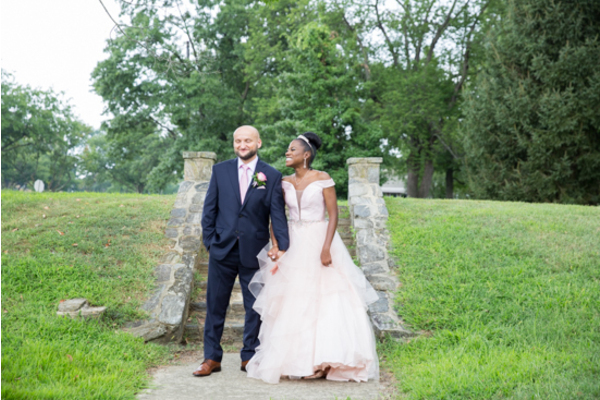 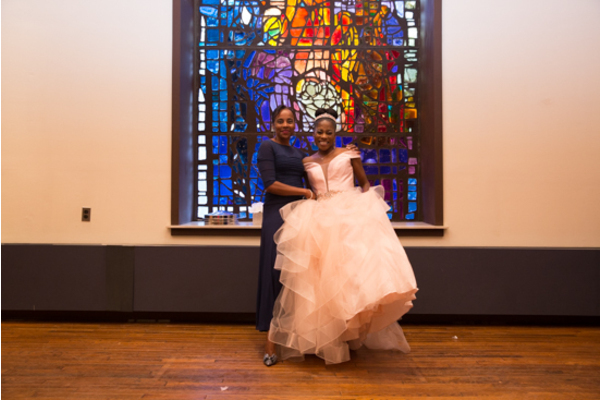 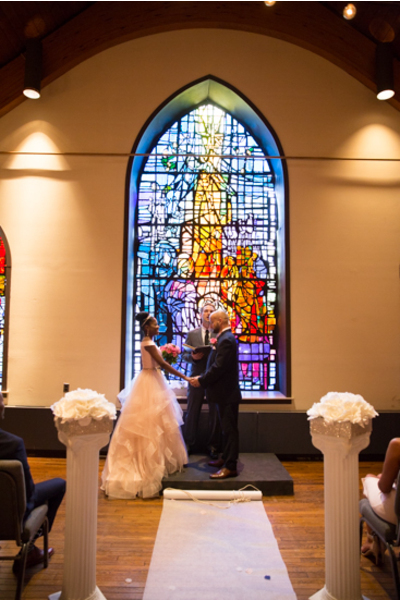 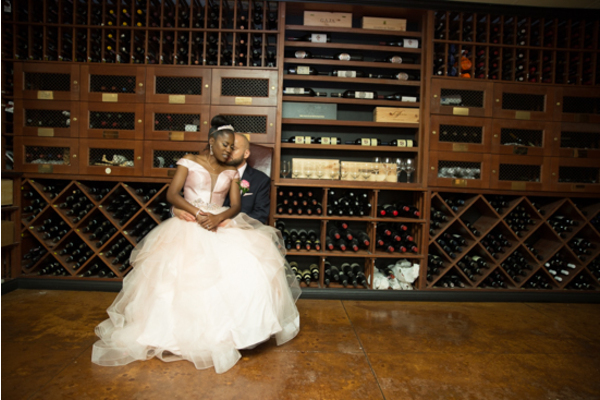 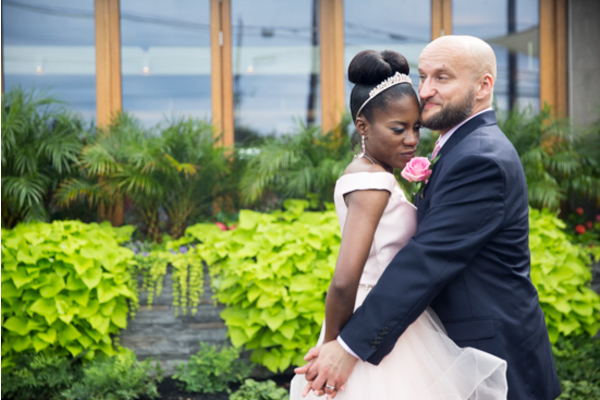 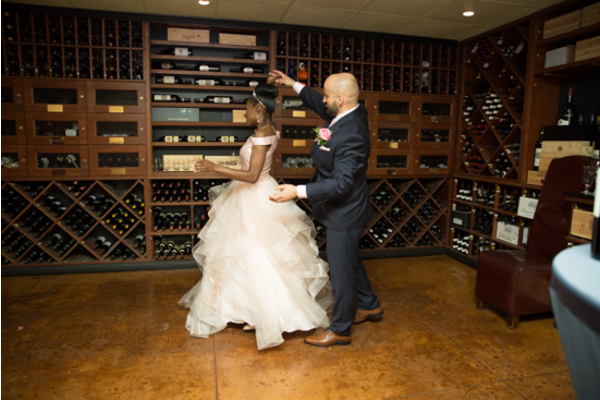 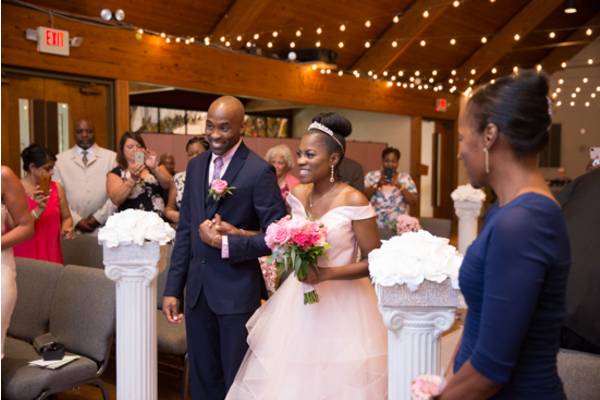 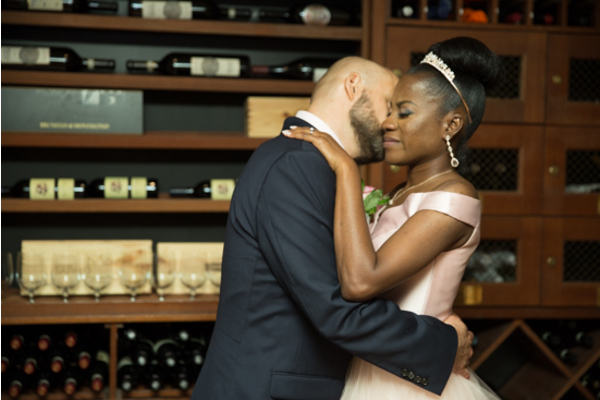 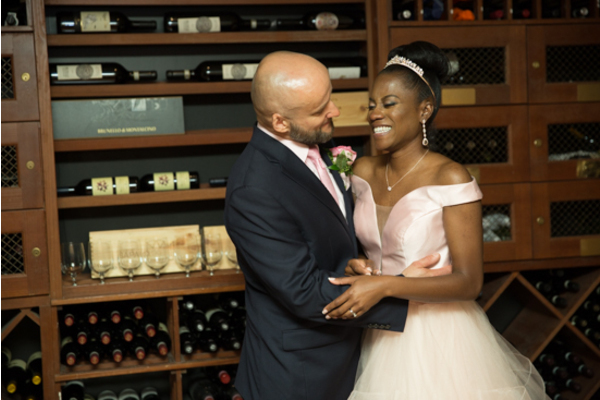 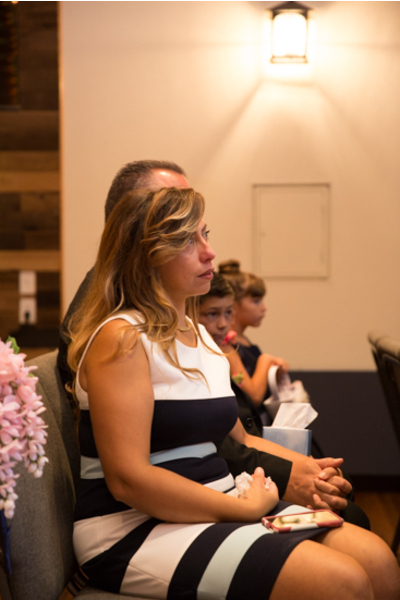 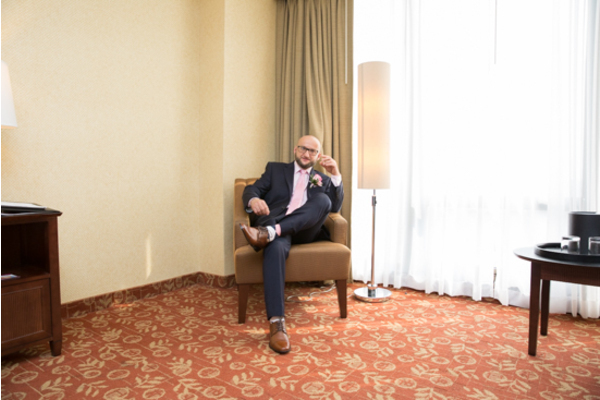 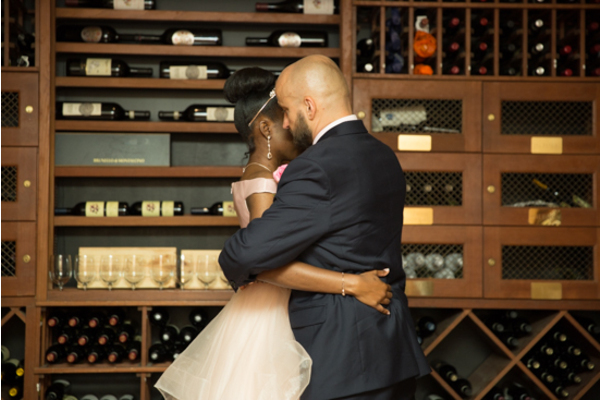 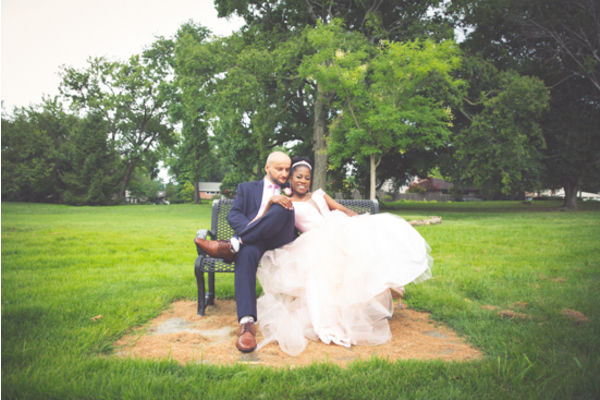 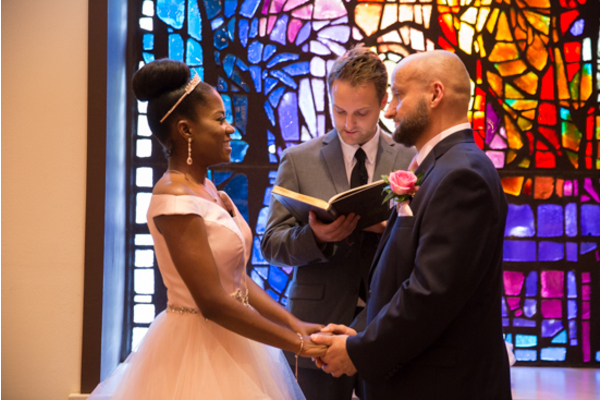 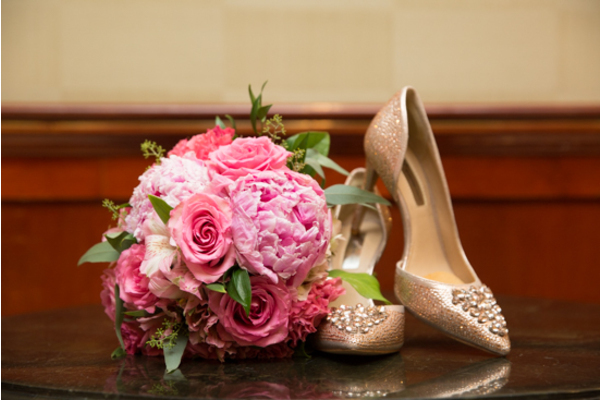 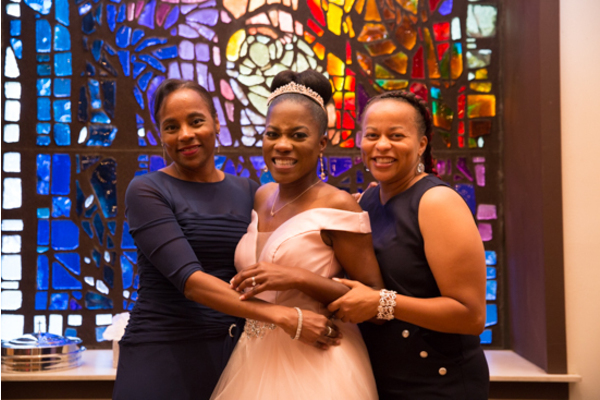 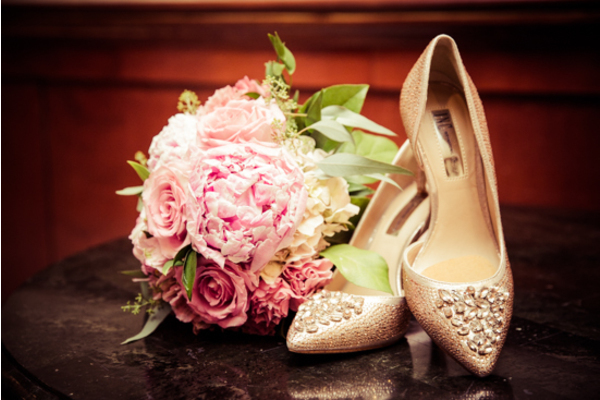 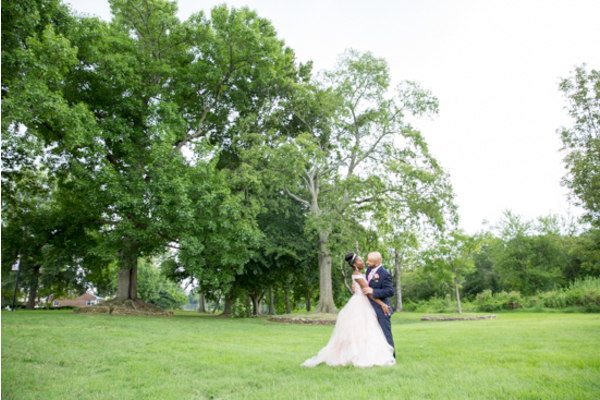 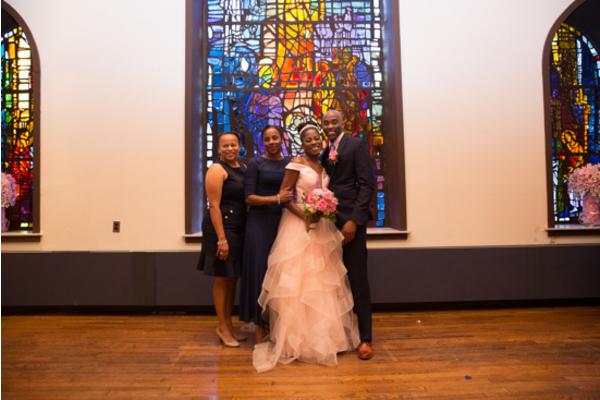 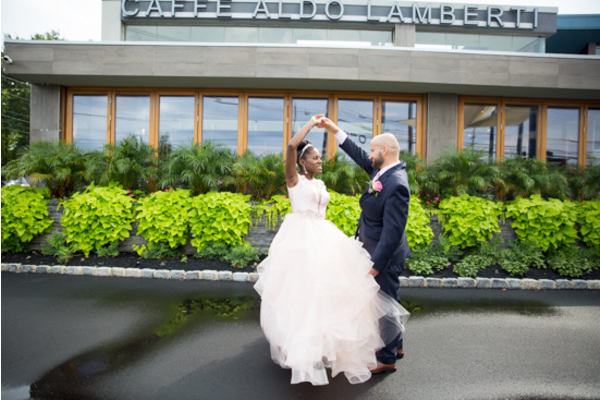 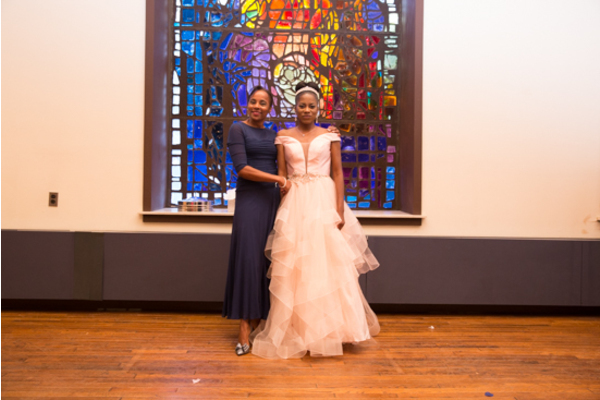 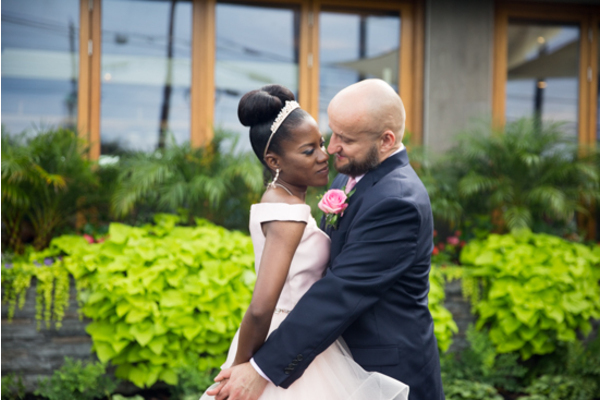 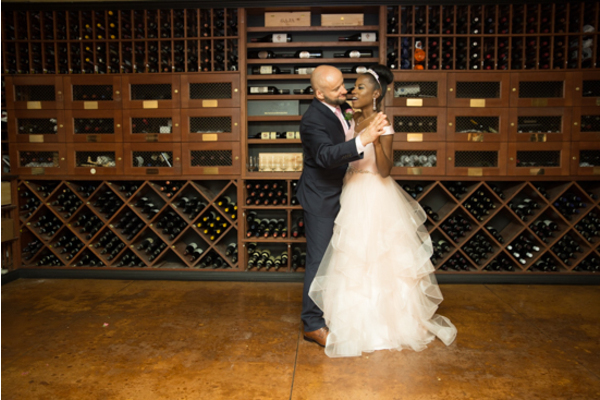 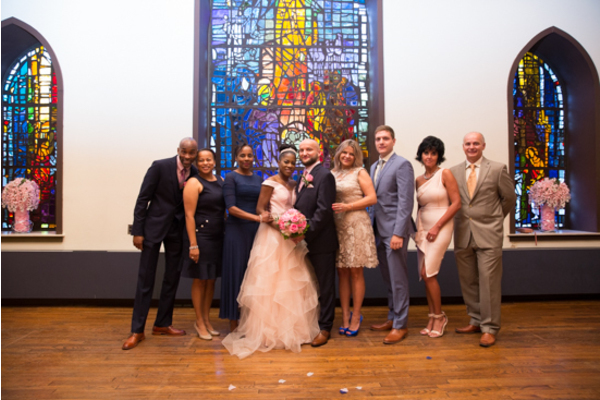 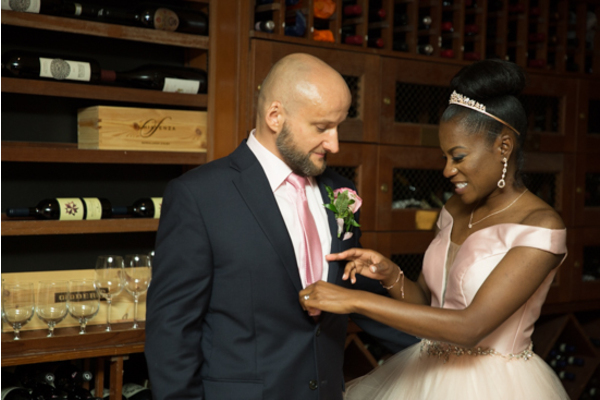 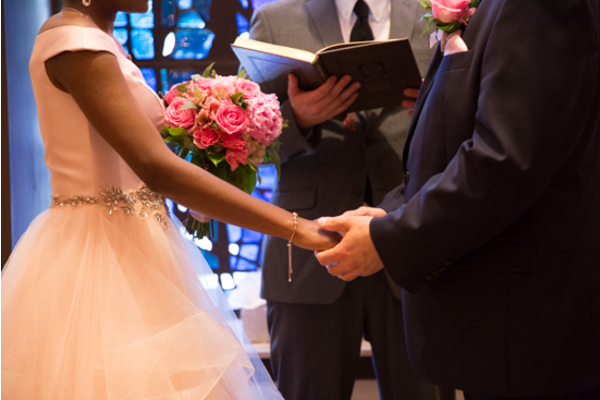 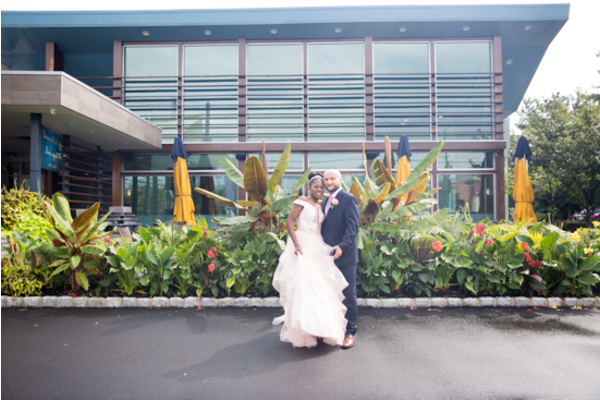 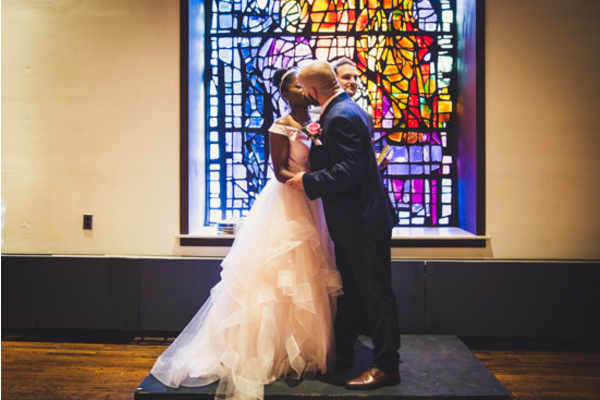 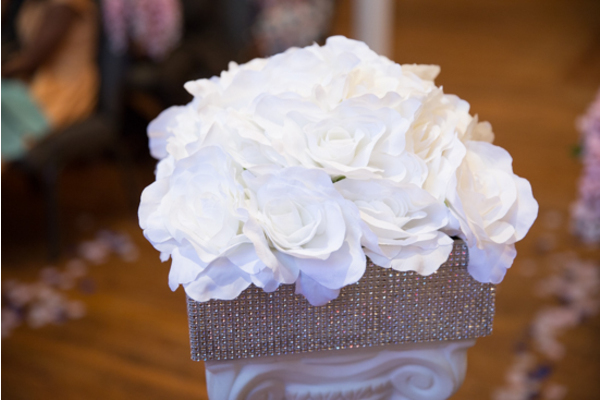 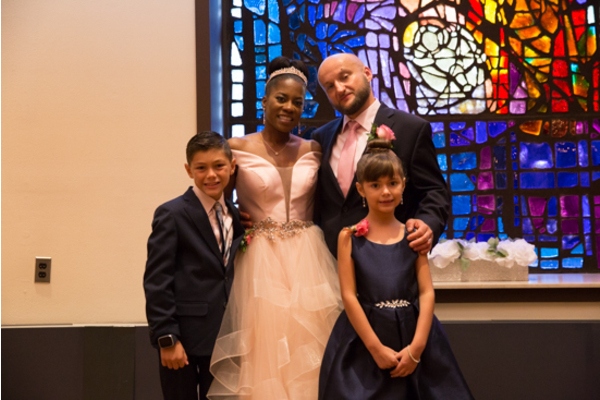 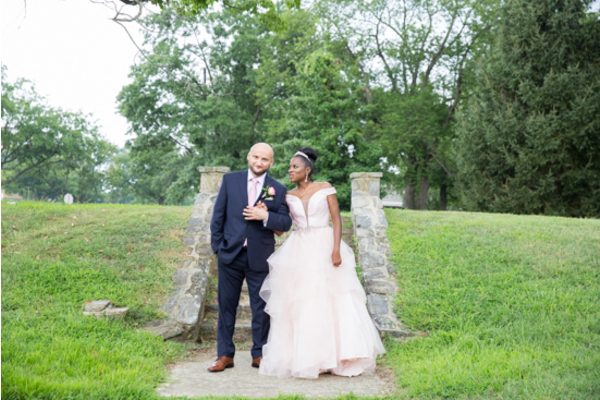 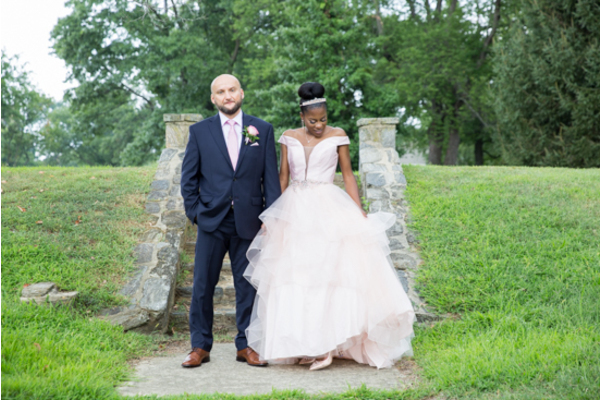 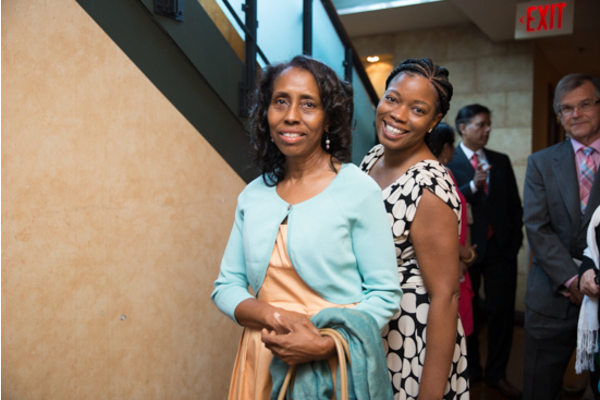 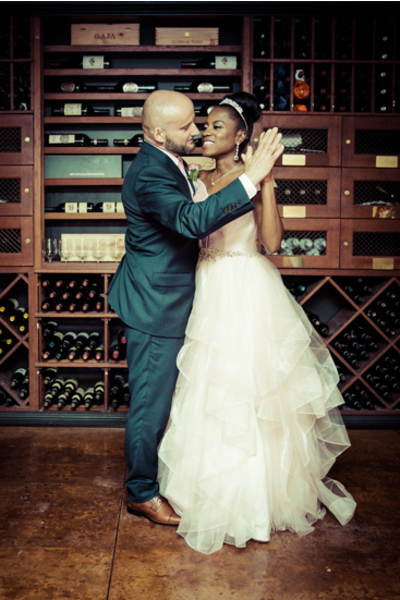 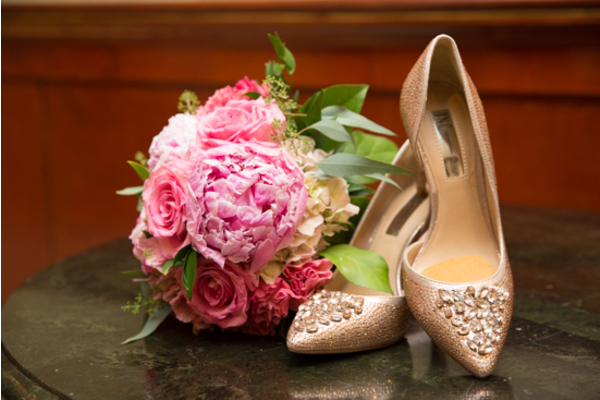 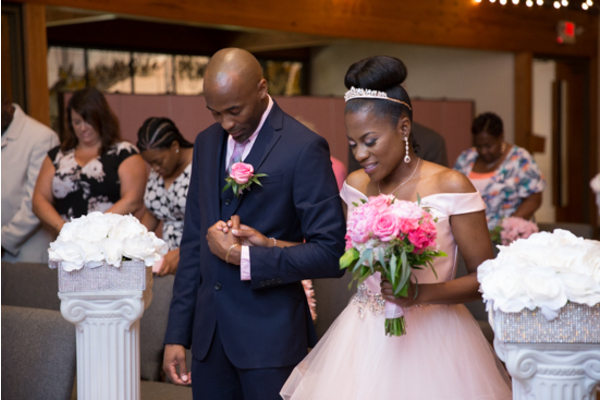 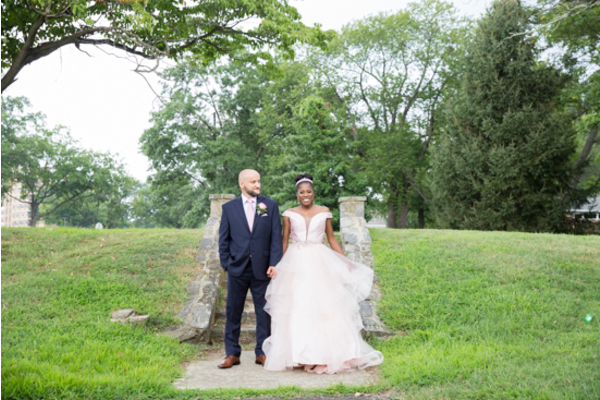 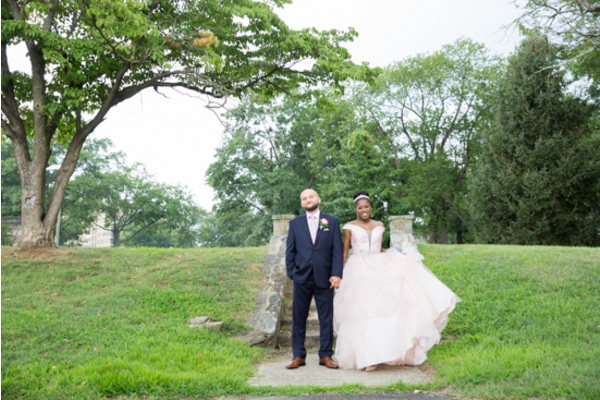 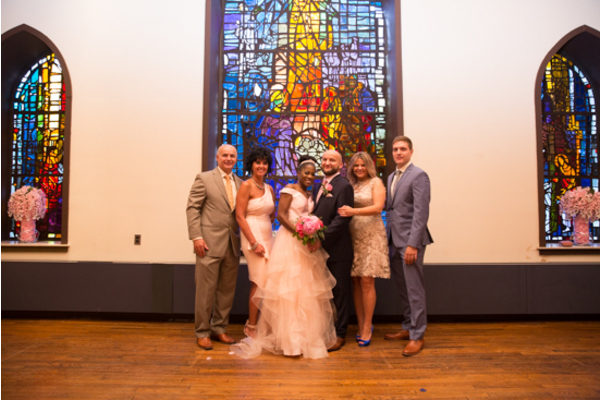 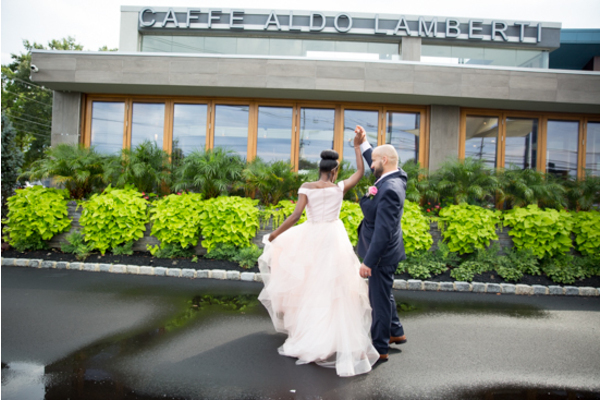 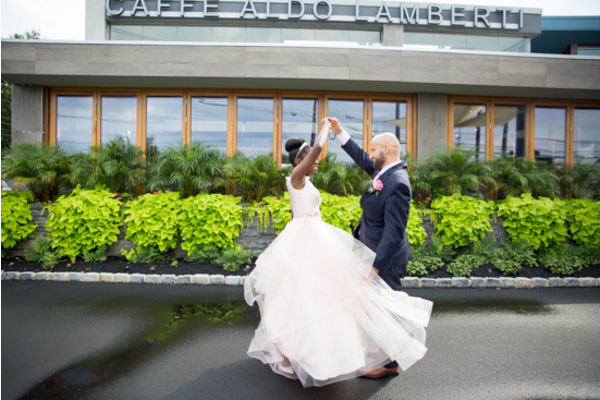 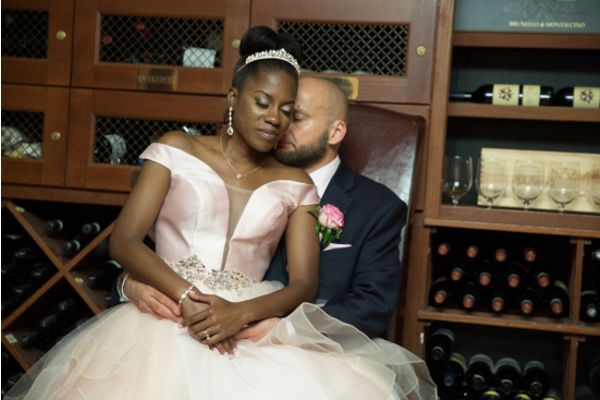 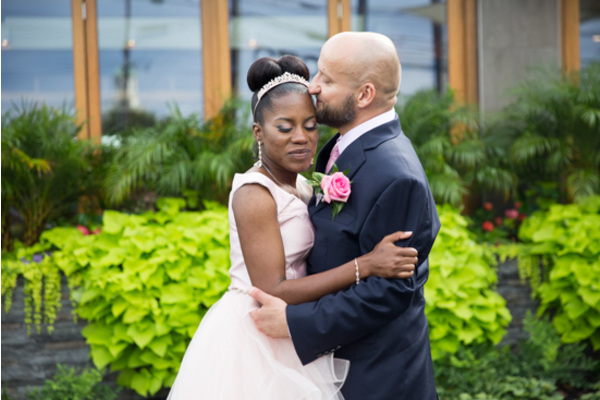 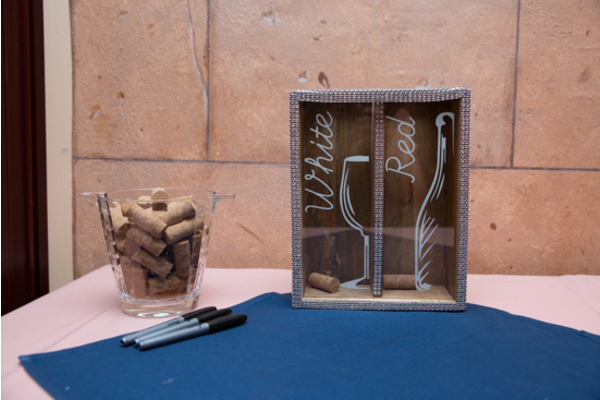 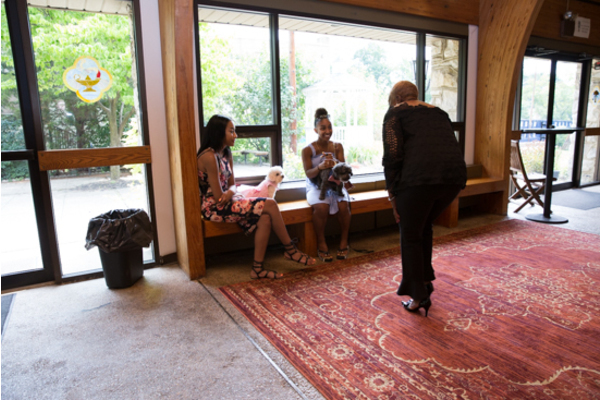 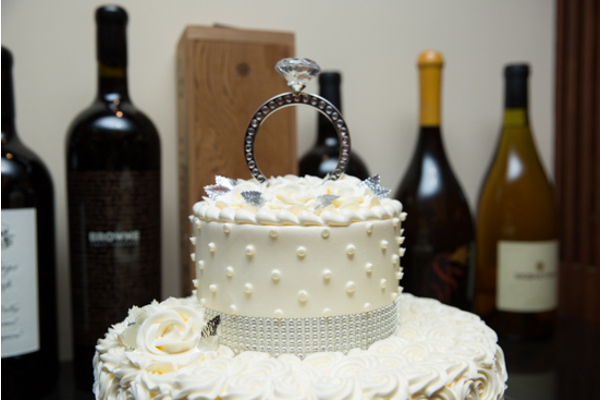 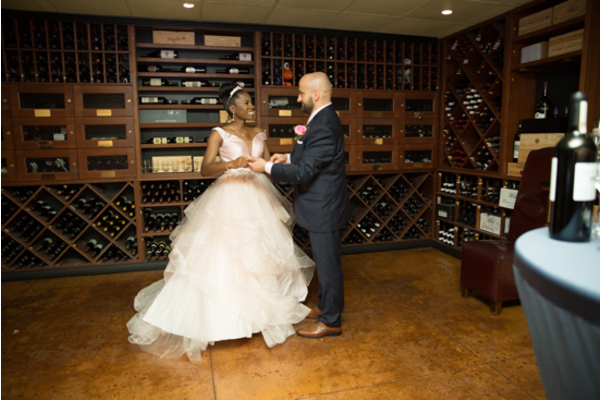 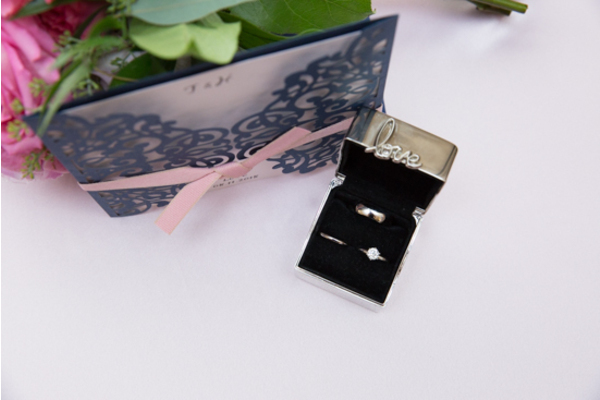 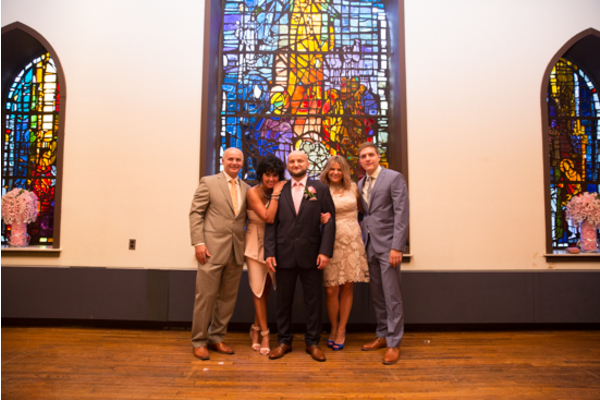 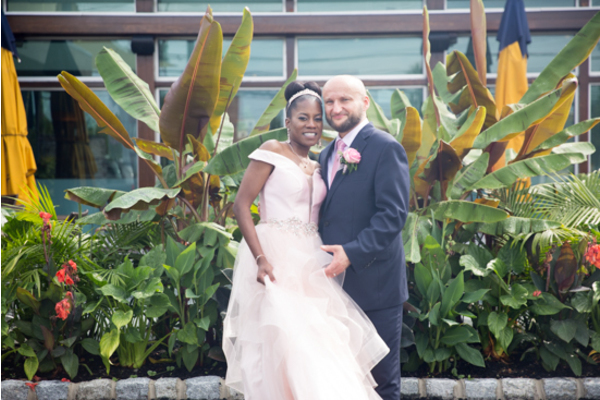 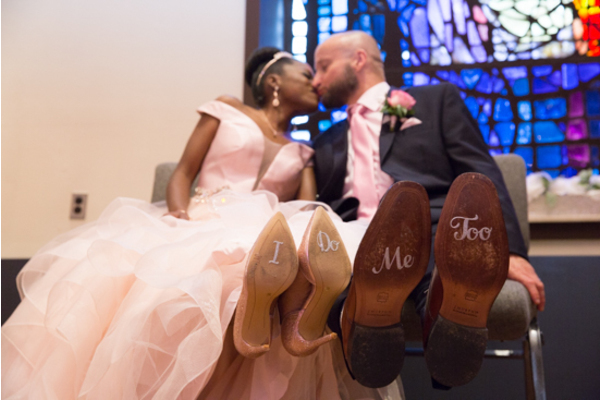 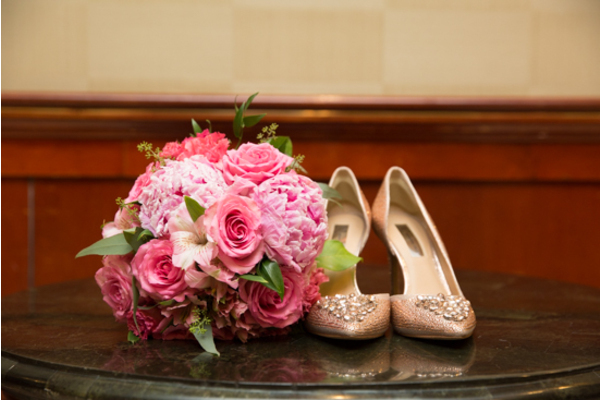 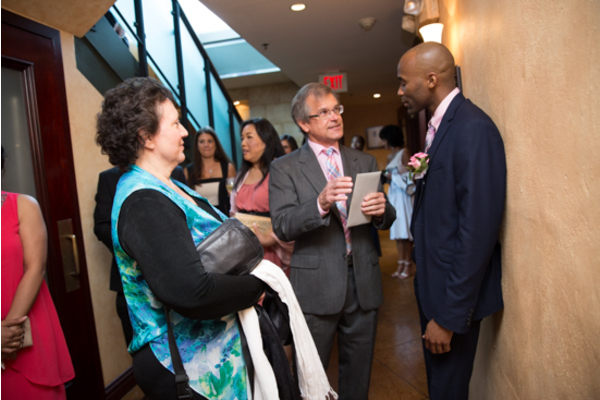 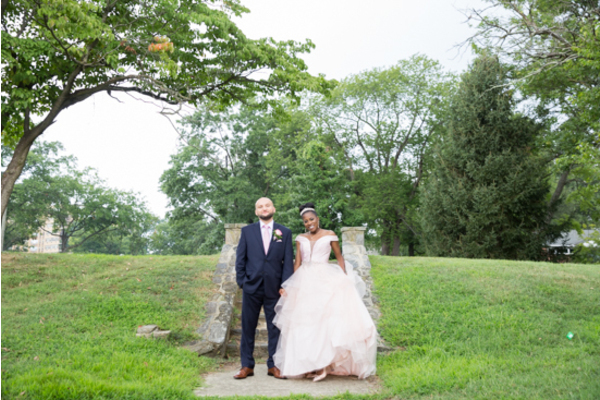 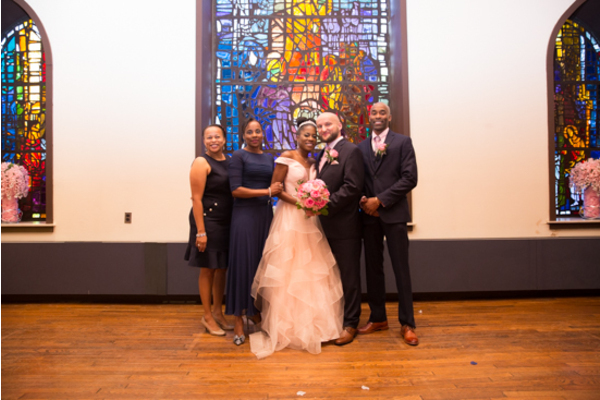 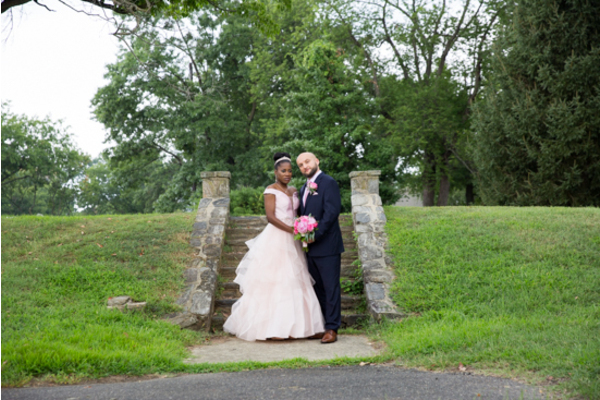 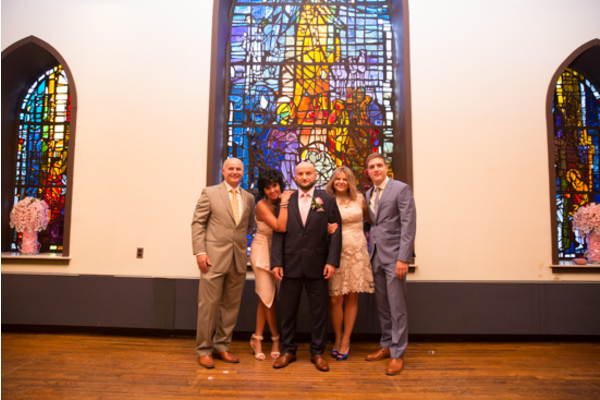 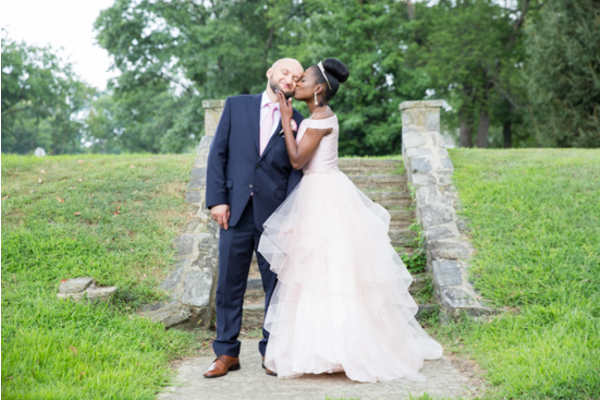 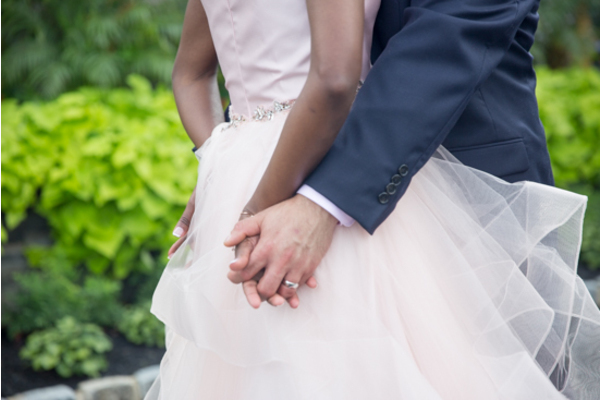 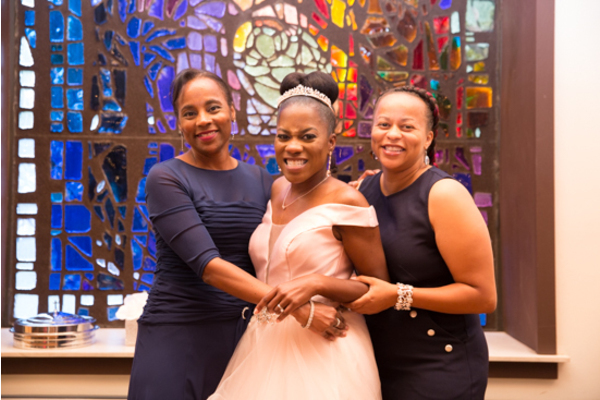 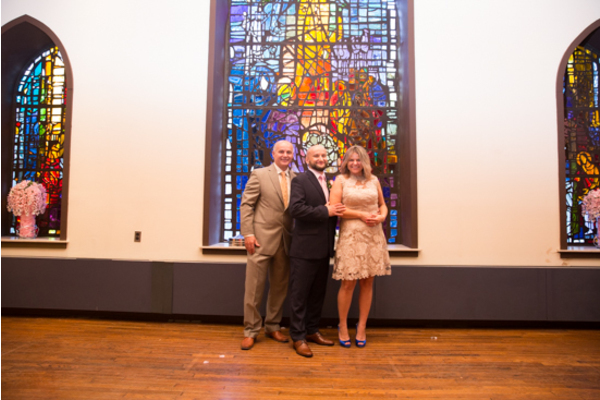 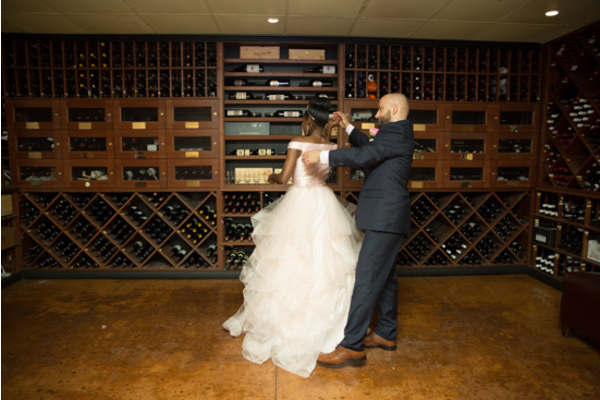 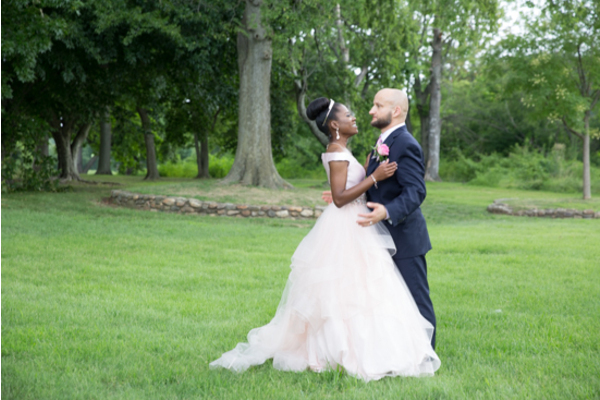 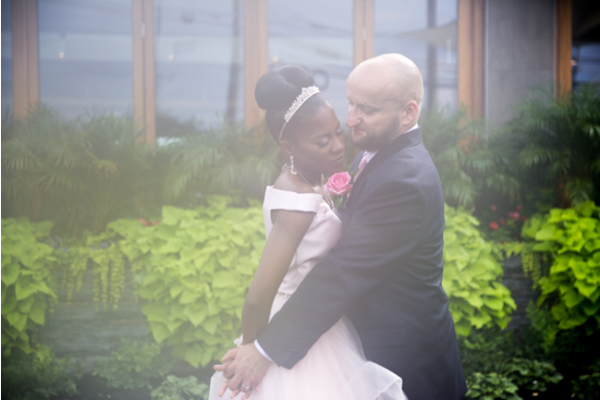 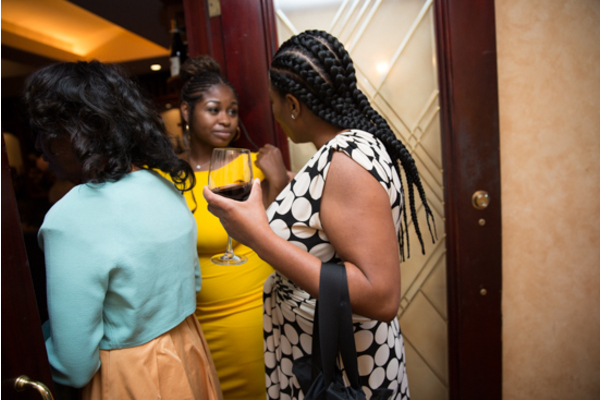 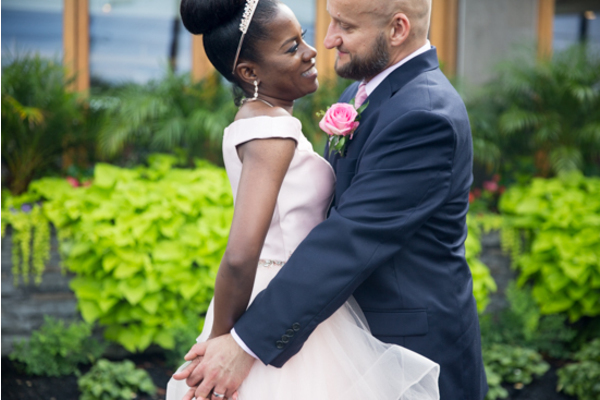 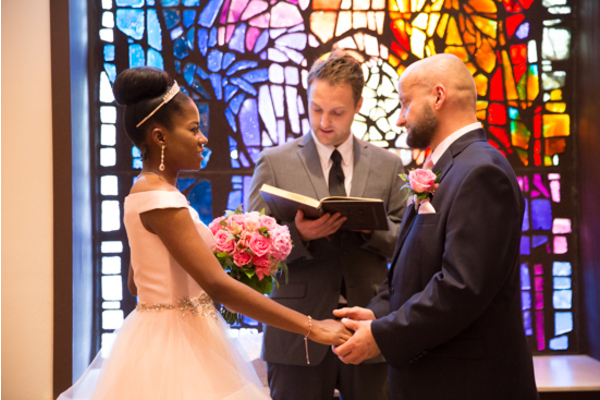 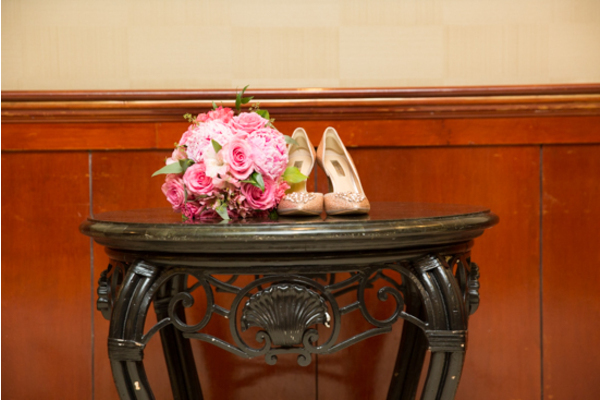 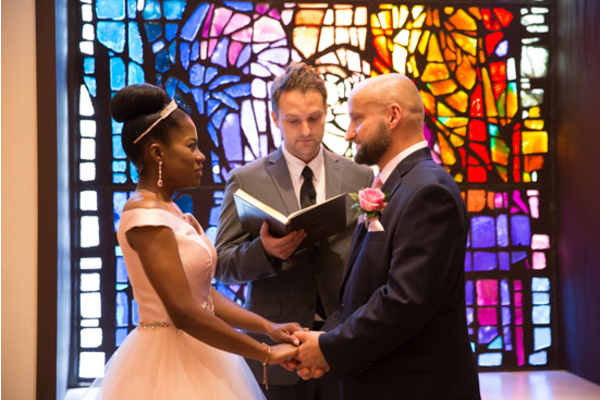 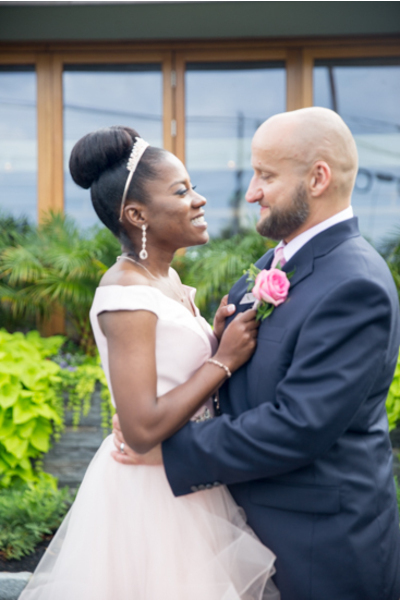 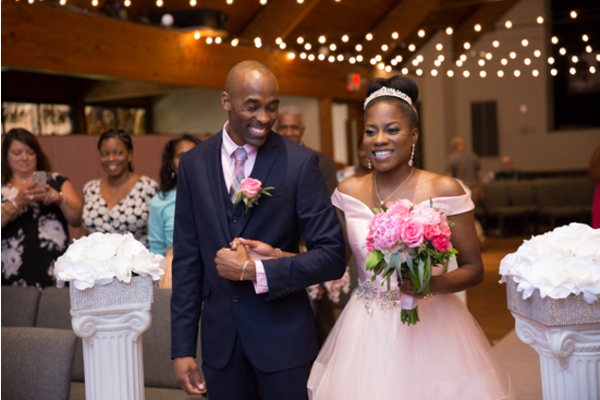 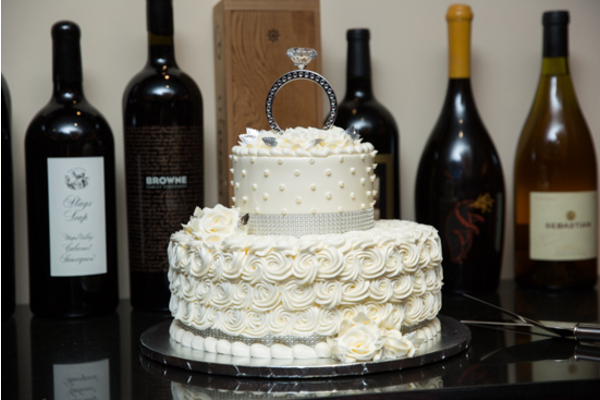 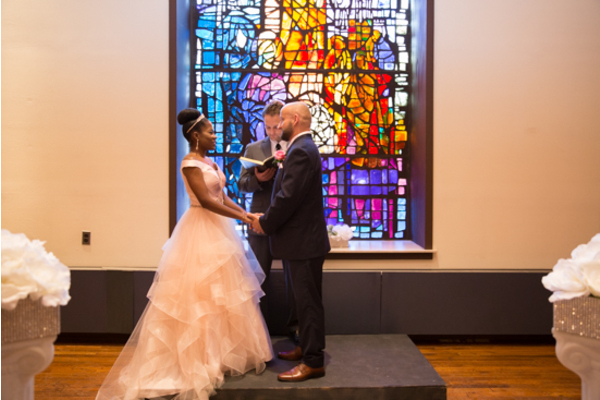 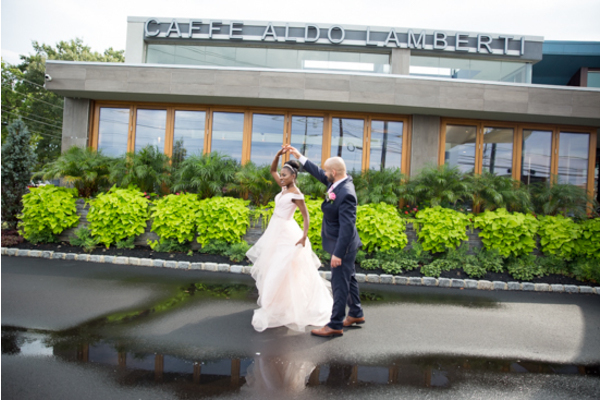 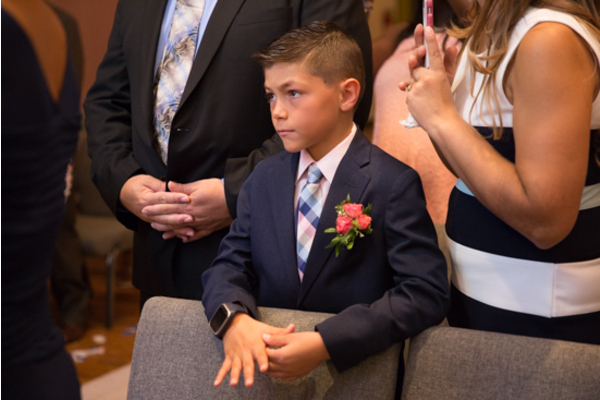 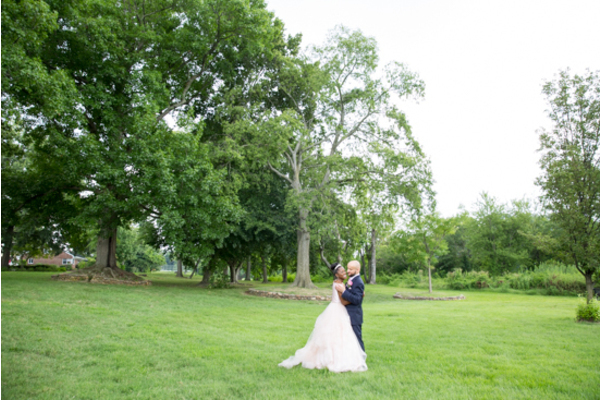 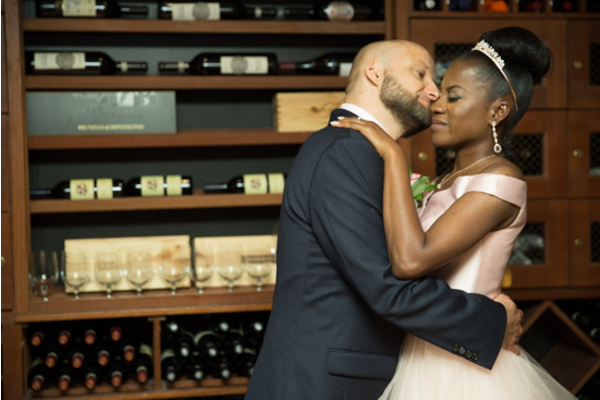 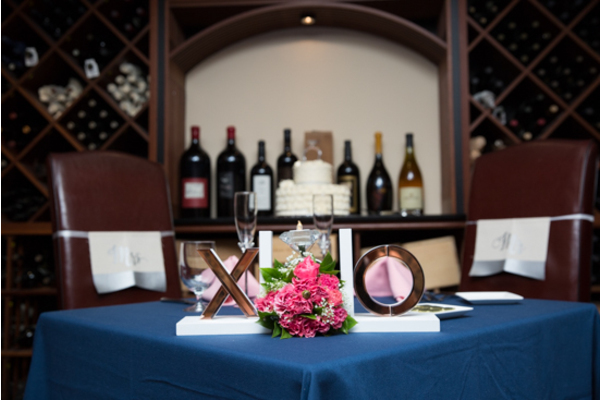 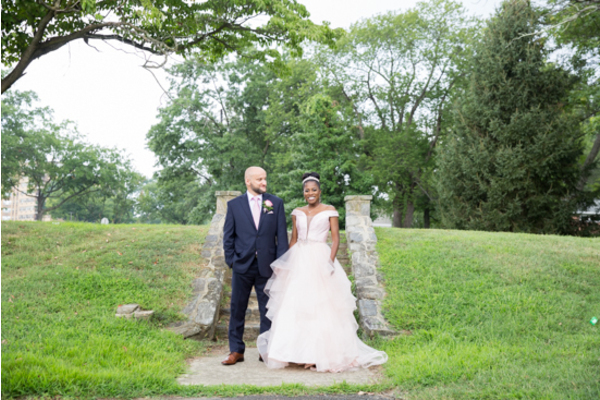 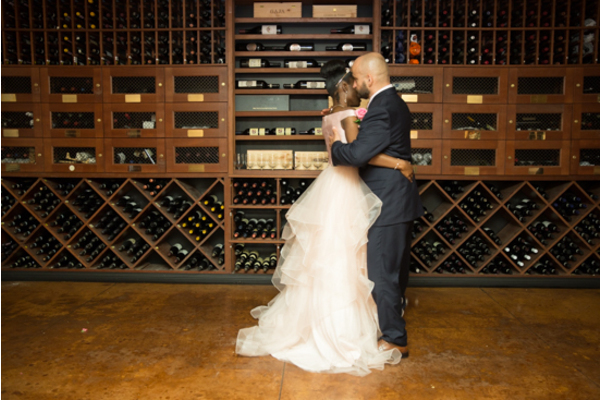 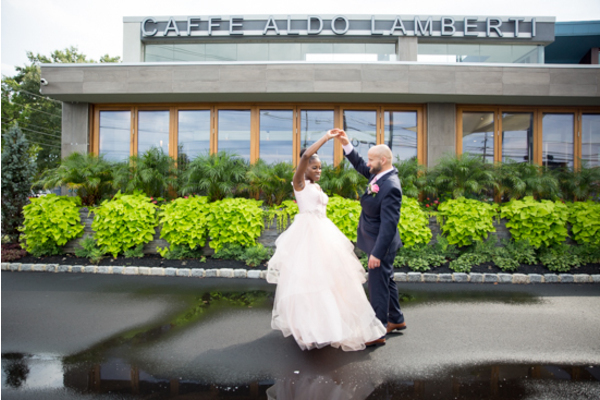 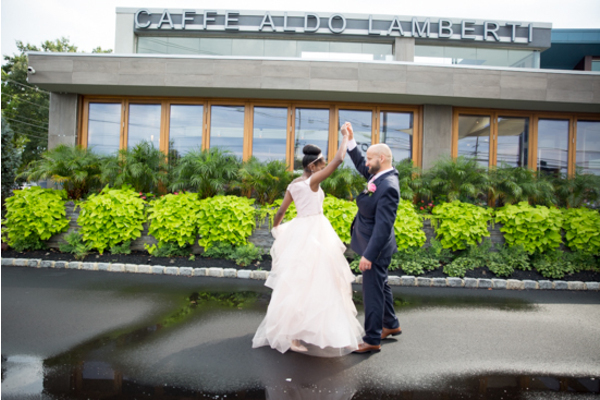 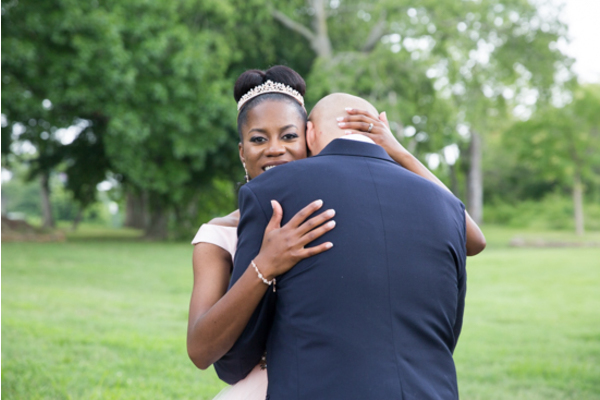 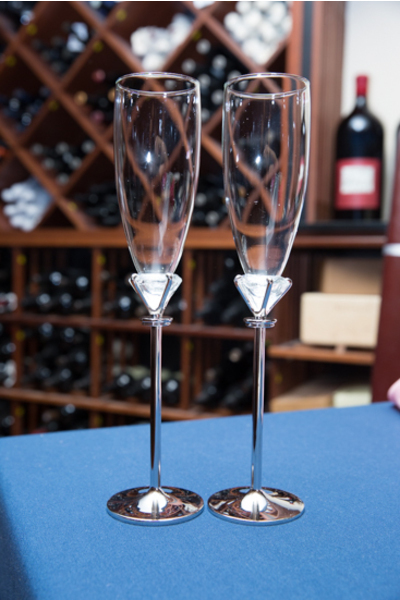 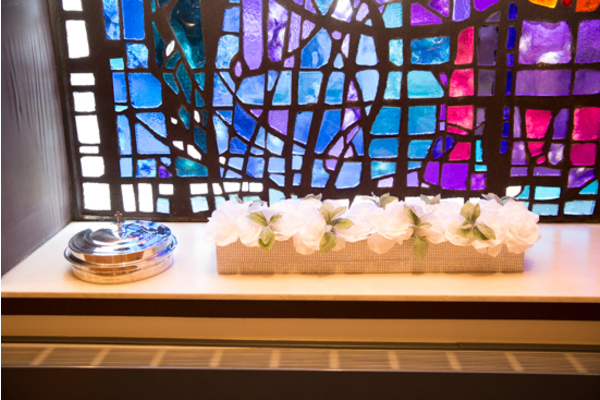 Every beautiful moment of the day was perfectly captured by our NJ Wedding Photographer. 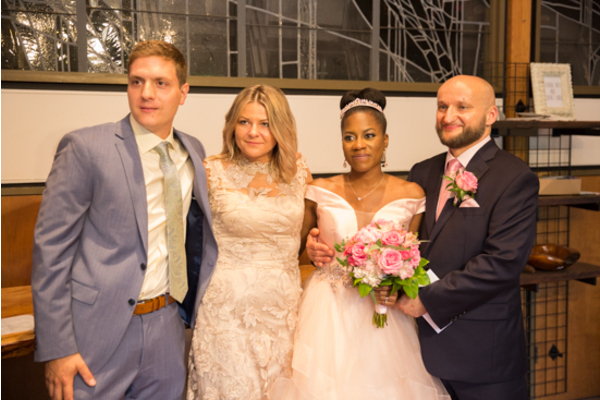 Congratulations, again to the happy couple. 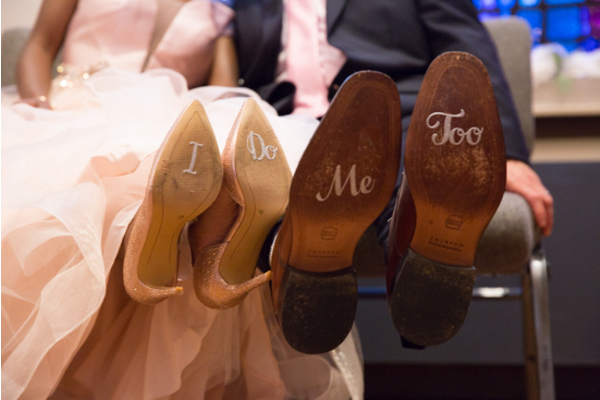 Let the wedding bells ring forever!